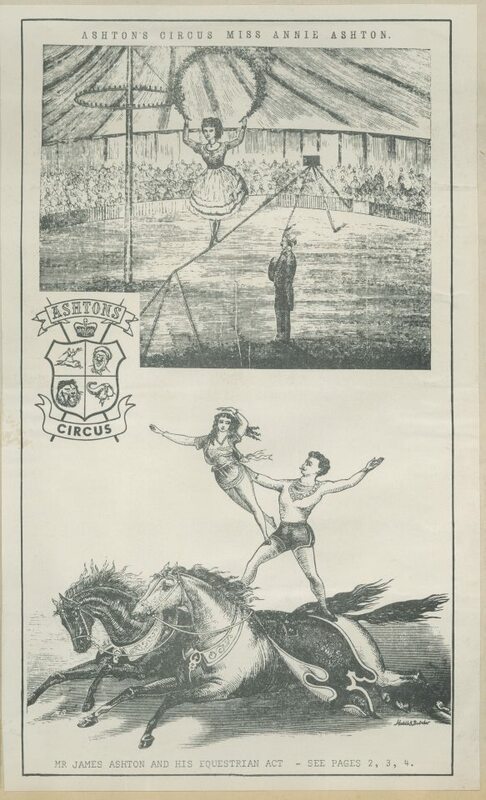 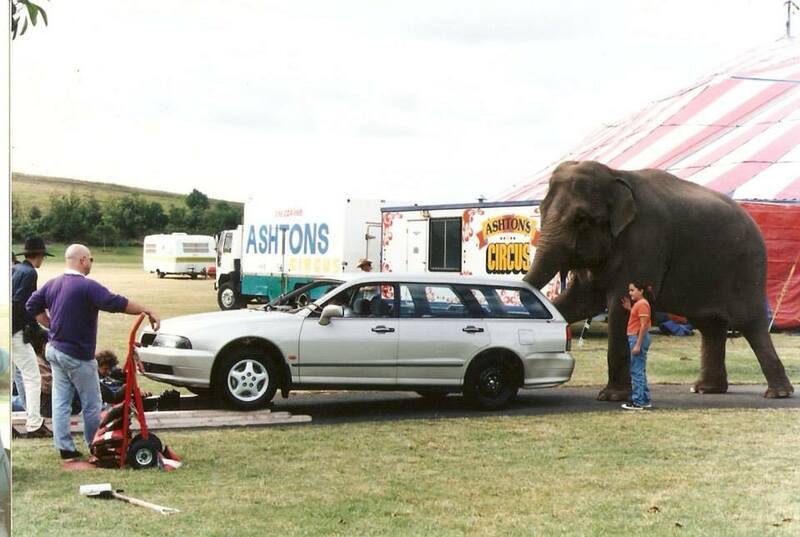 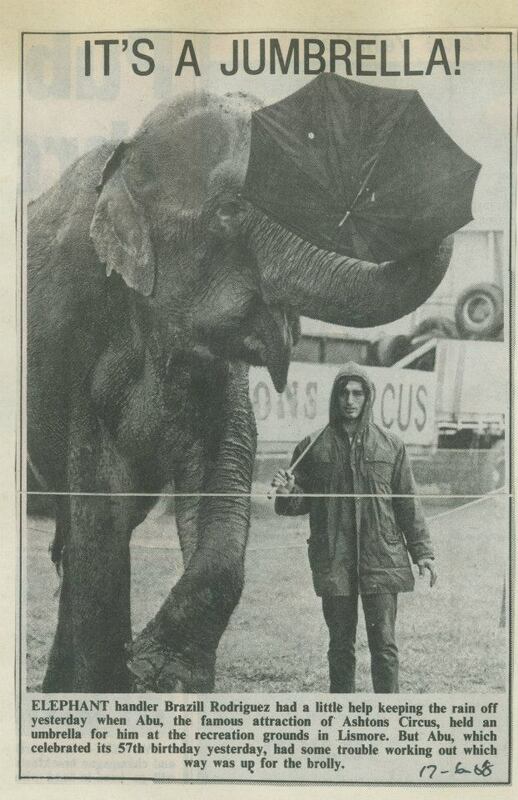 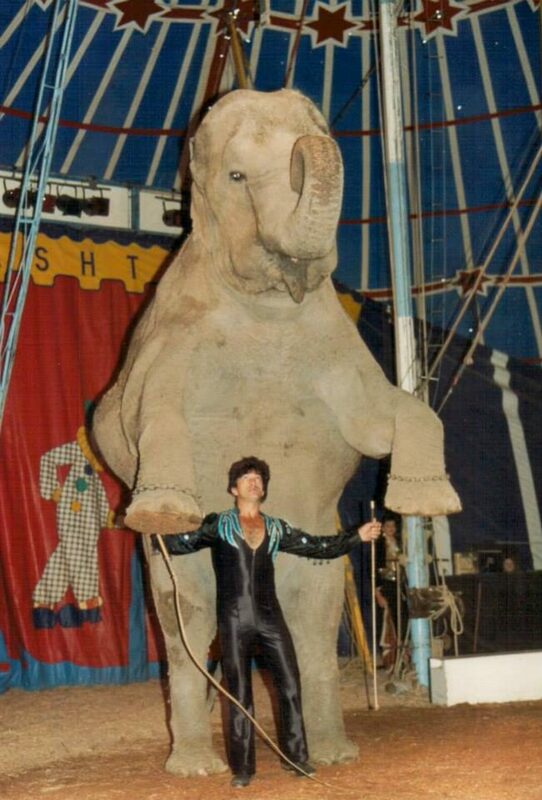 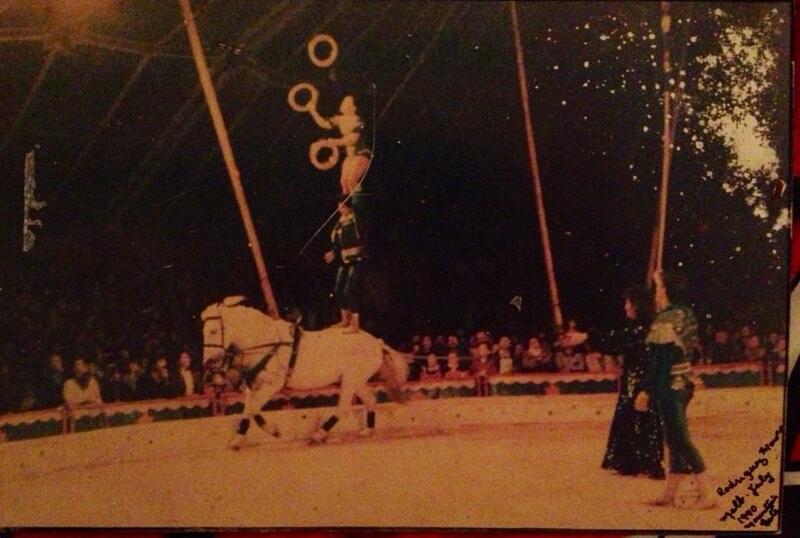 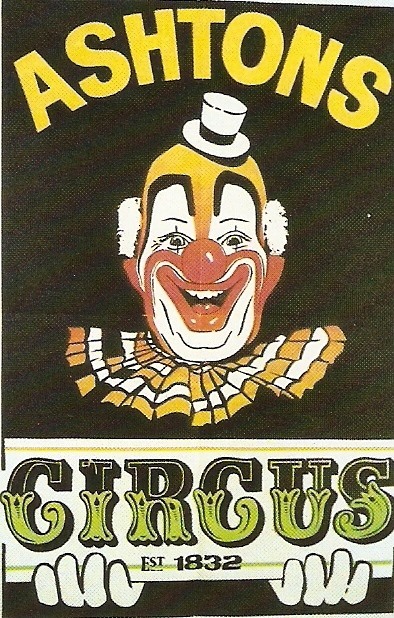 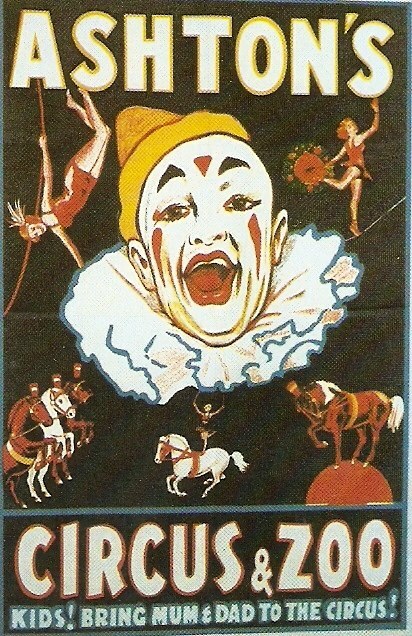 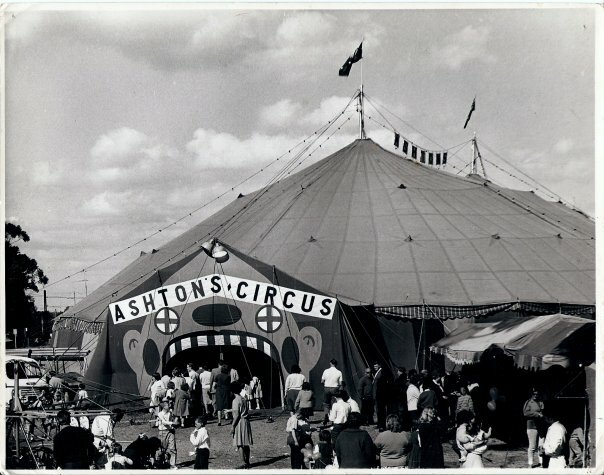 James Henry Ashton founded Ashton Circus in the early 1800s, well before Federation. 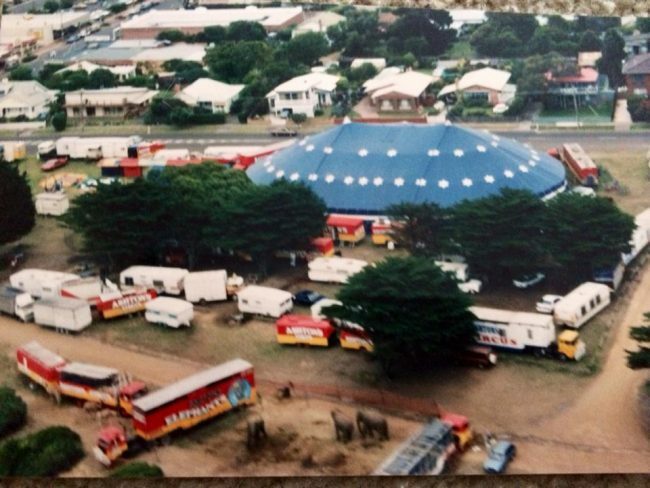 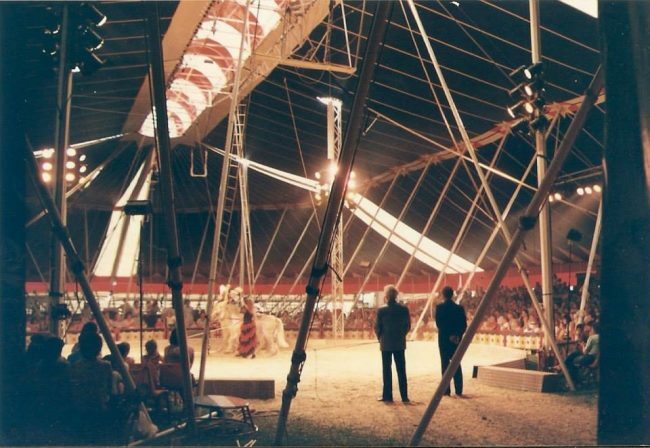 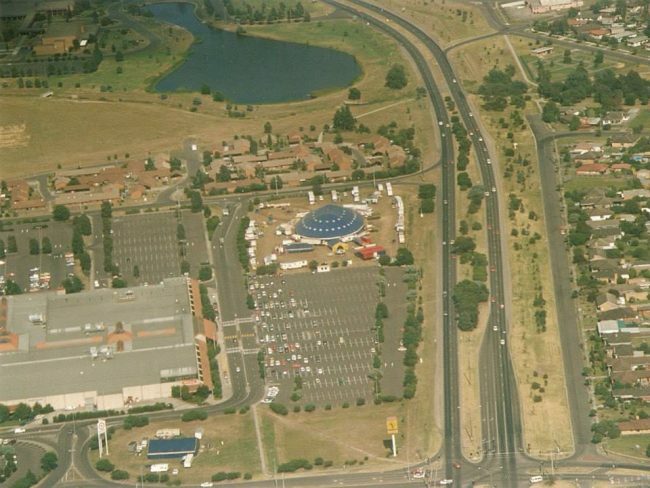 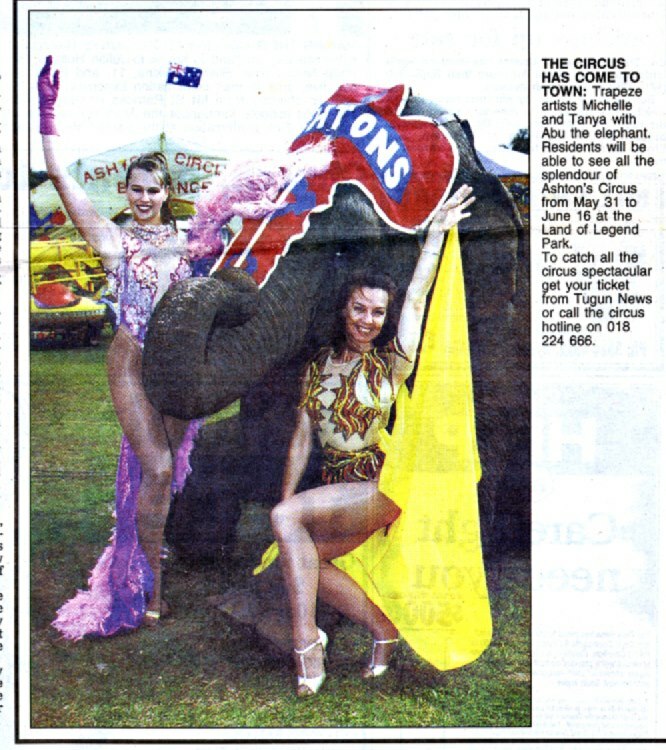 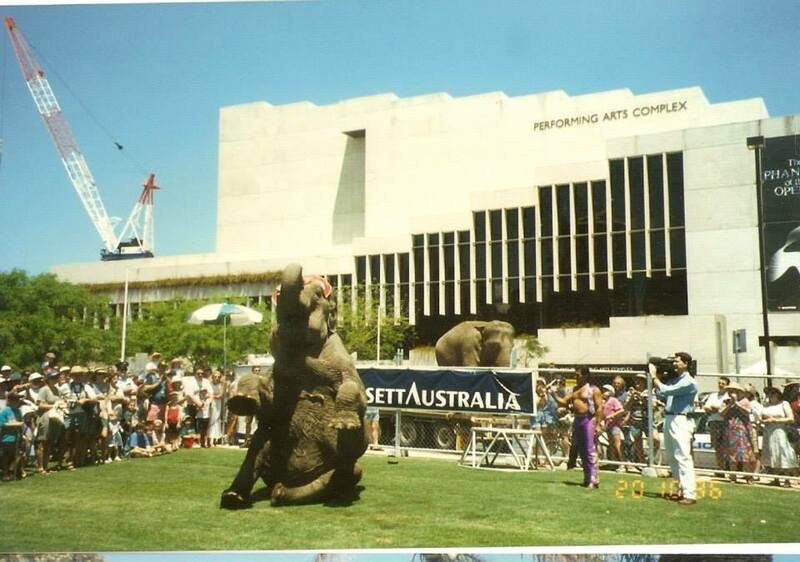 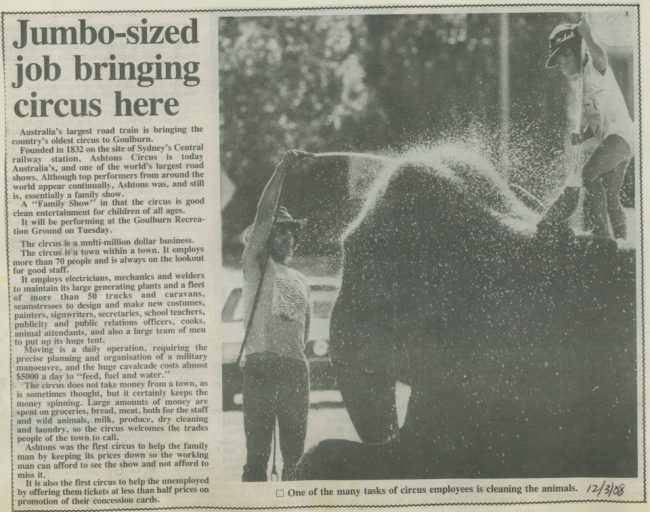 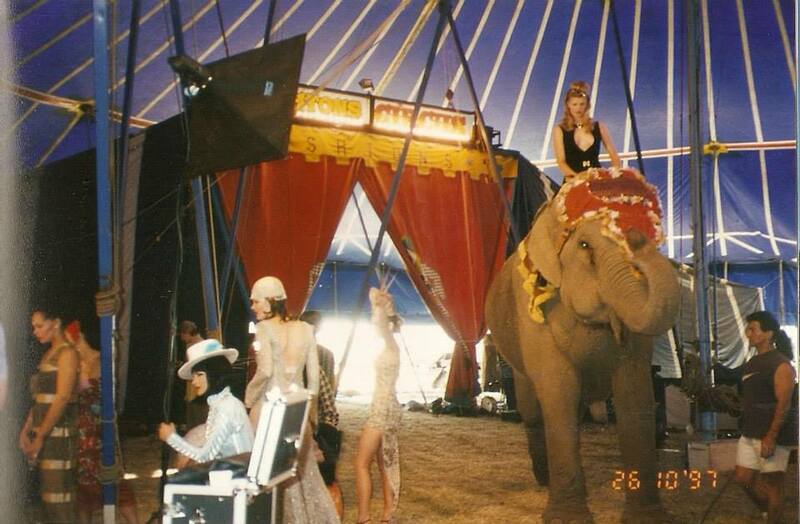 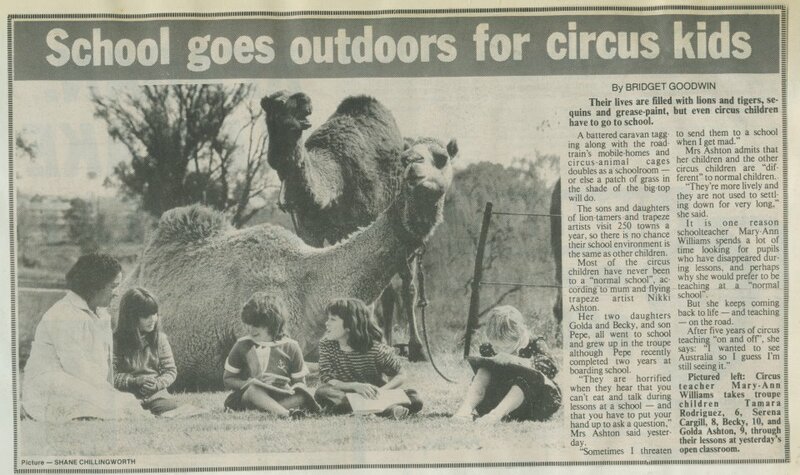 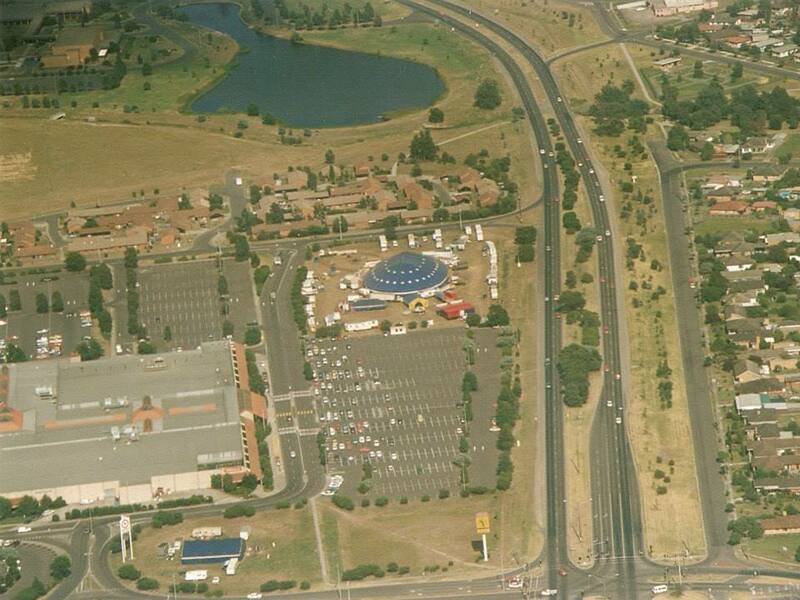 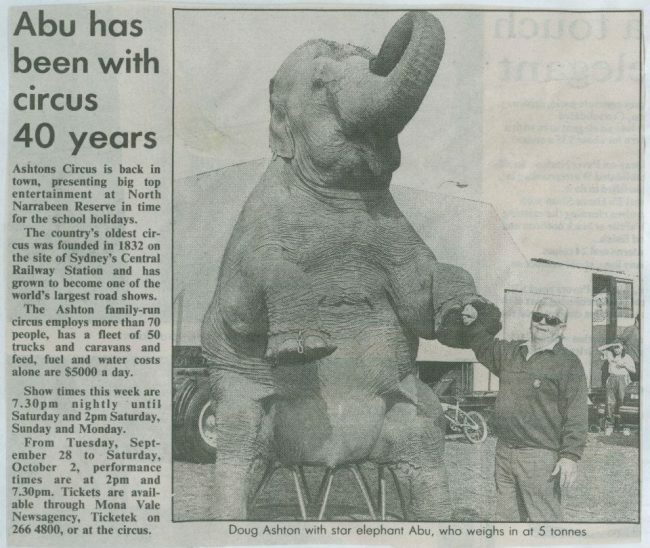 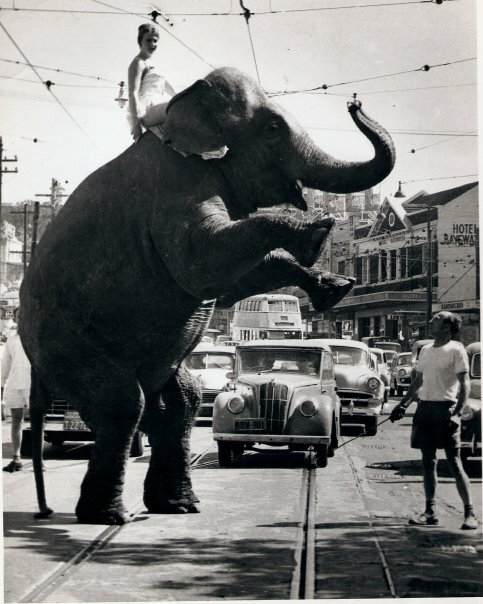 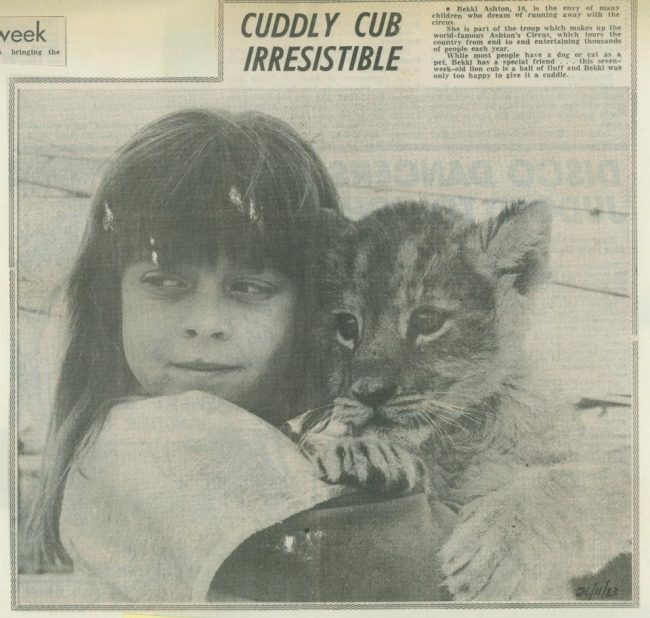 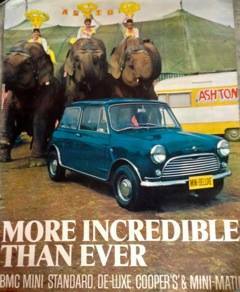 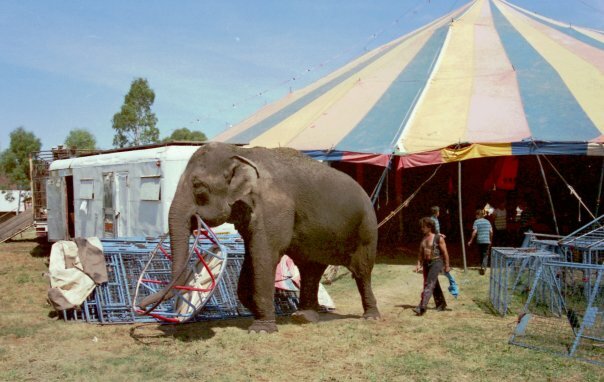 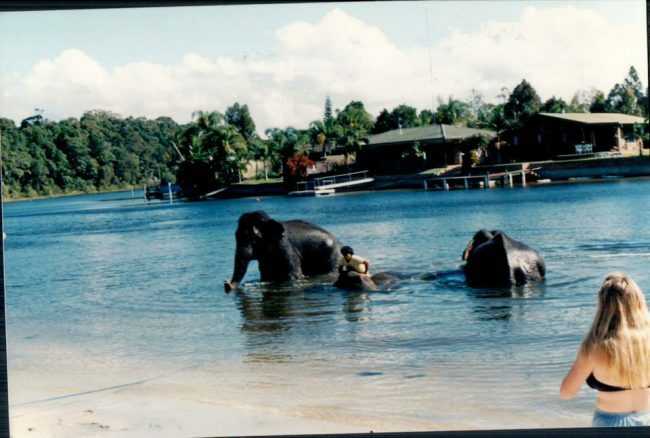 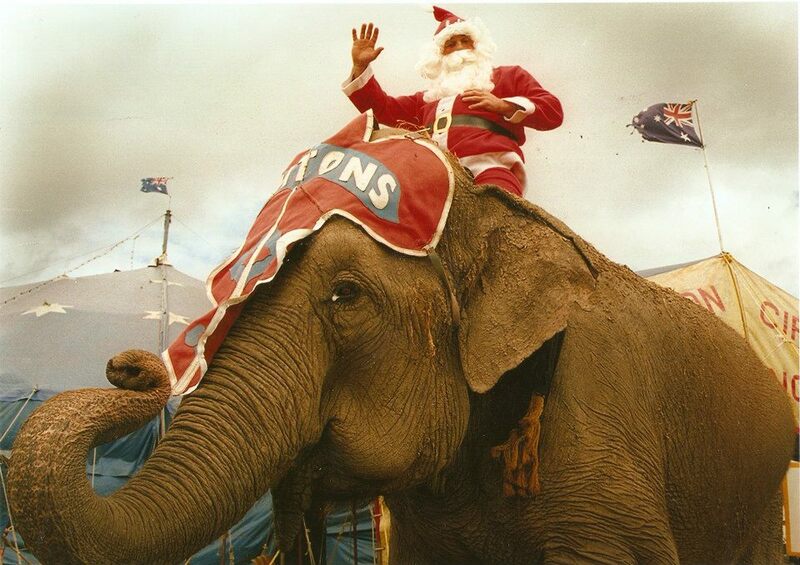 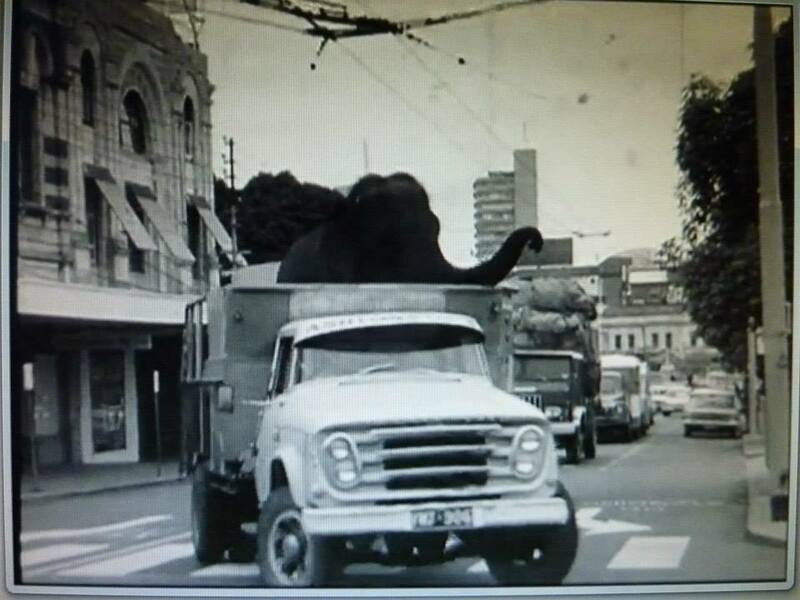 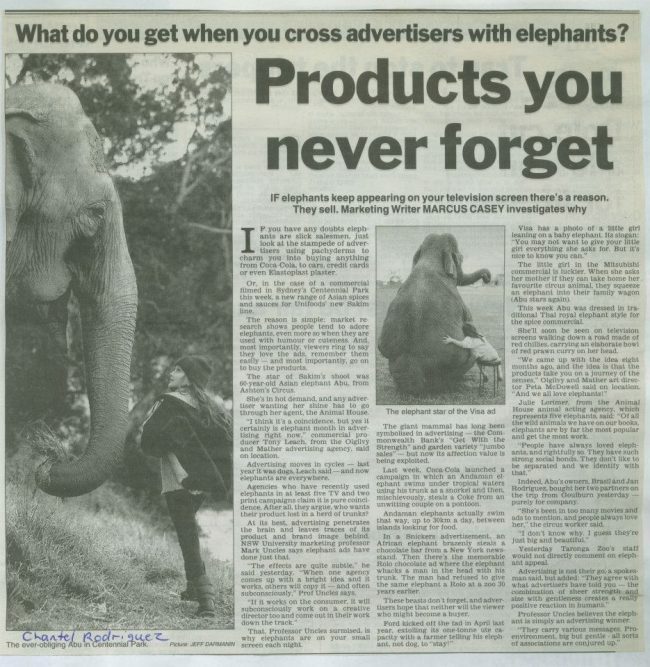 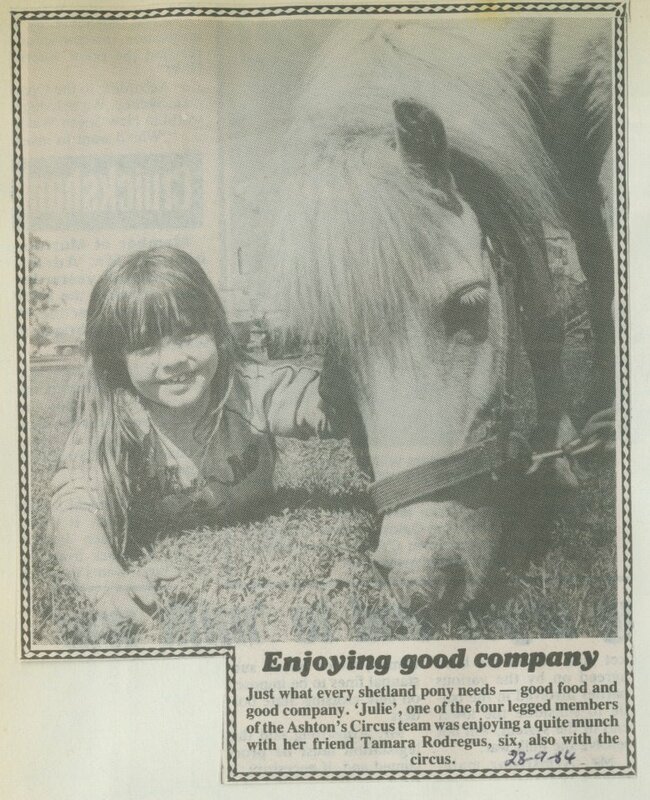 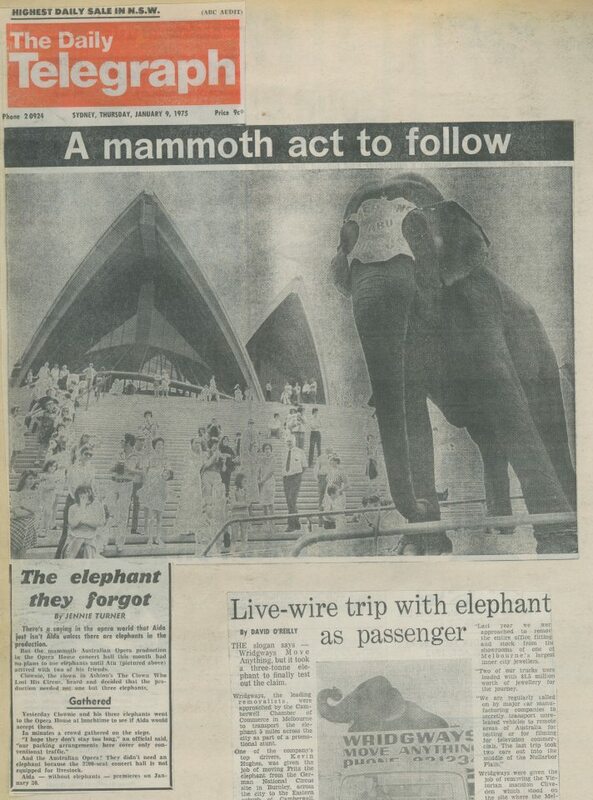 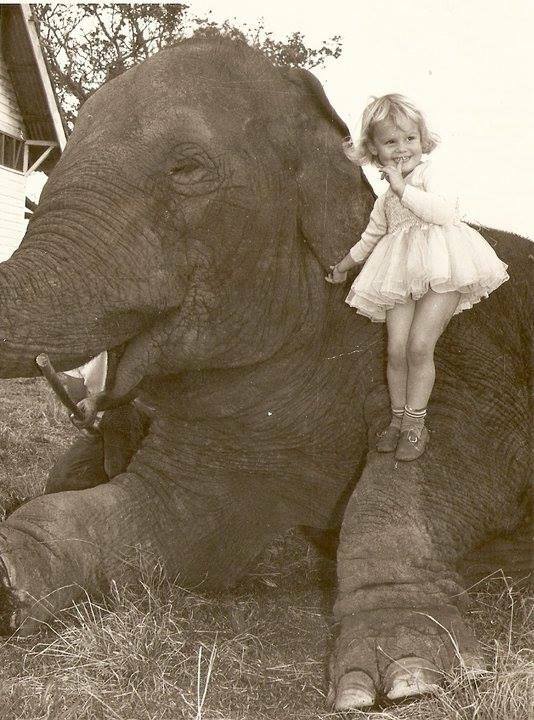 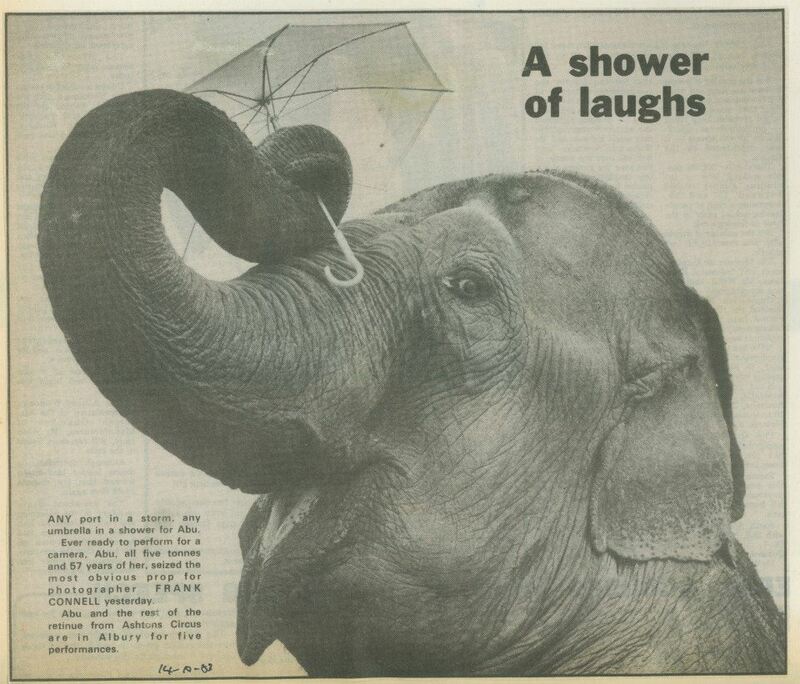 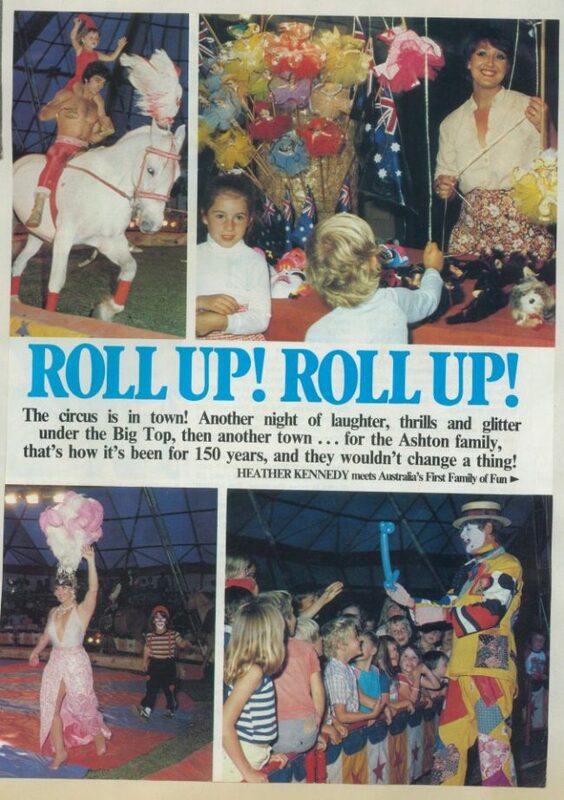 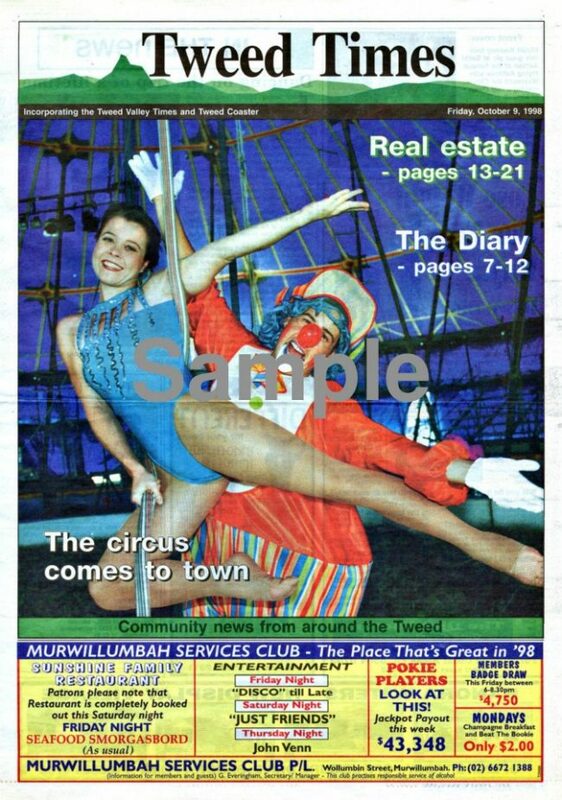 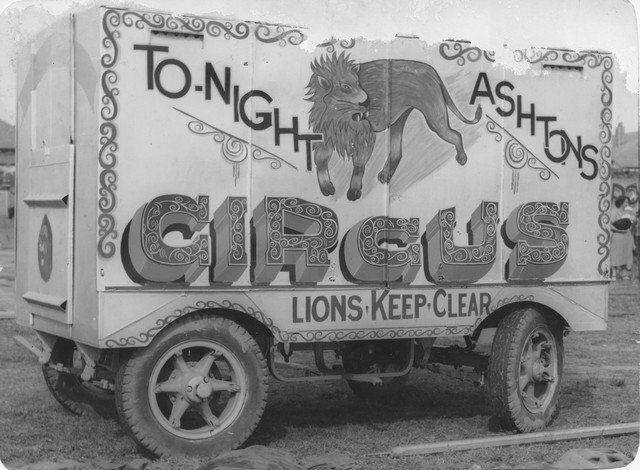 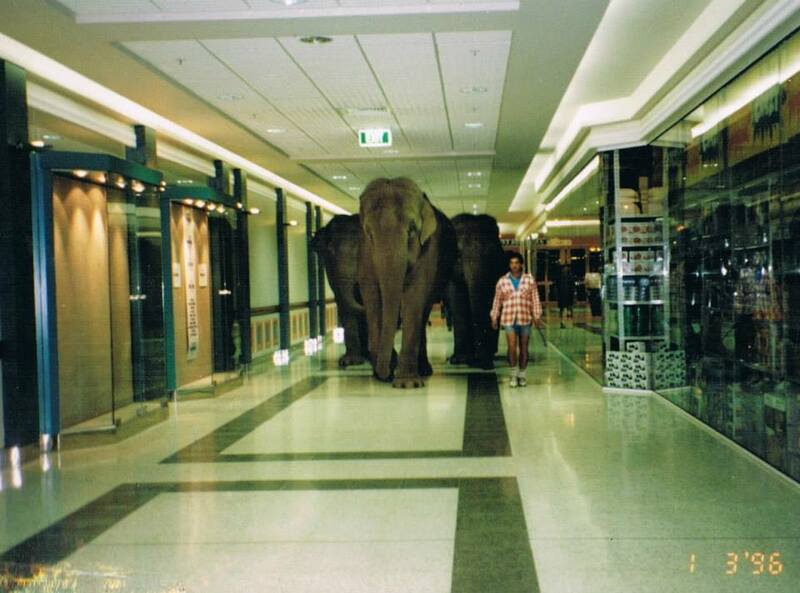 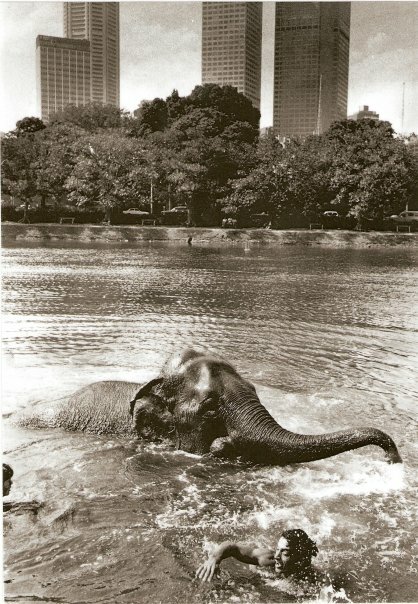 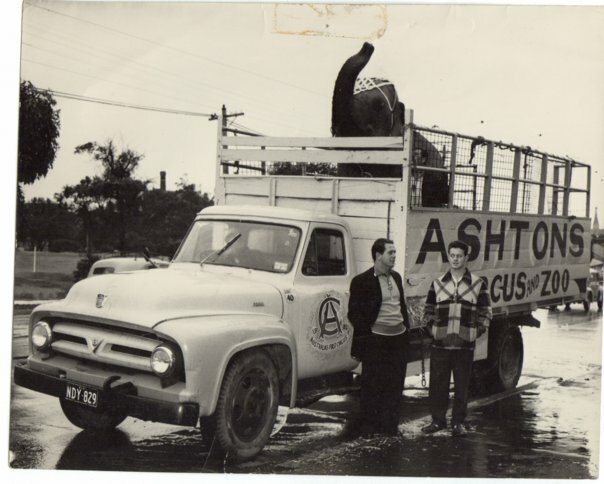 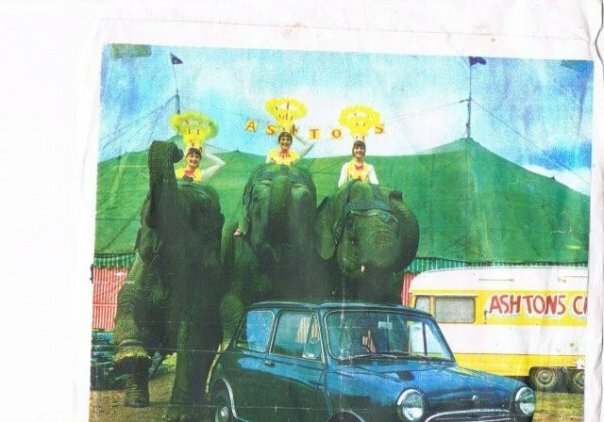 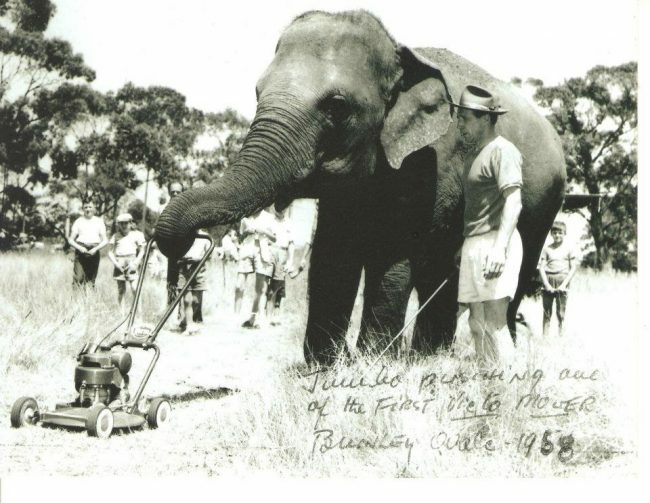 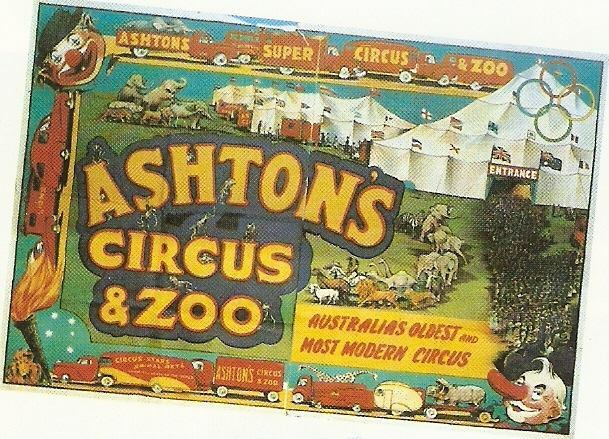 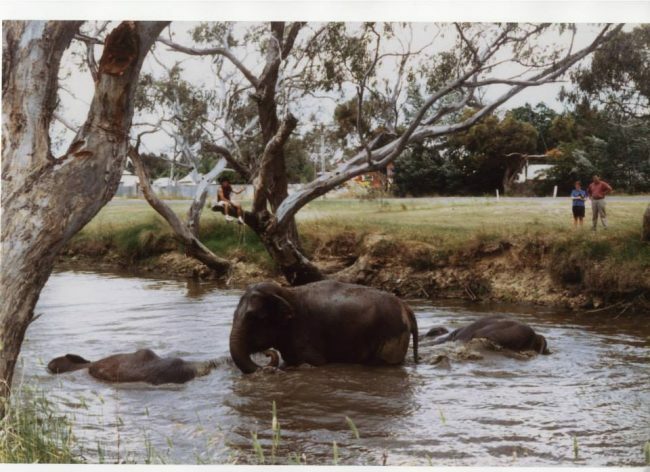 For over 160 years Ashton Circus has travelled to both regional towns and big cities, bringing joy to the people of Australia. 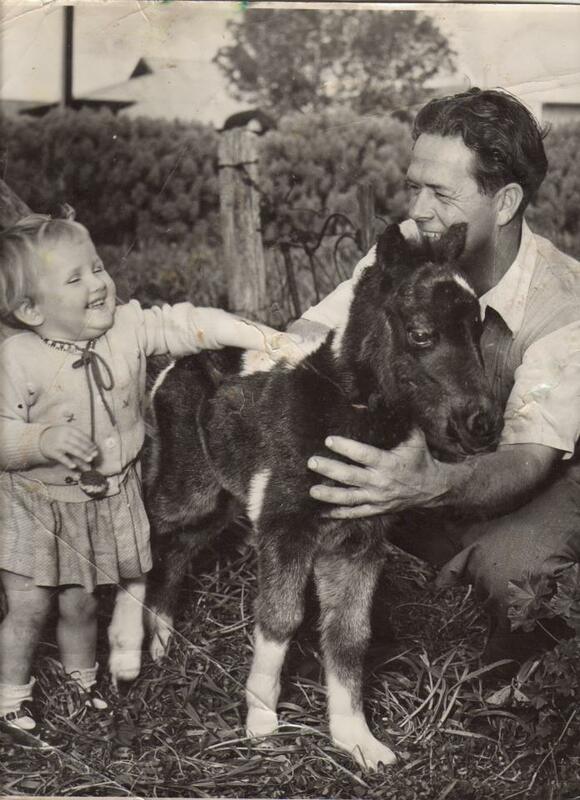 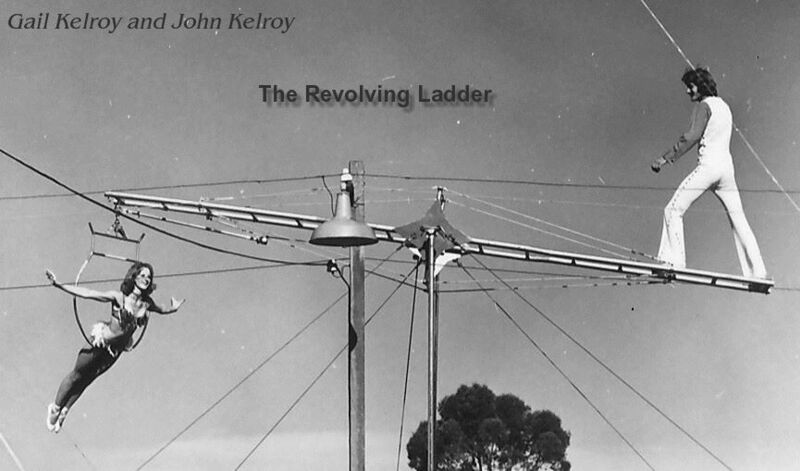 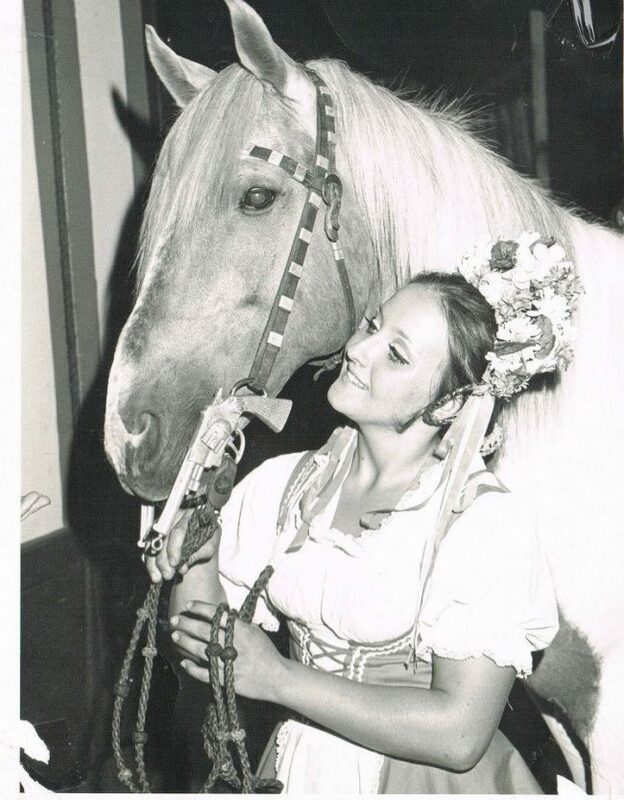 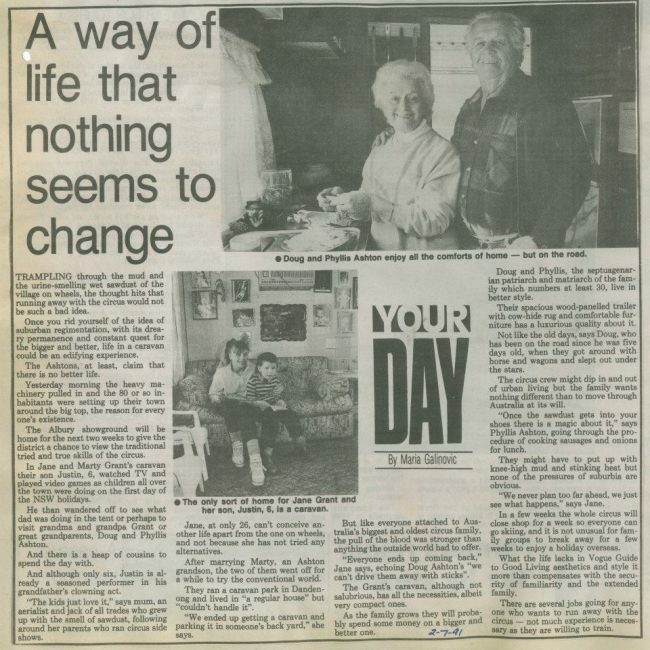 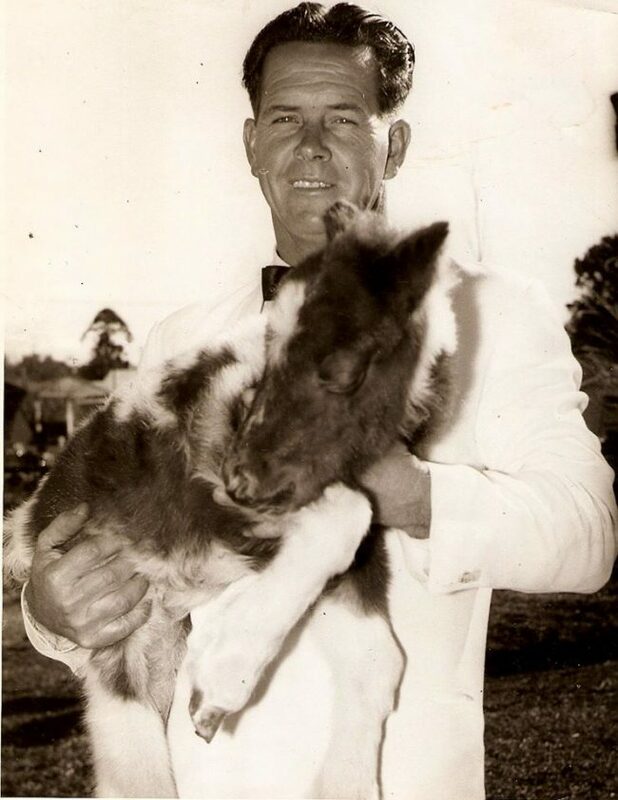 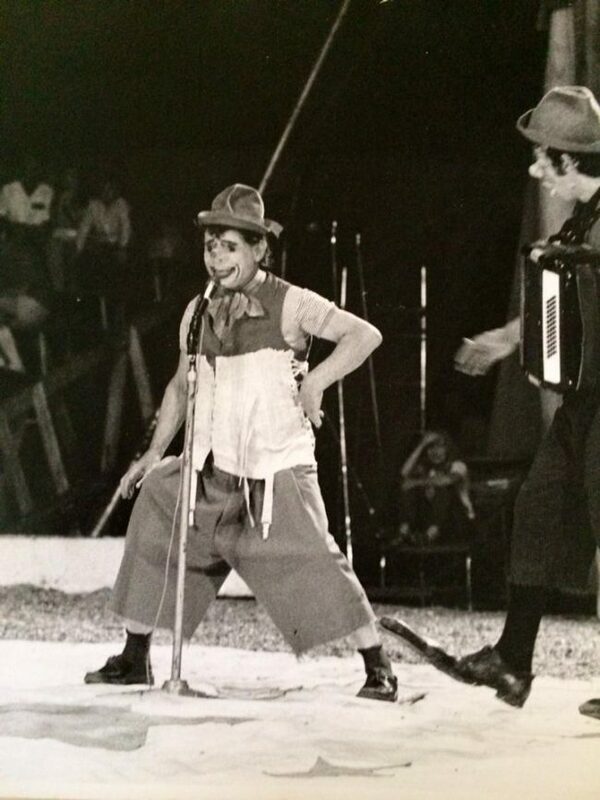 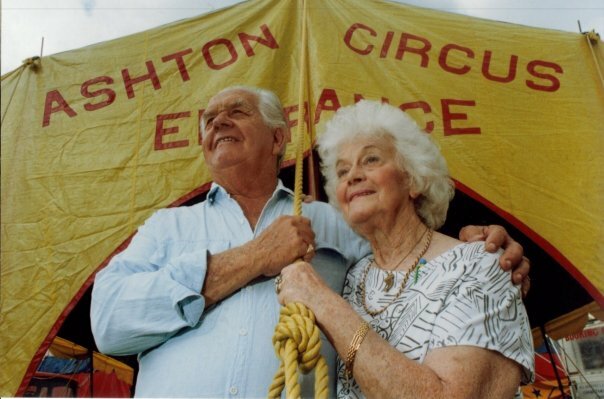 Generations of the Ashtons crossed desserts and flooded rivers, drove over snow-covered mountains, fended off bushrangers, and even ventured where there were no roads to reach the communities that have loved and inspired our family of performers for over a century. 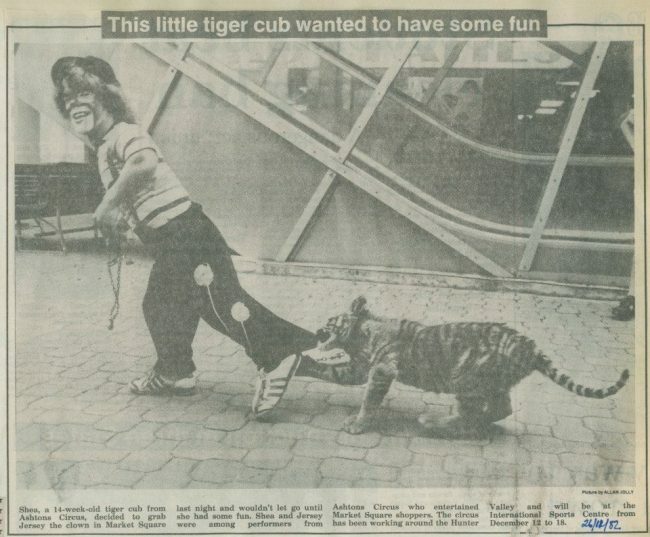 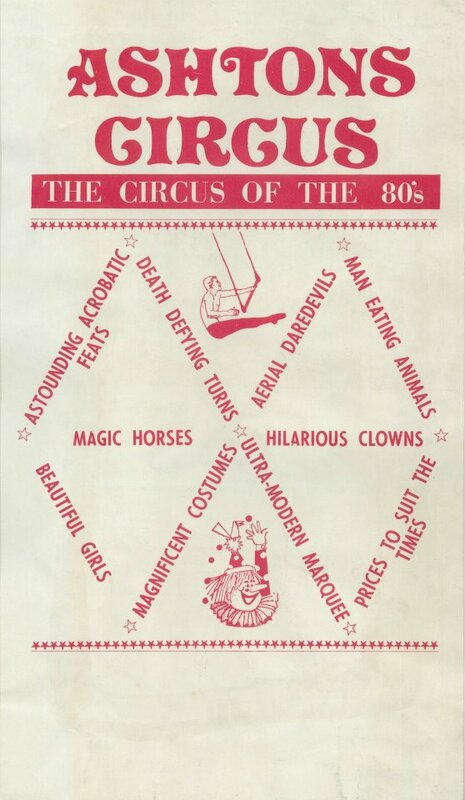 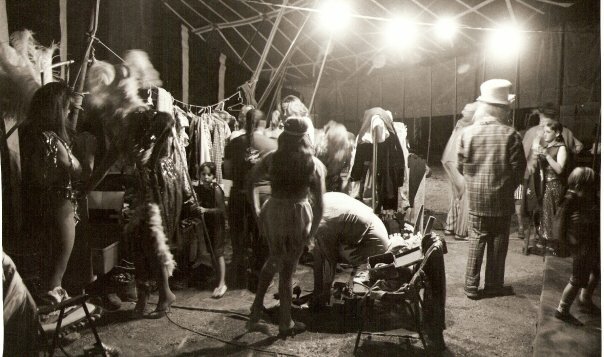 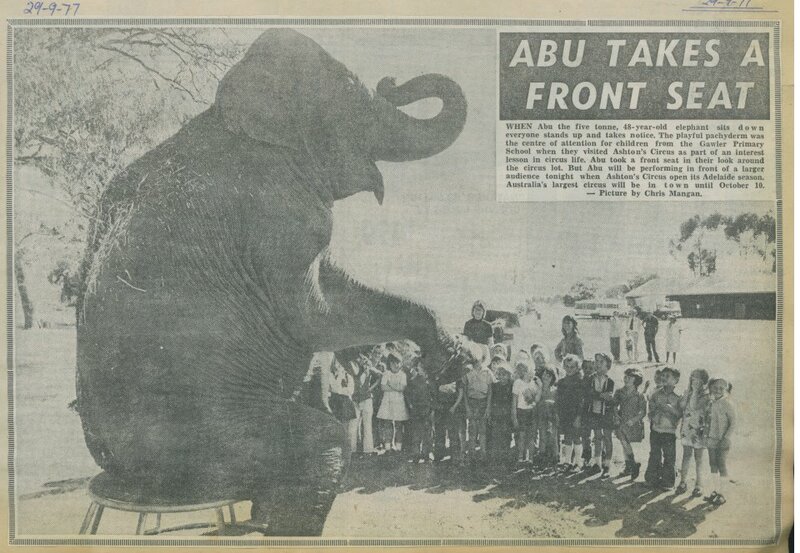 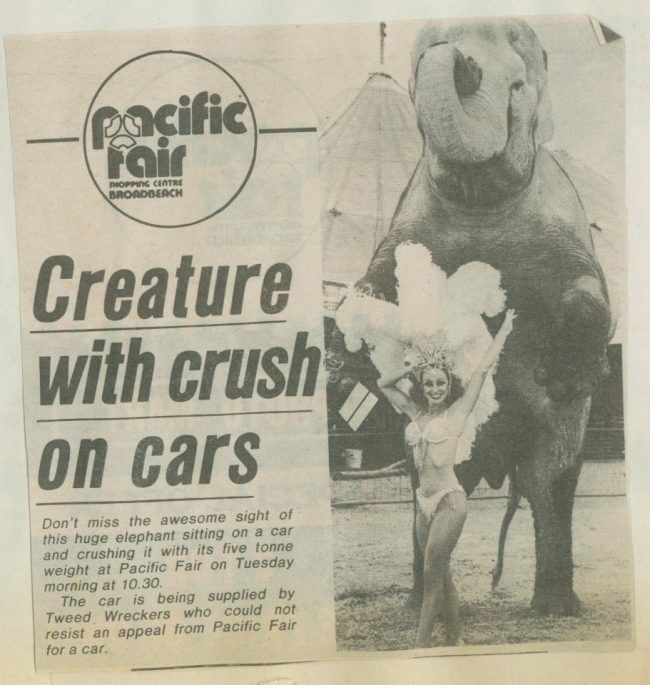 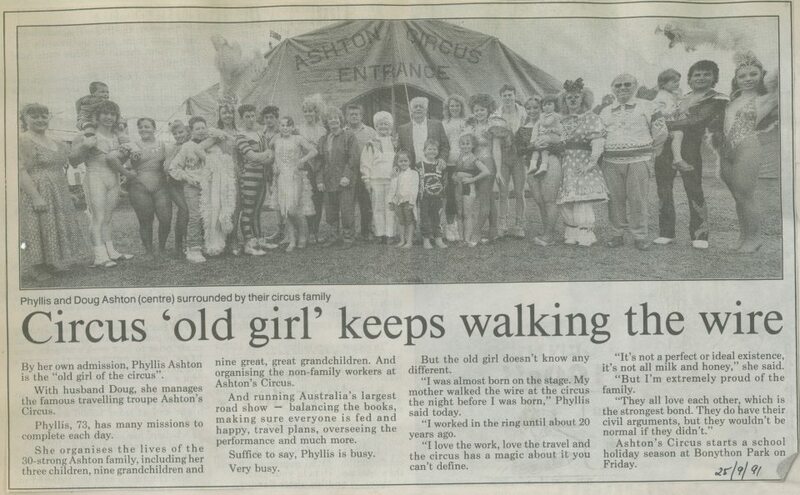 People came from all around to enjoy Ashton Circus. 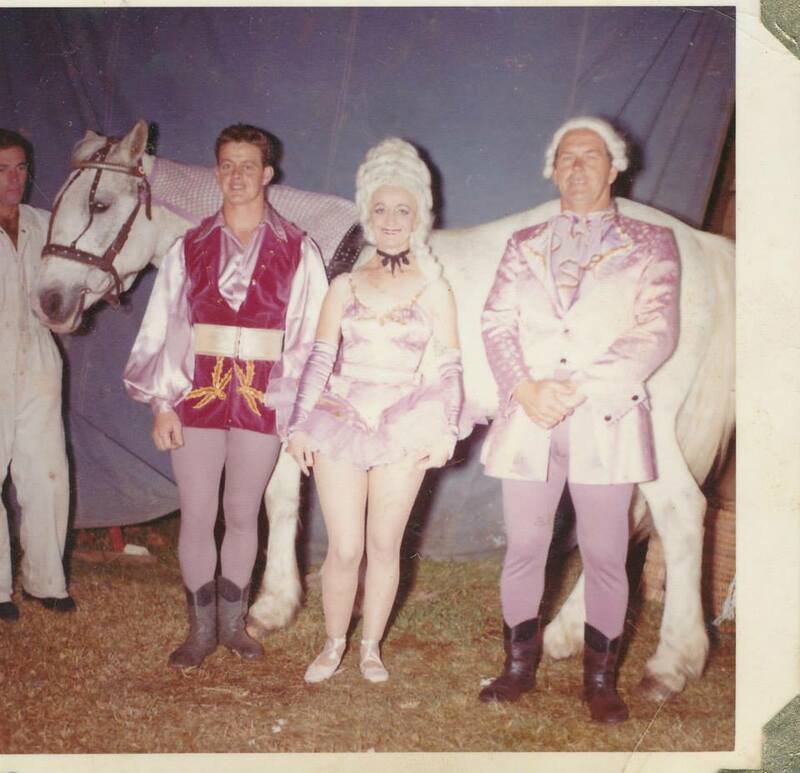 In the 1800s, Ned Kelly watched our show on a number of occasions and even enjoyed tea with the performers after the show. 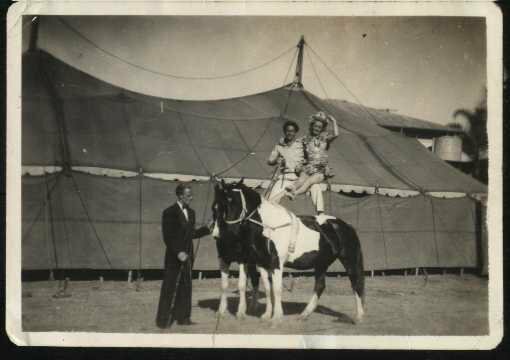 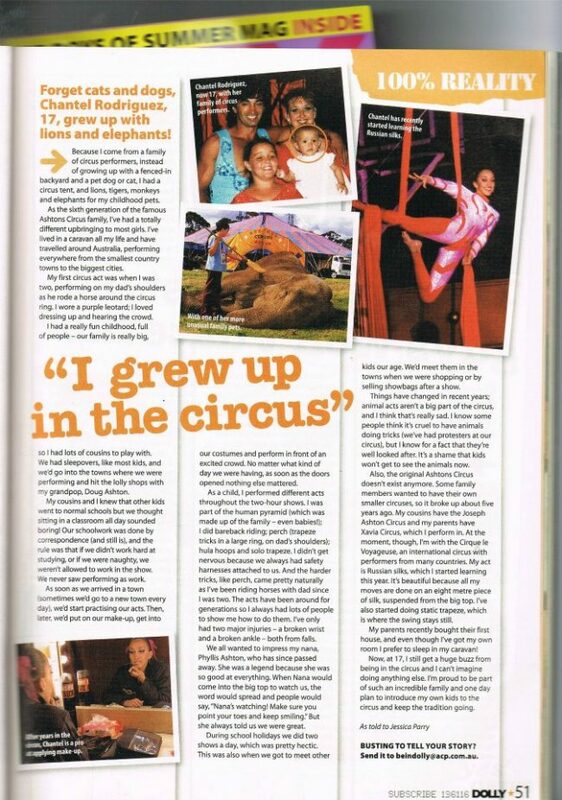 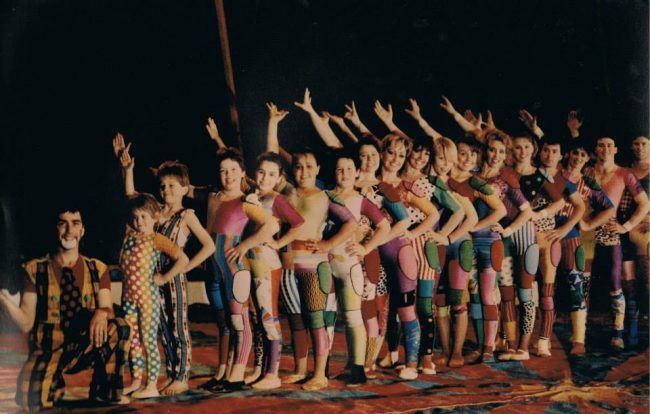 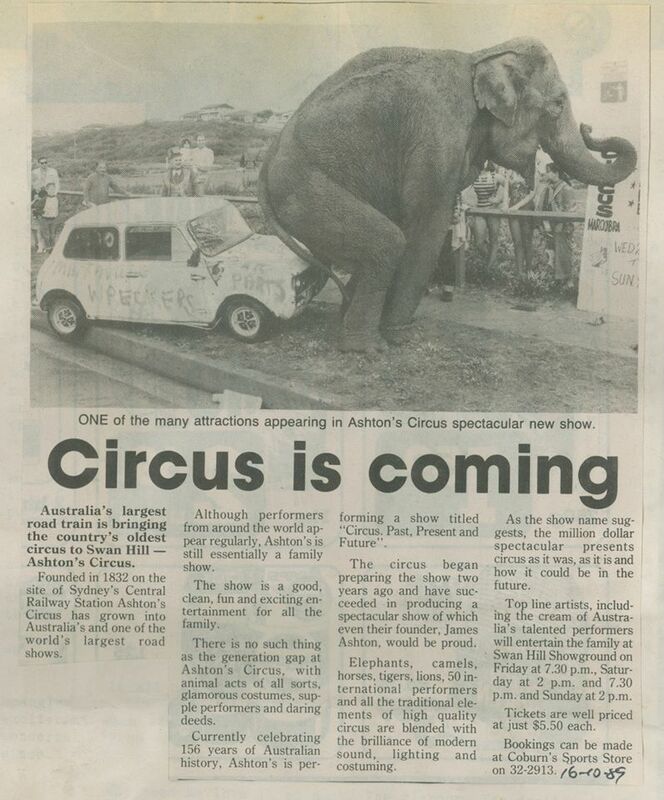 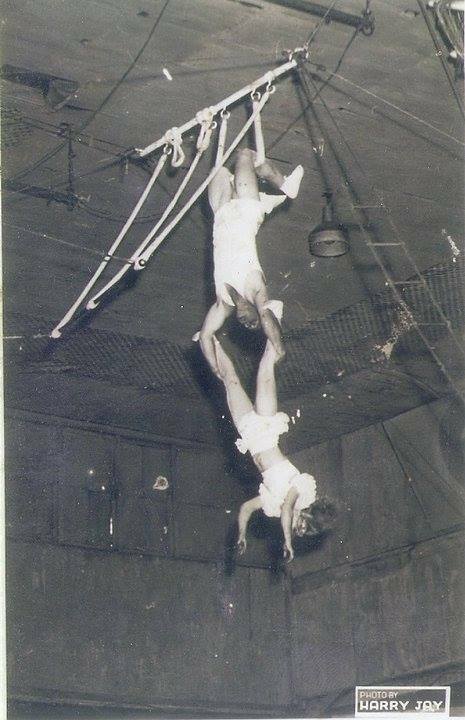 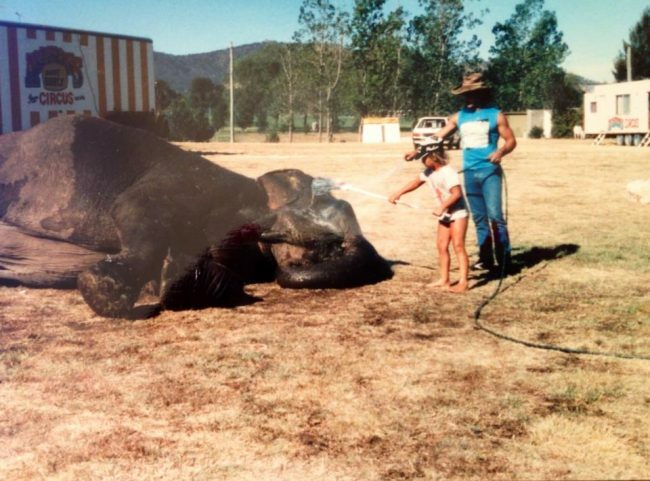 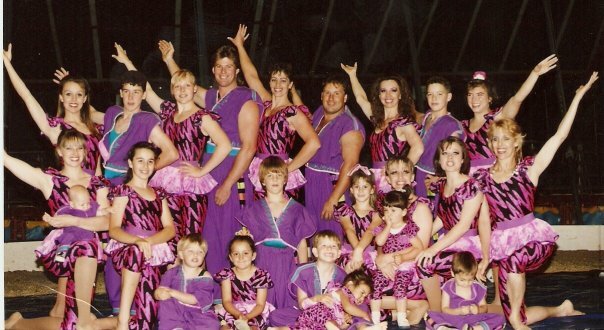 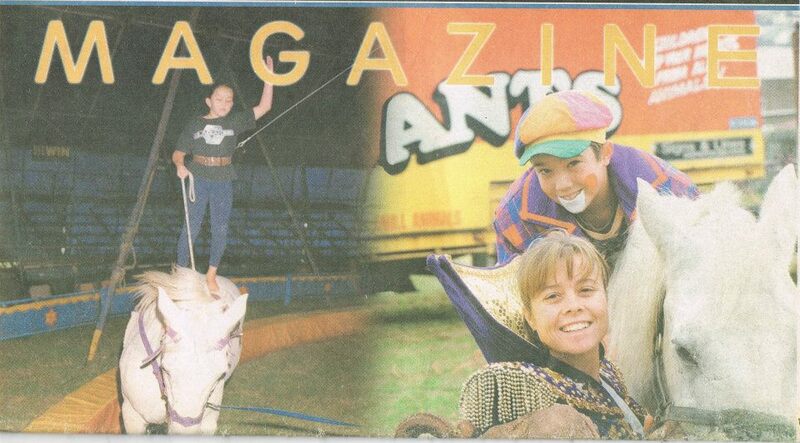 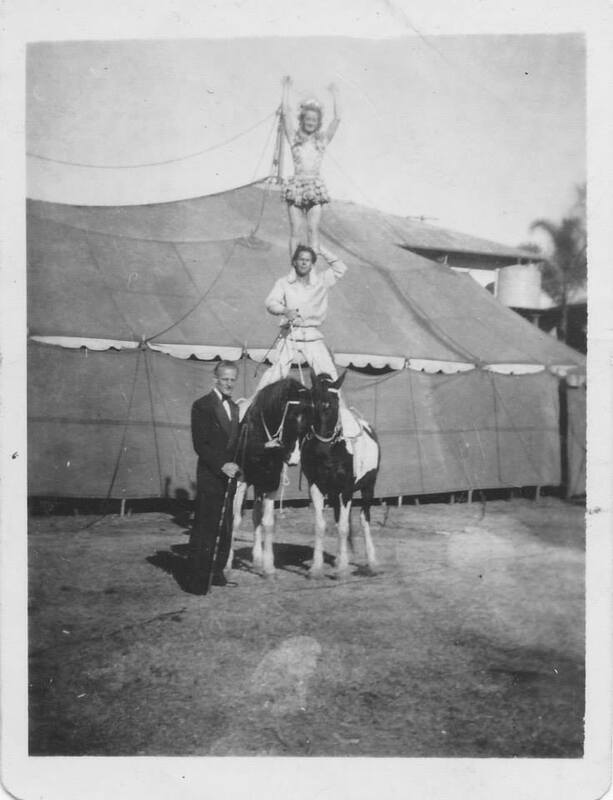 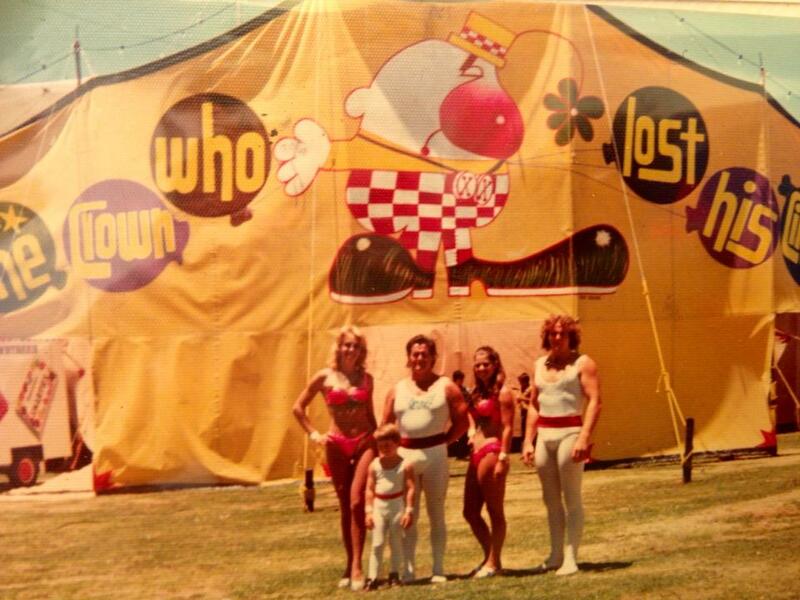 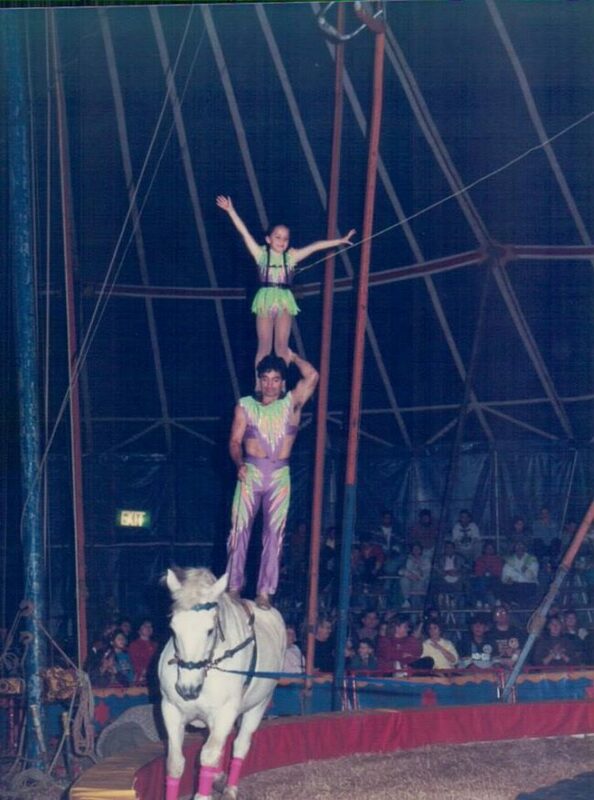 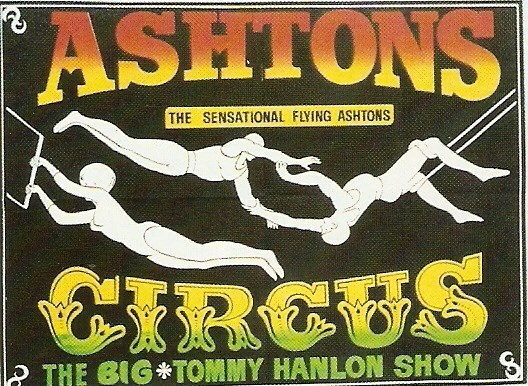 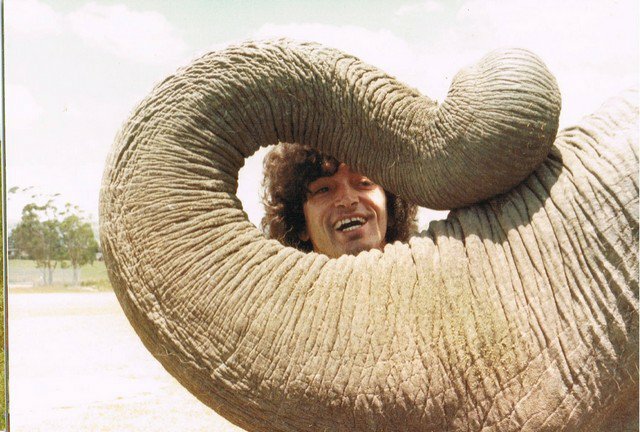 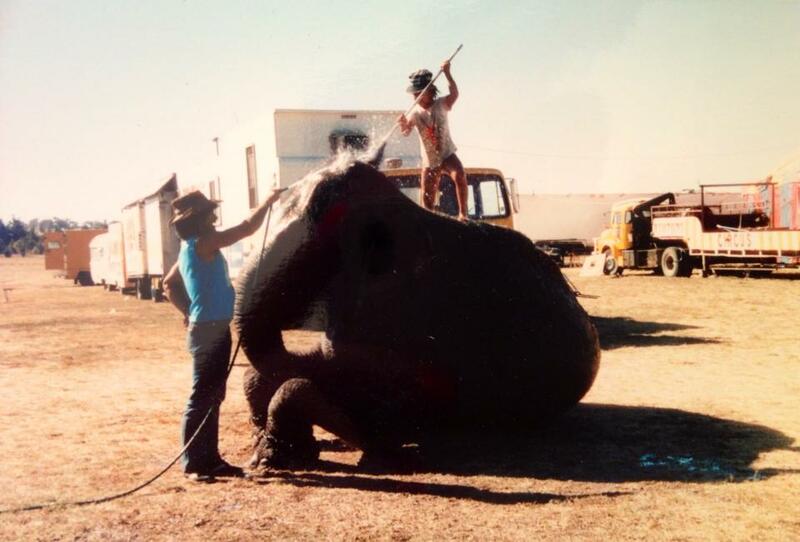 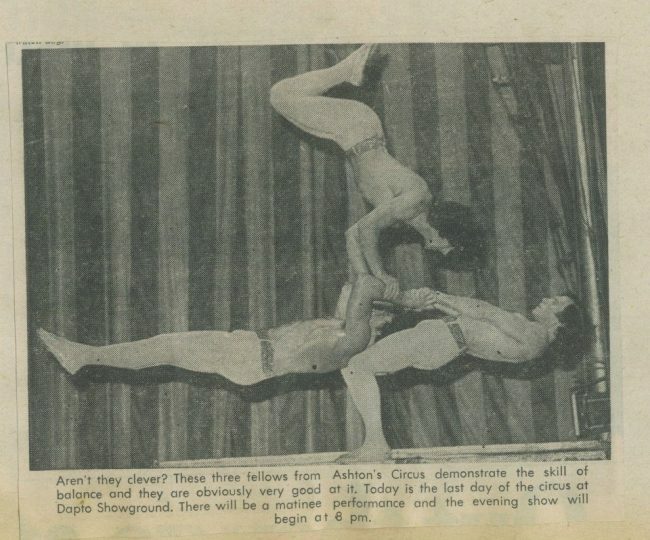 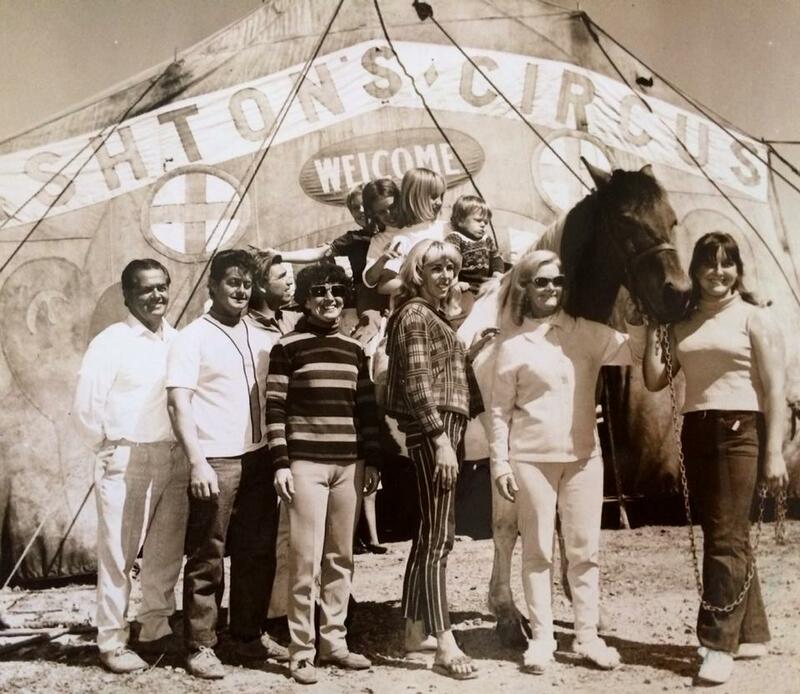 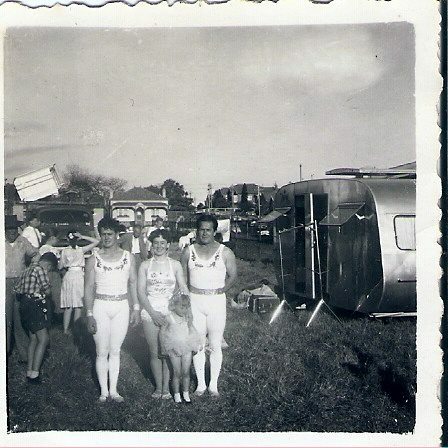 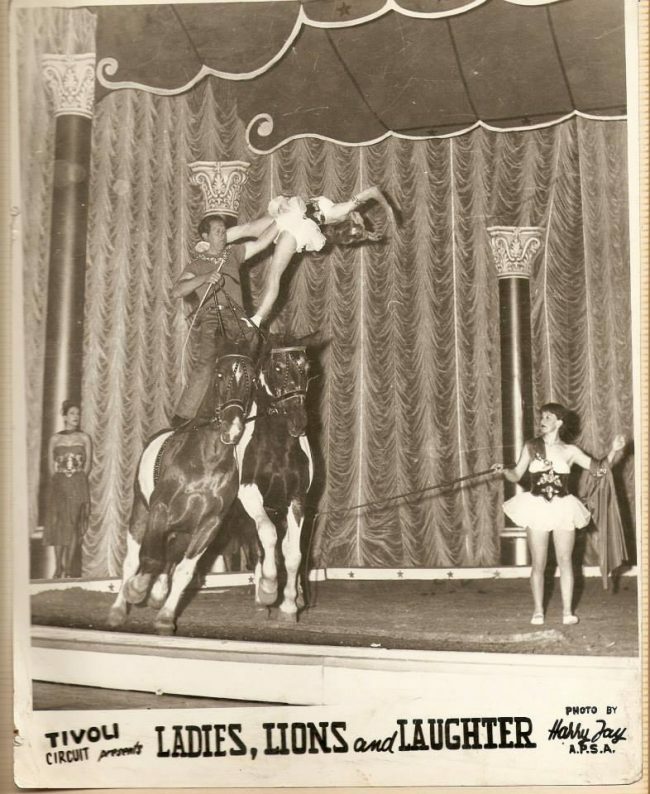 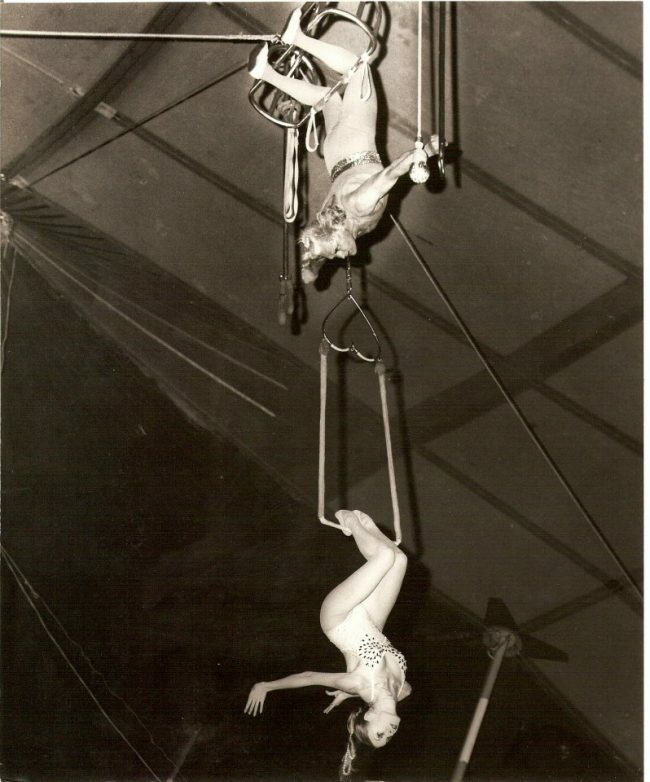 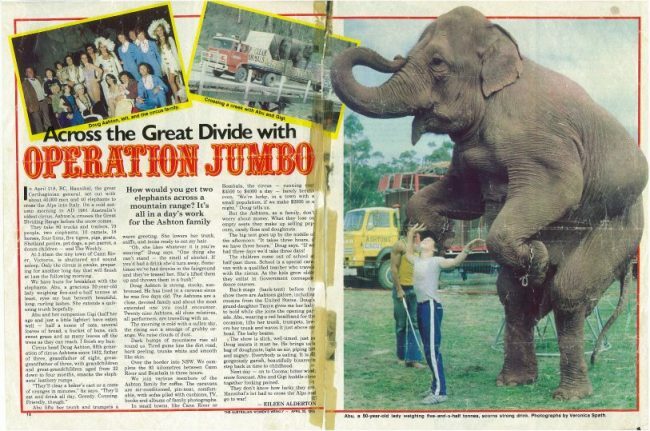 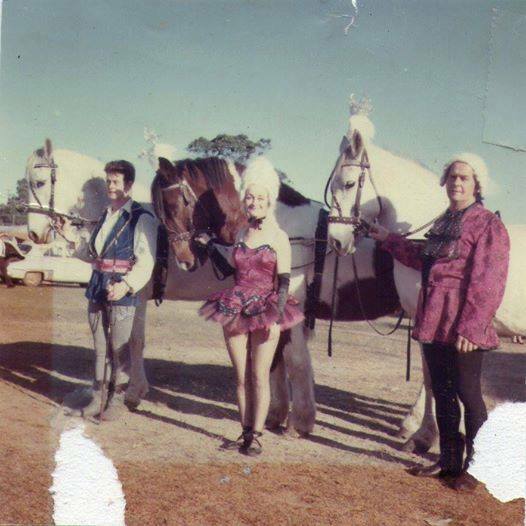 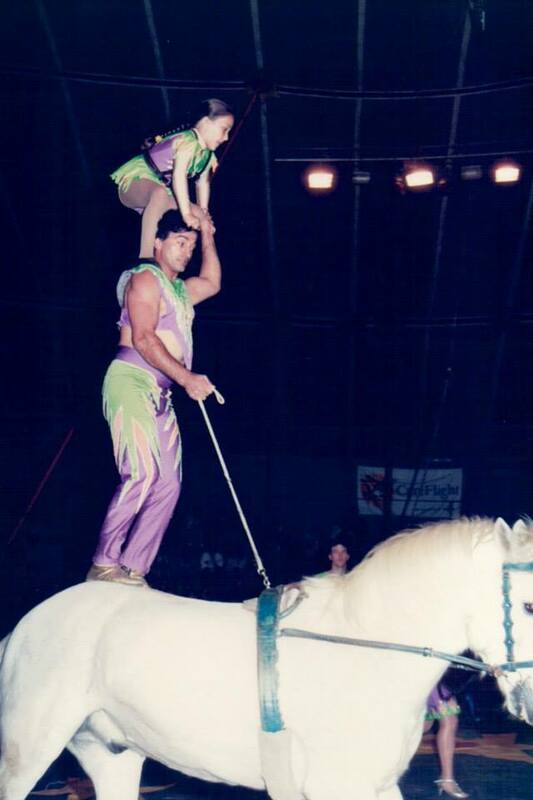 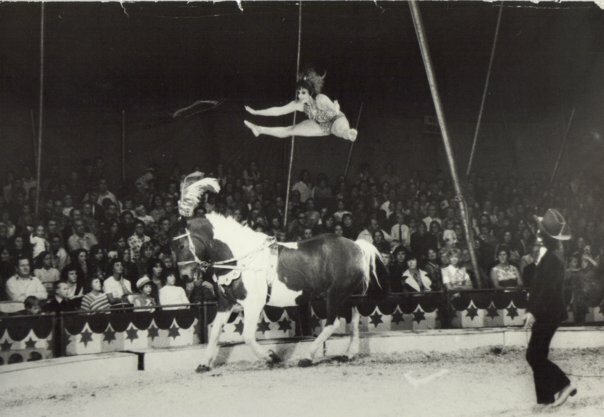 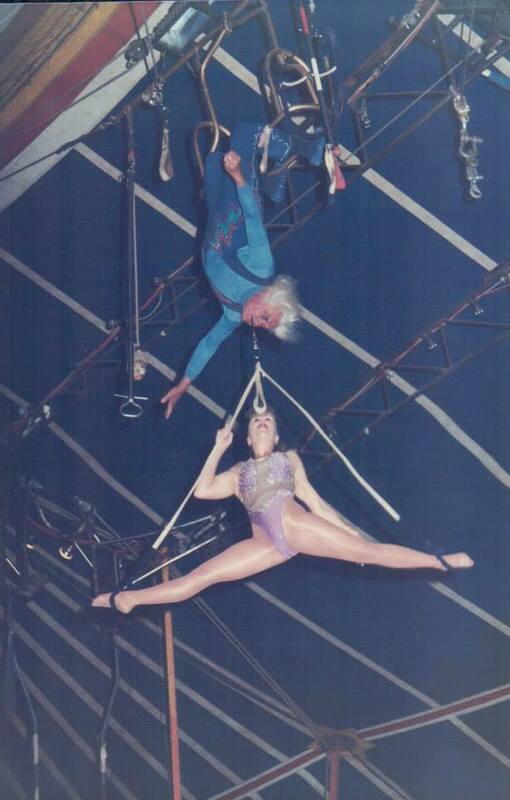 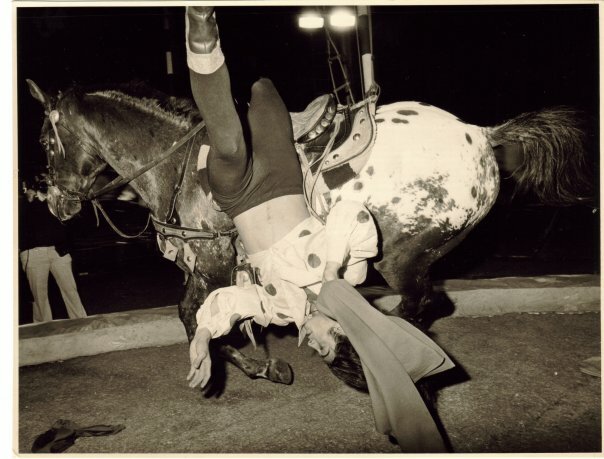 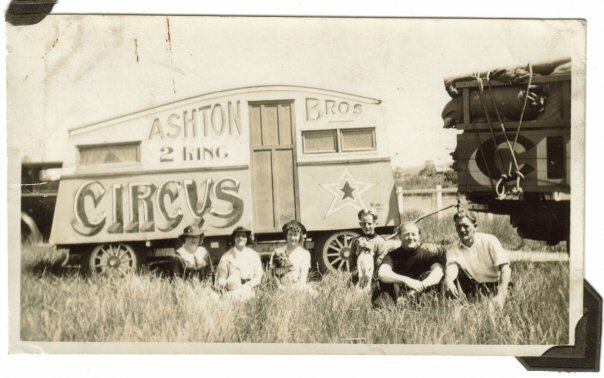 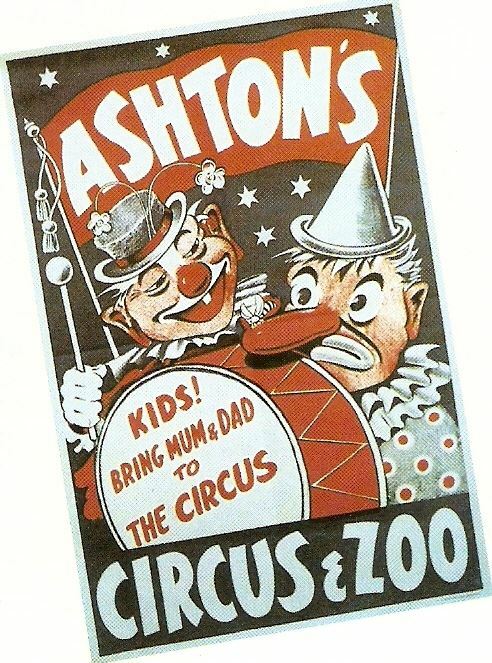 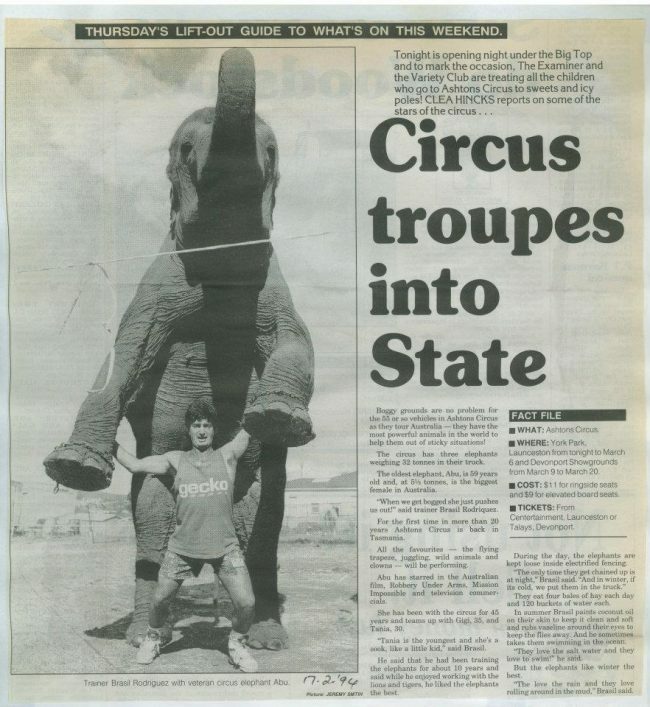 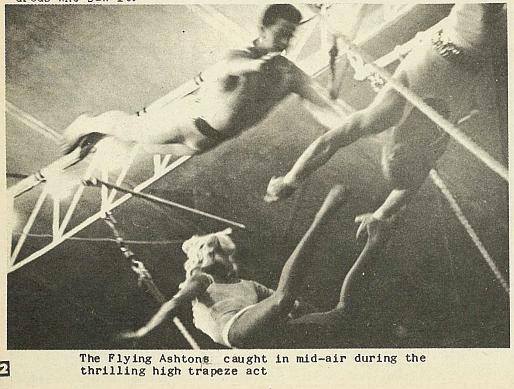 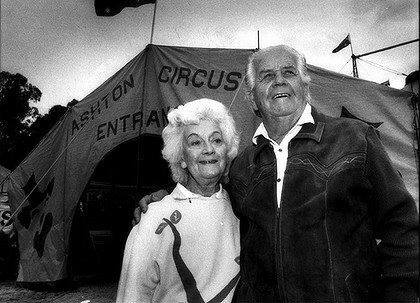 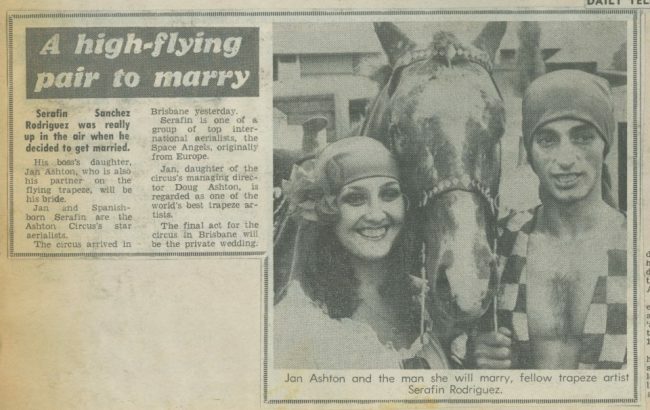 The Ashtons have been acclaimed, not just for their skilled and dazzling circus performances, but for generations of passionate endeavor, crisscrossing the country to take the magic of the circus to the outback. 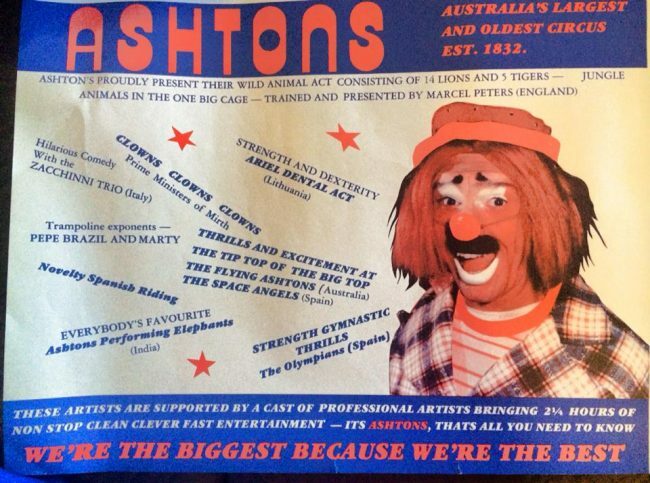 We are a family that dreams big and delights in bringing pleasure and wonder to the lives of thousands of fellow Australians. 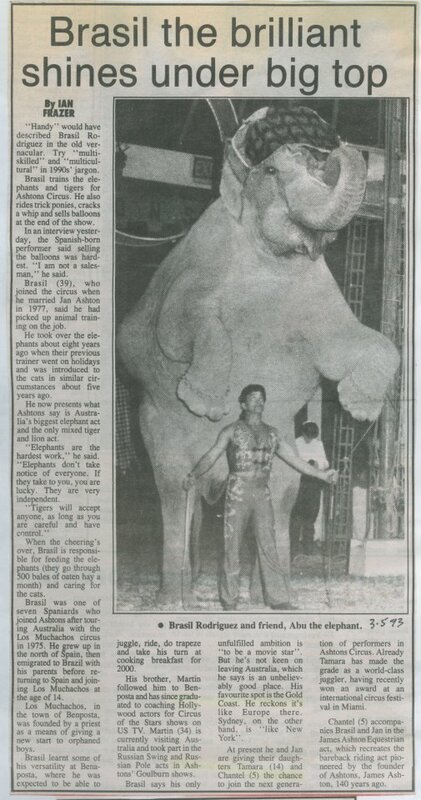 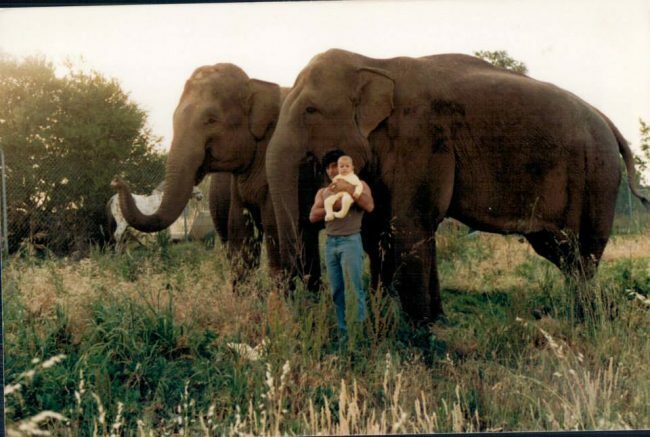 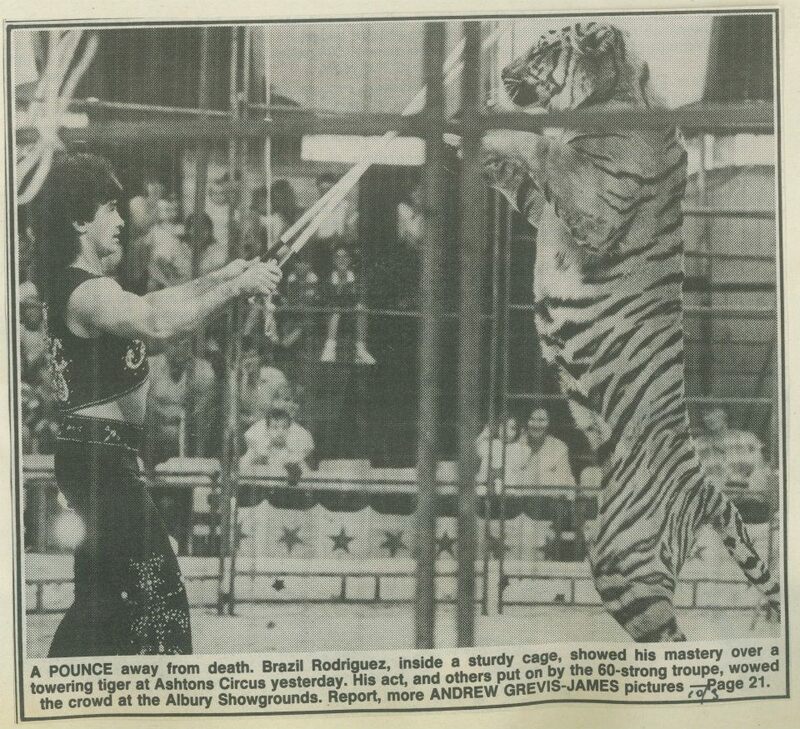 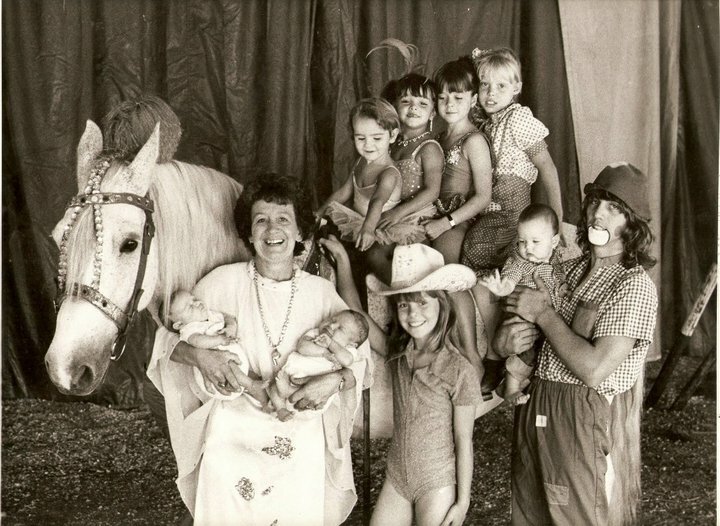 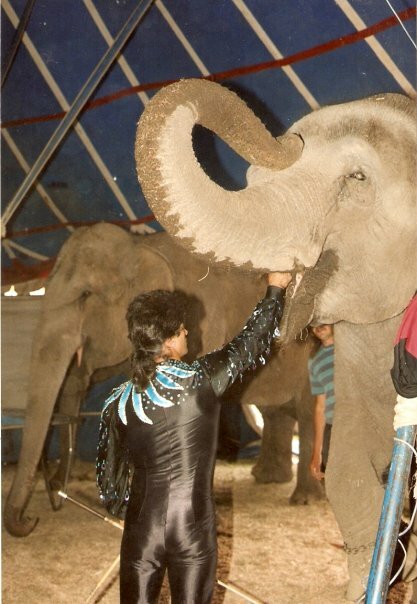 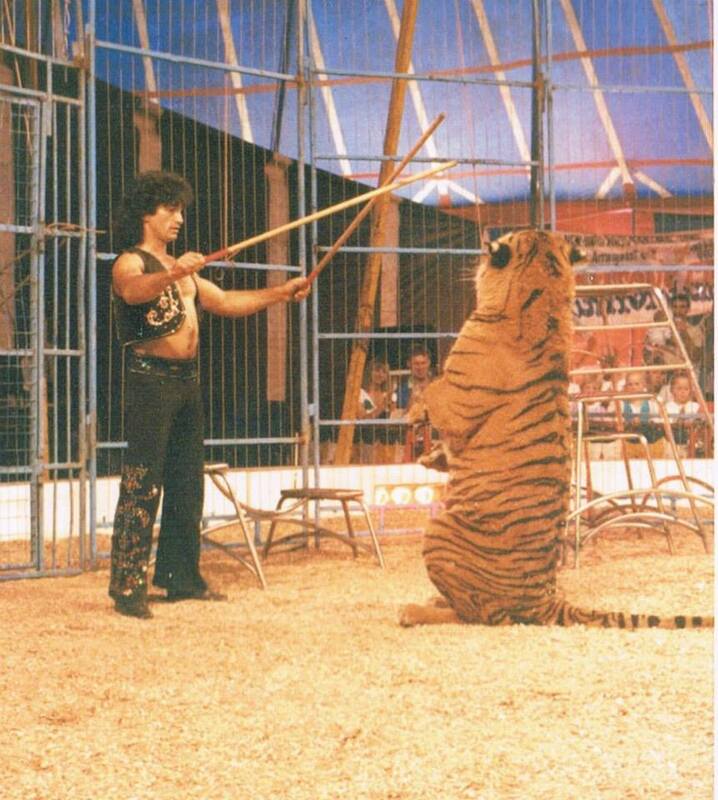 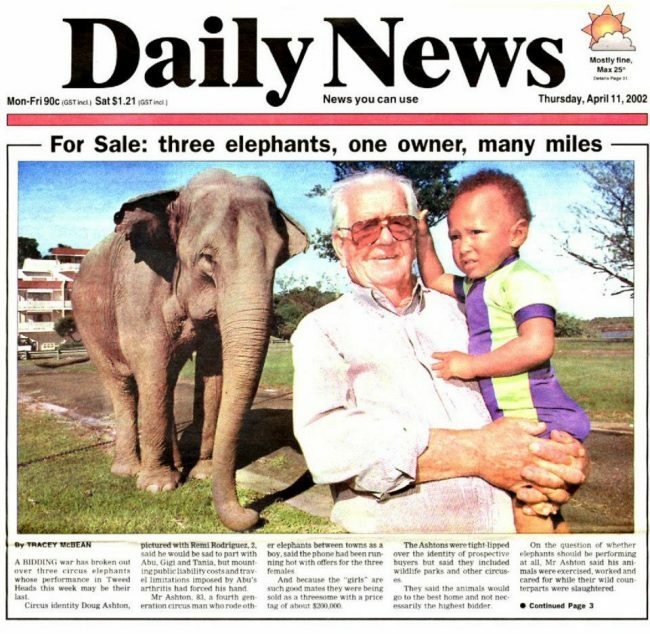 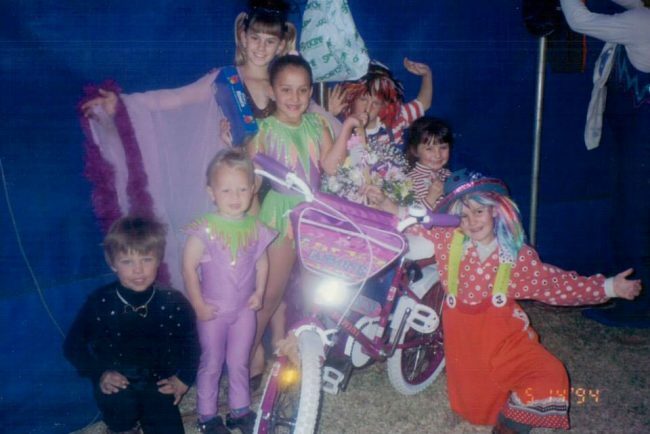 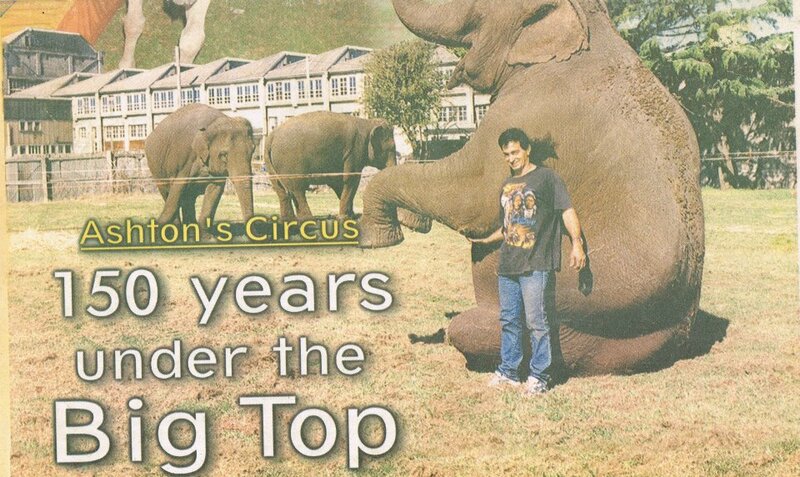 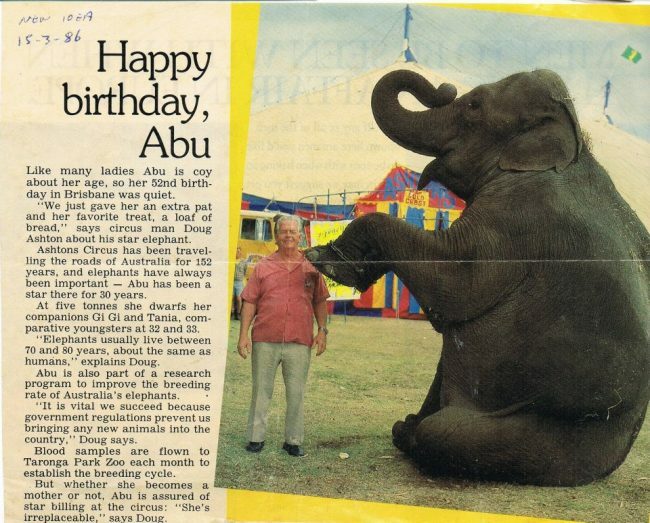 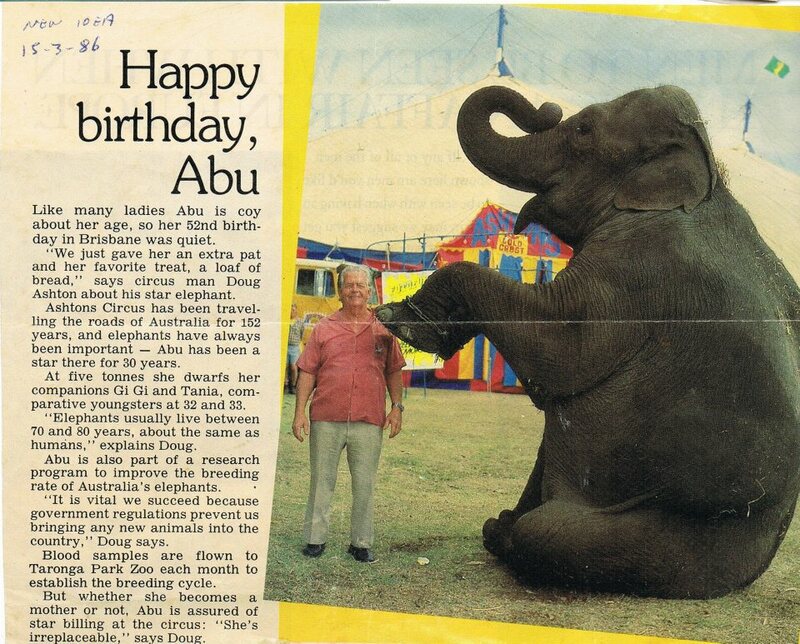 The Ashton Circus family has a legacy of “giving back”, for which family members have been duly acknowledged with honors and tributes. 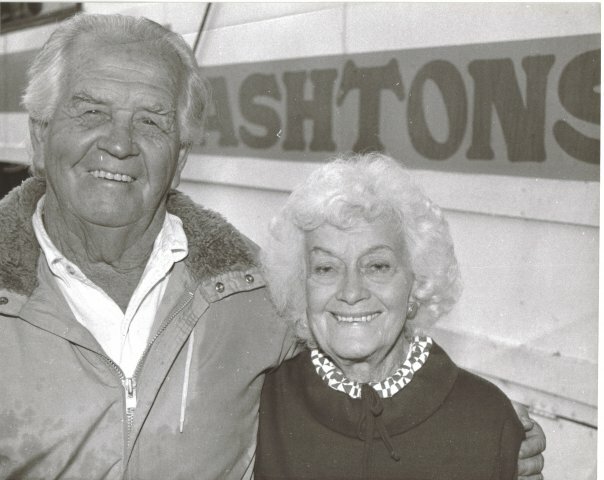 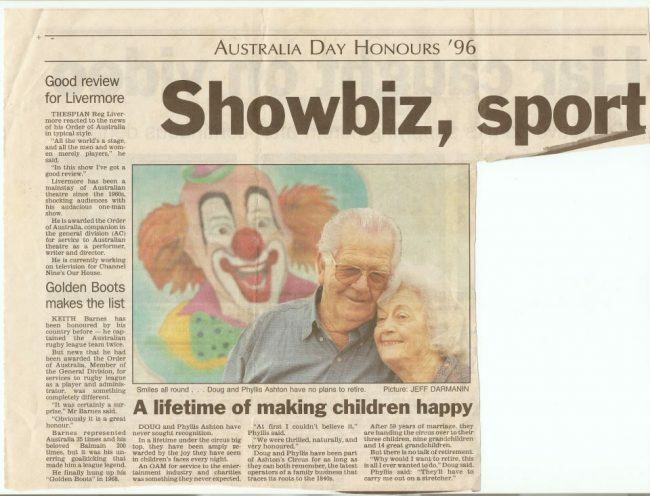 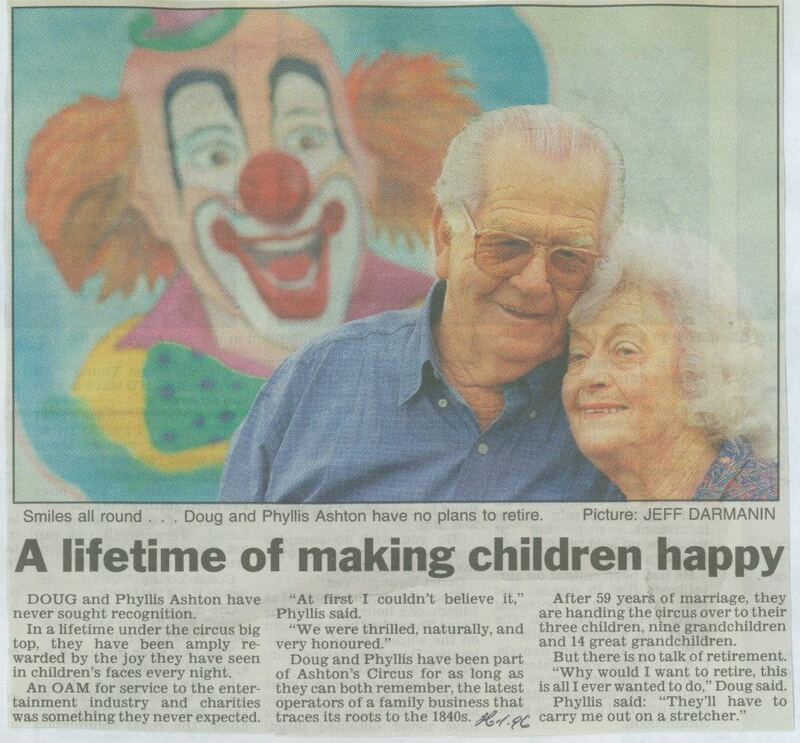 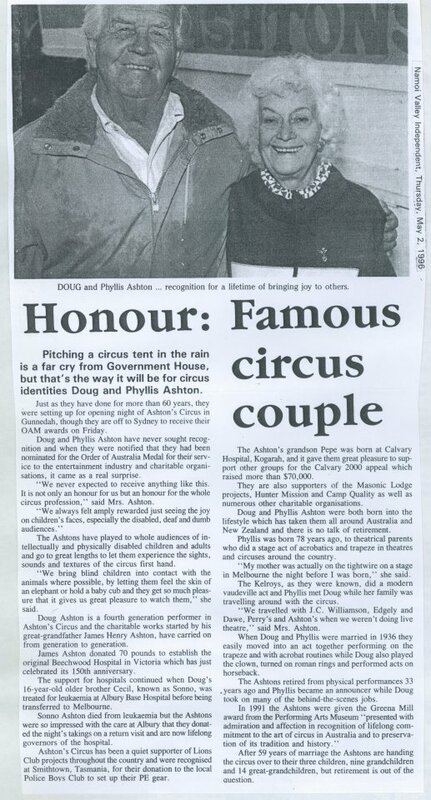 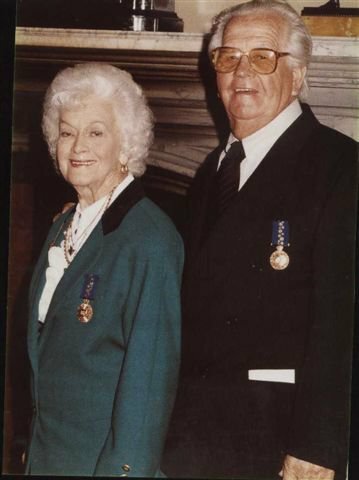 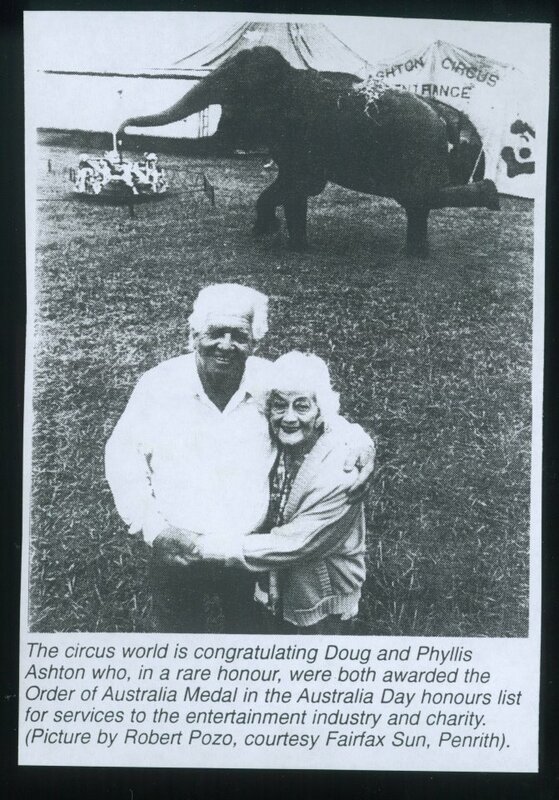 Doug and Phyllis Ashton, received an OAM in 1996 for their service to the entertainment industry and charitable organisations. 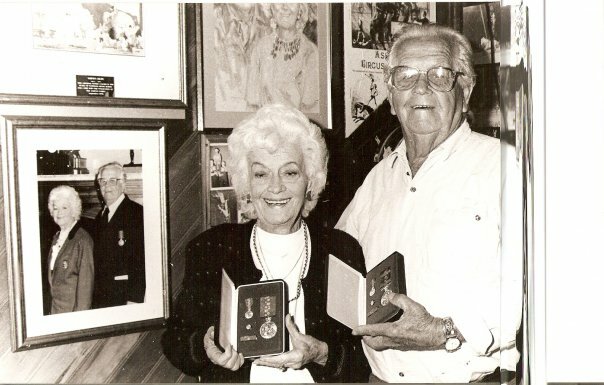 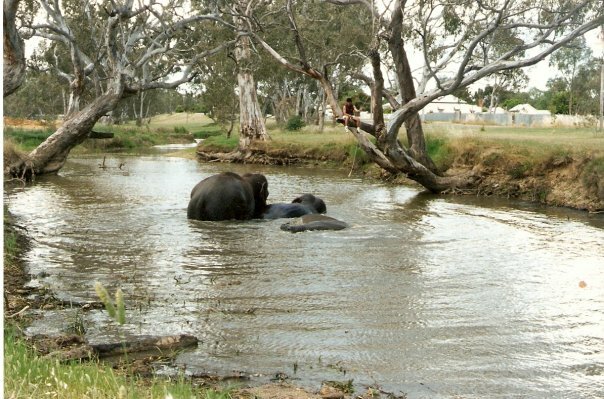 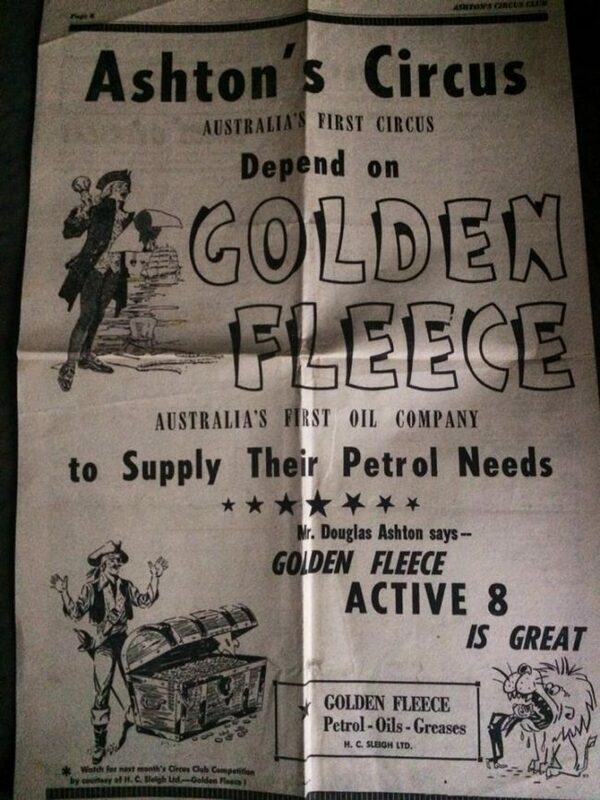 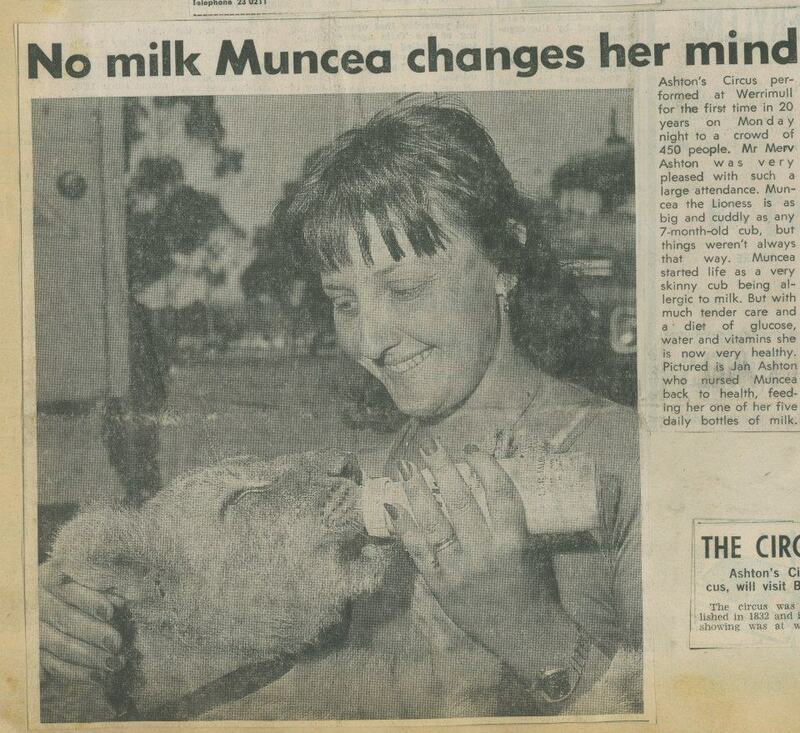 They were life governors of the Mildura Base Hospital in Victoria and the Royal Children’s Hospital in Melbourne, having fund-raised often for these and other hospitals. 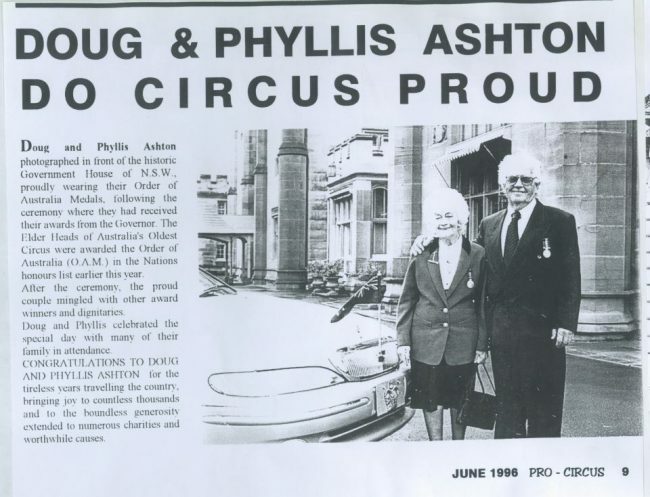 Phyllis Ashton carried the Olympic torch for the 2000 Games in Sydney, and has a street named after her in Canberra, ‘Phyllis Ashton Circuit’. 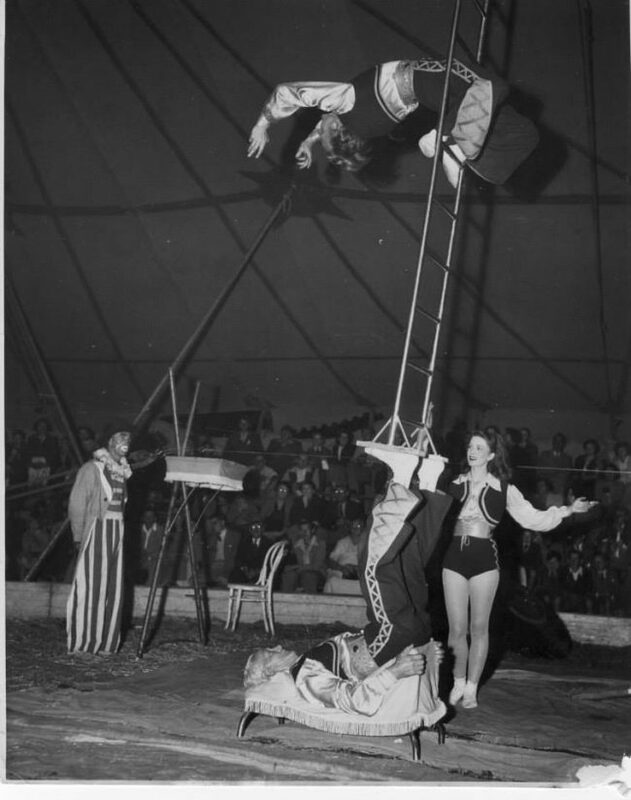 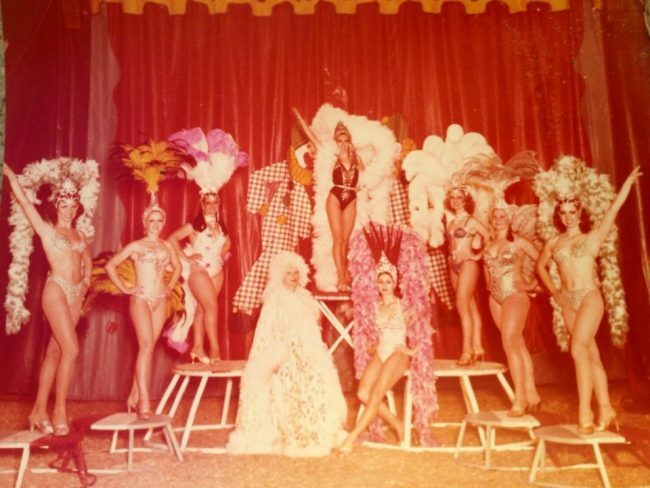 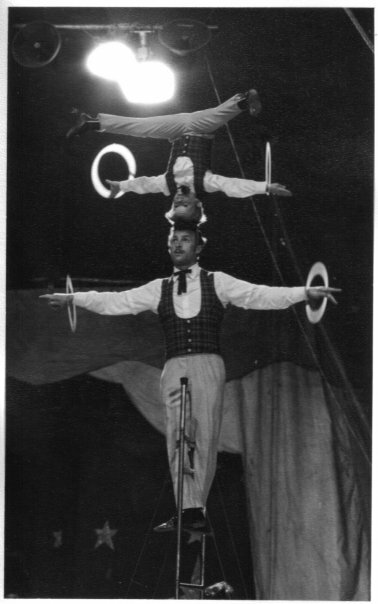 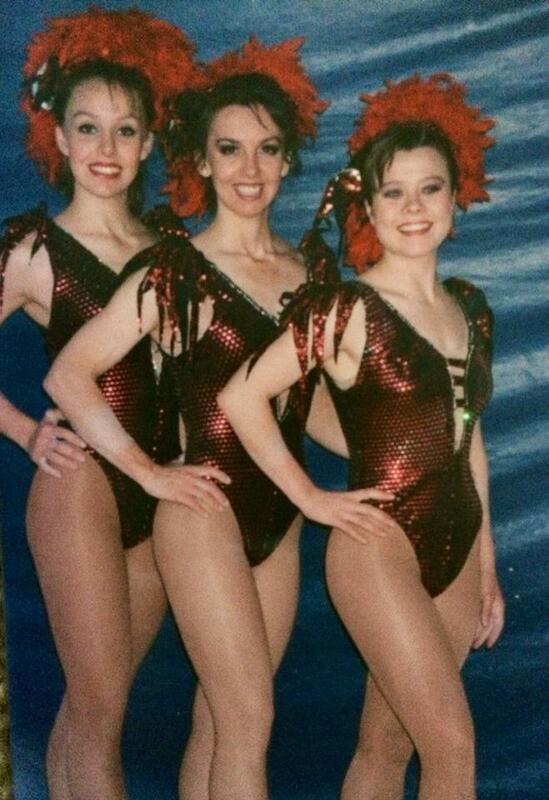 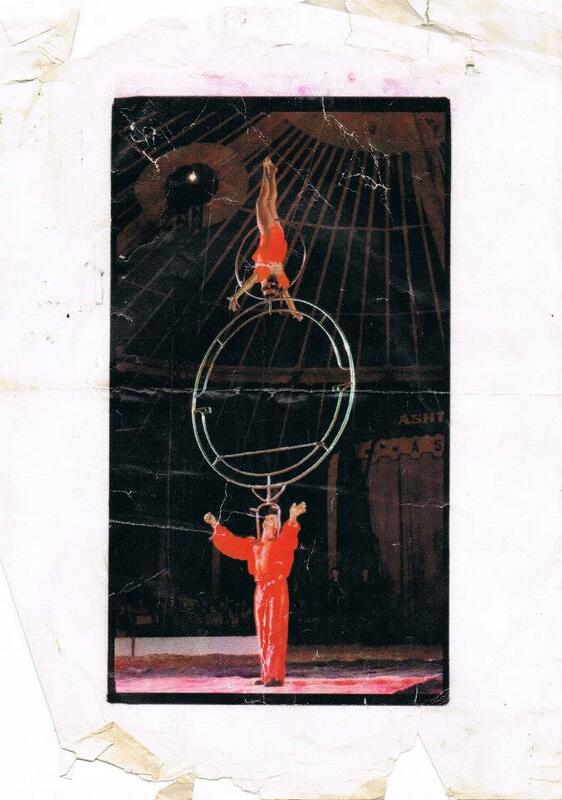 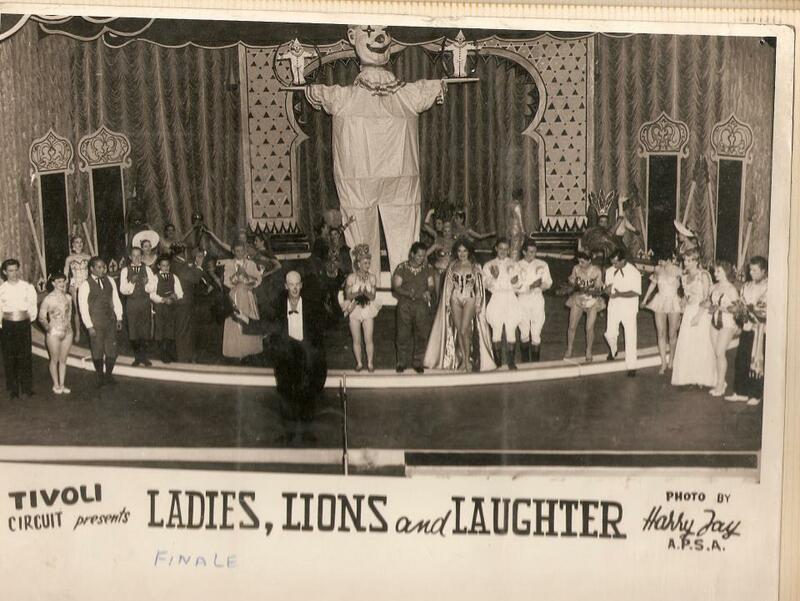 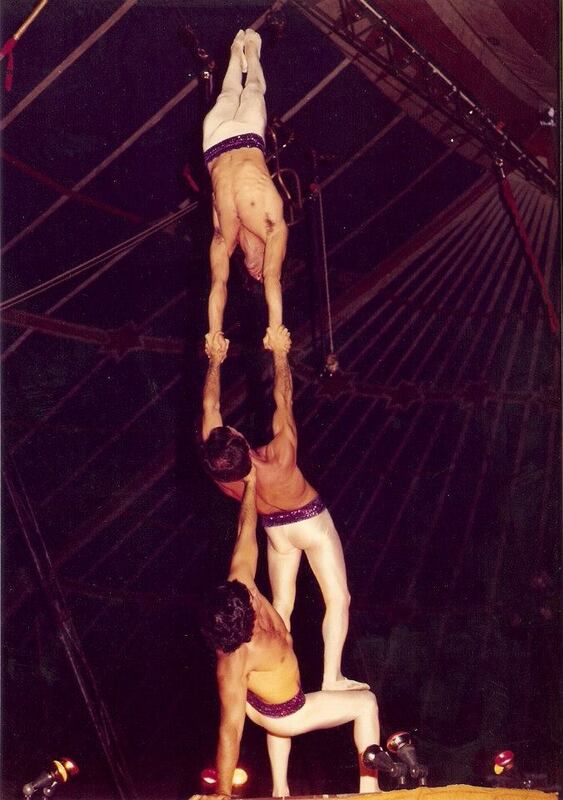 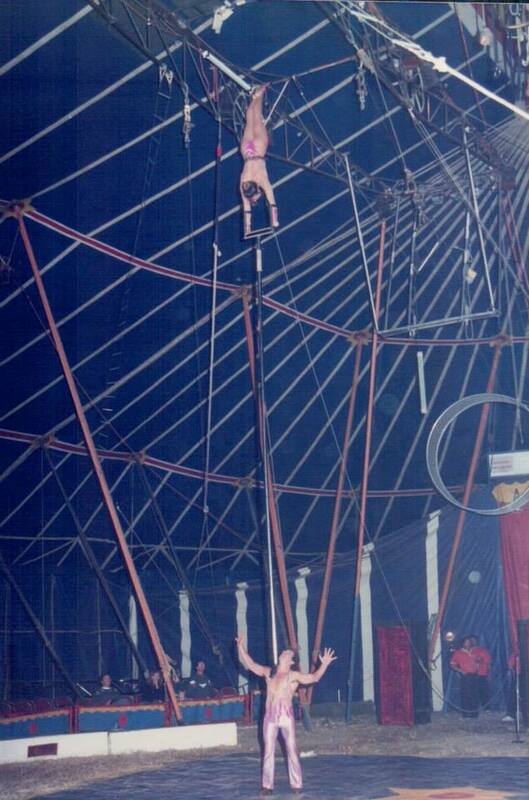 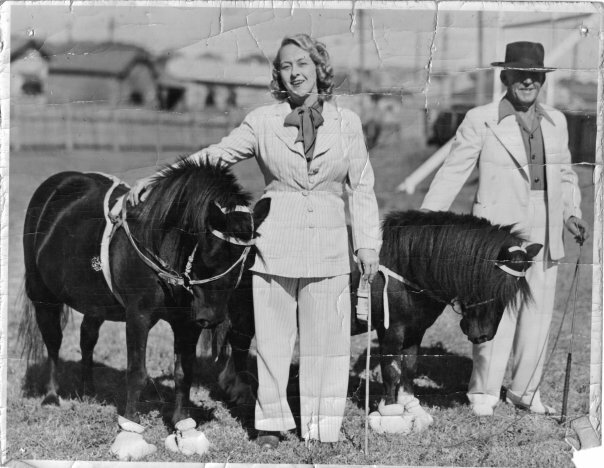 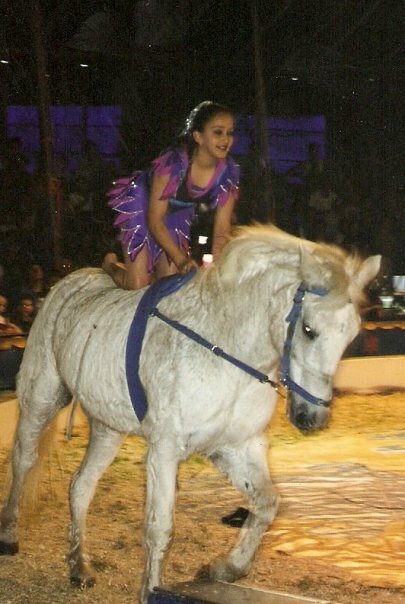 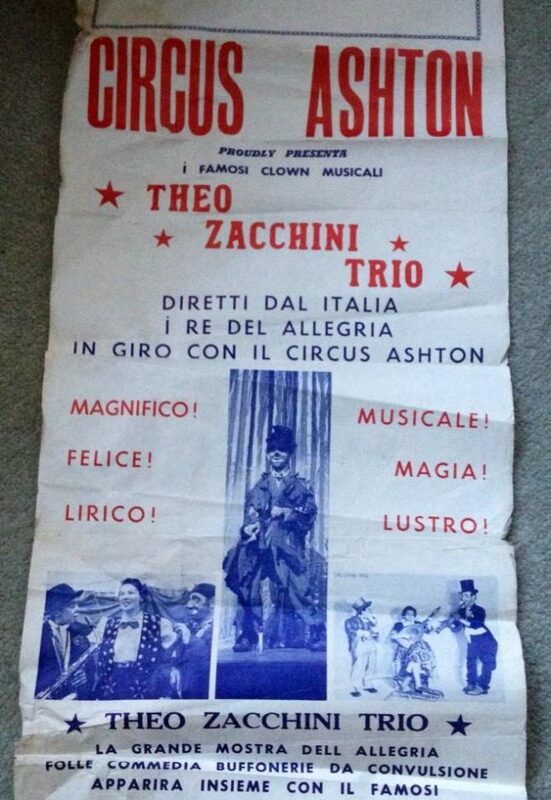 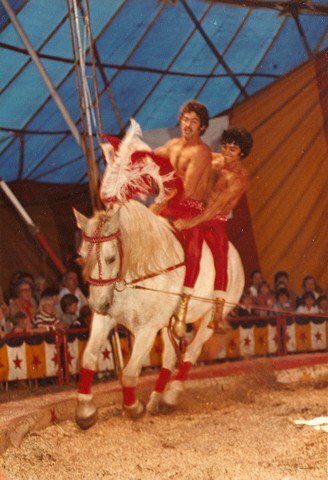 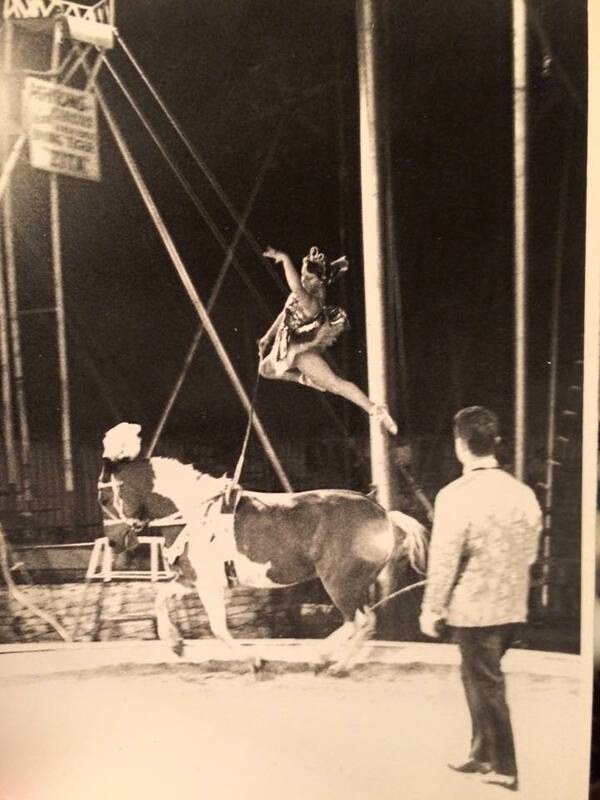 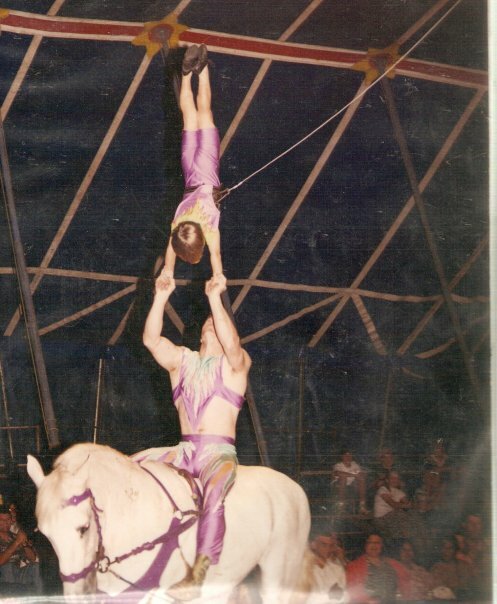 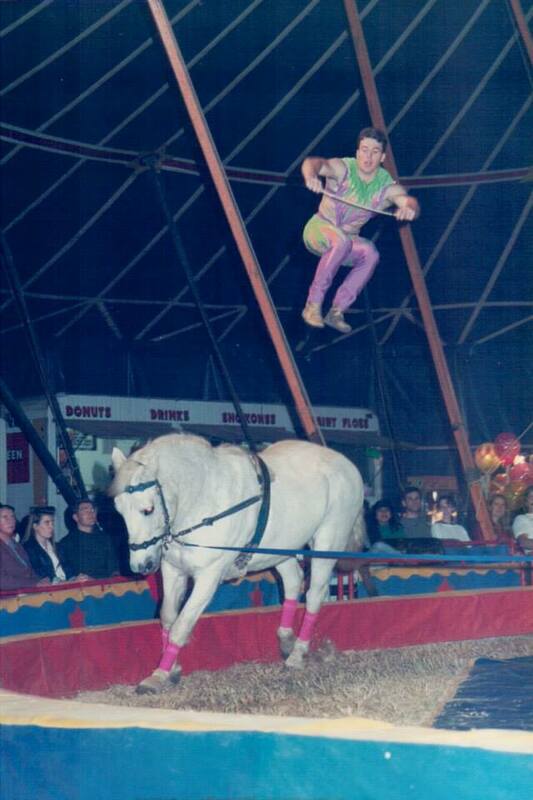 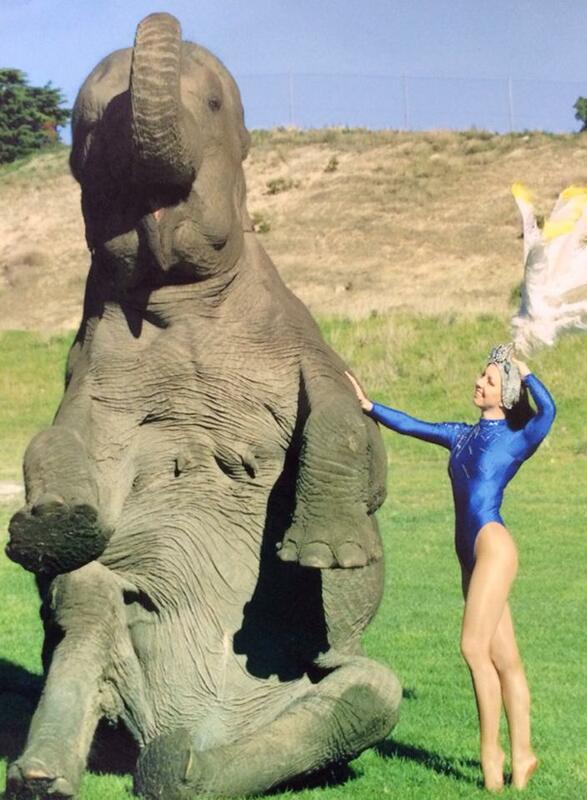 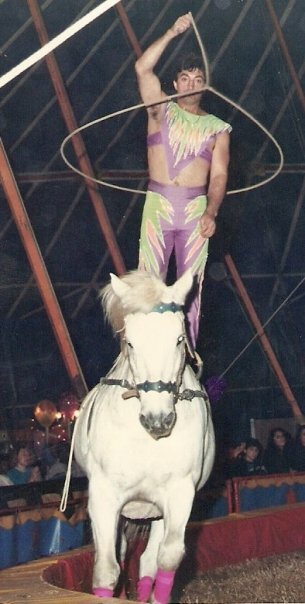 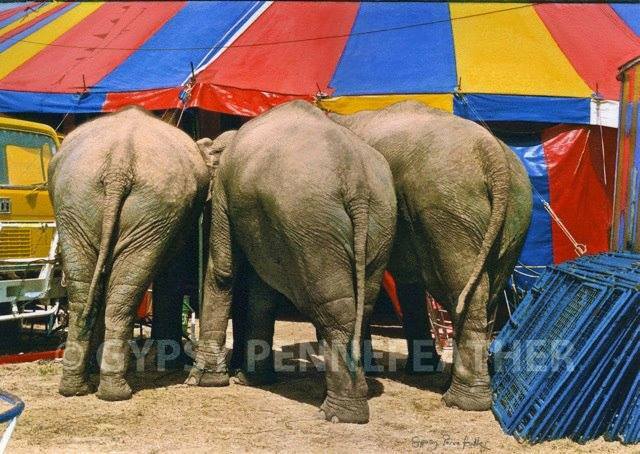 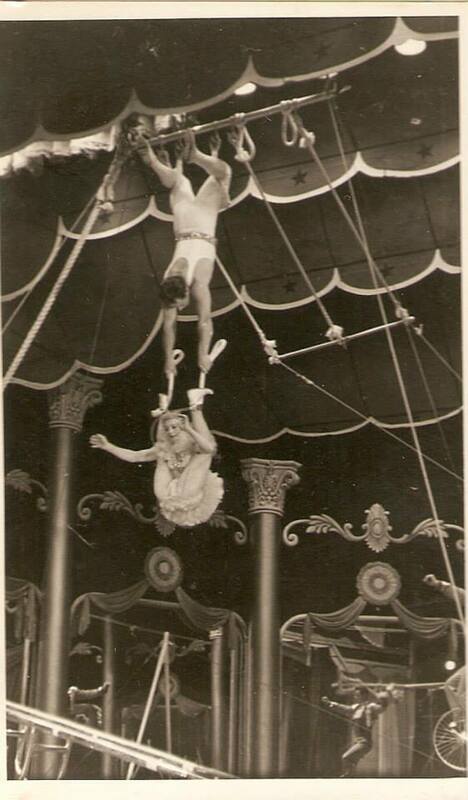 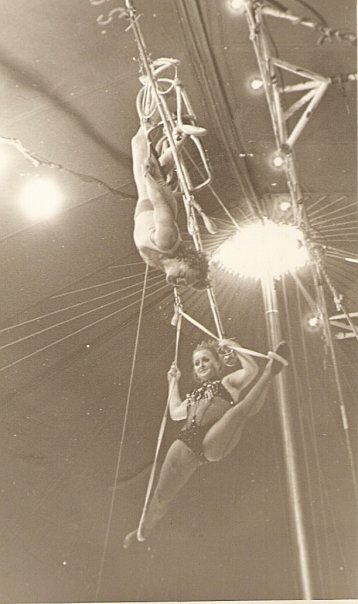 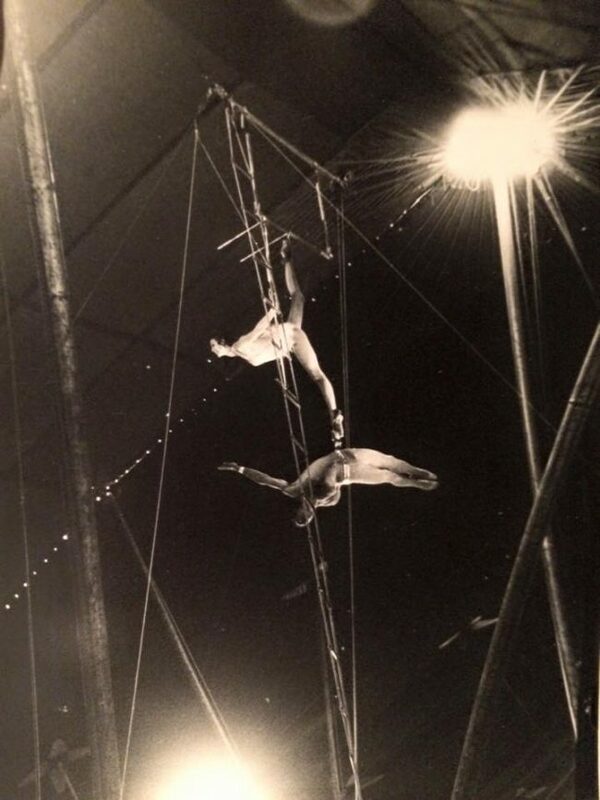 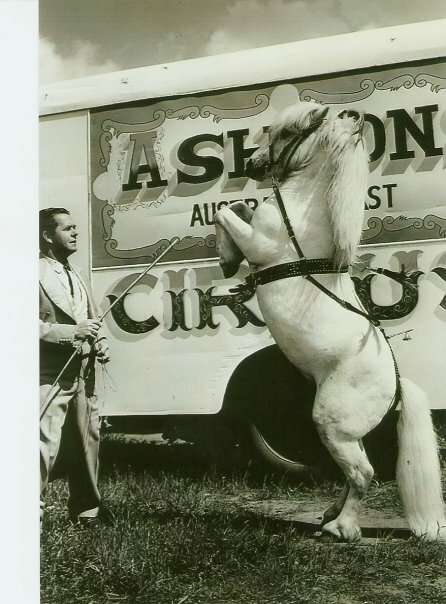 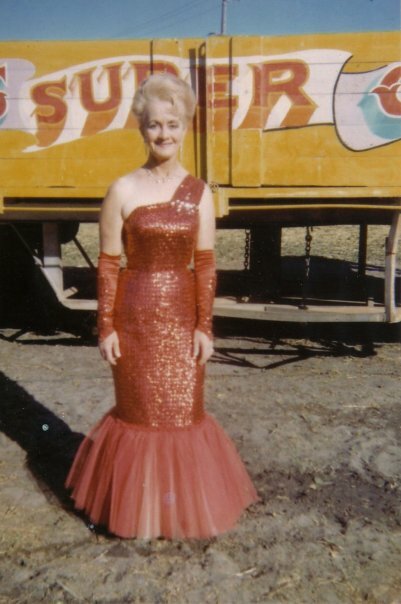 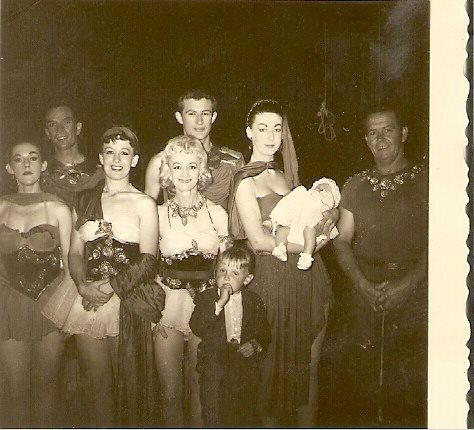 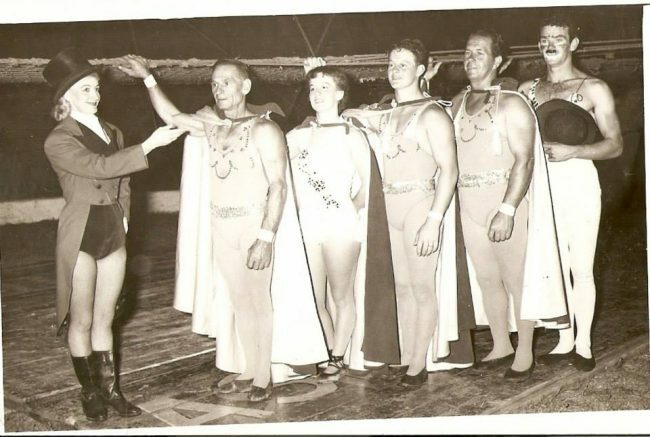 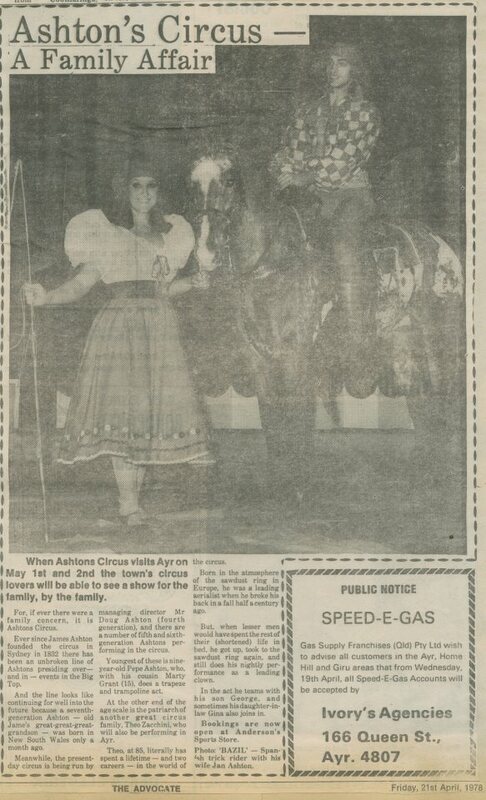 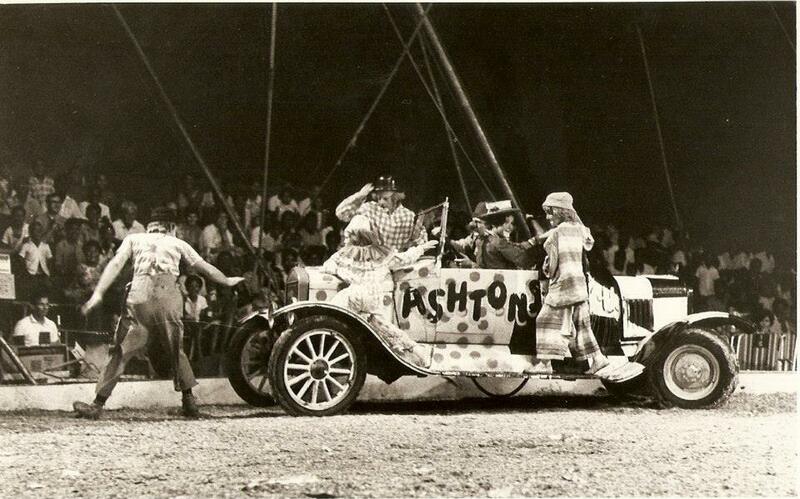 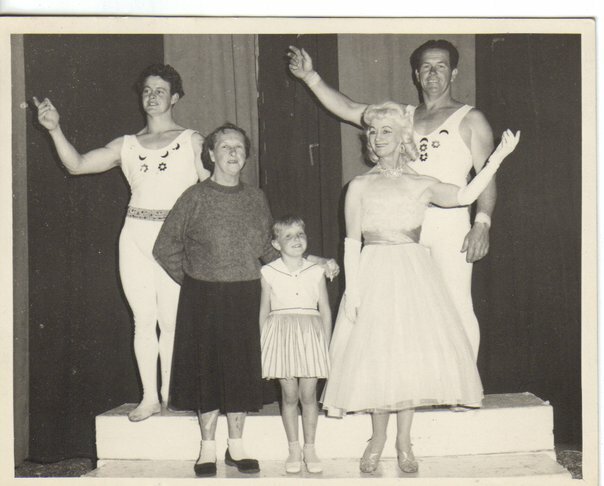 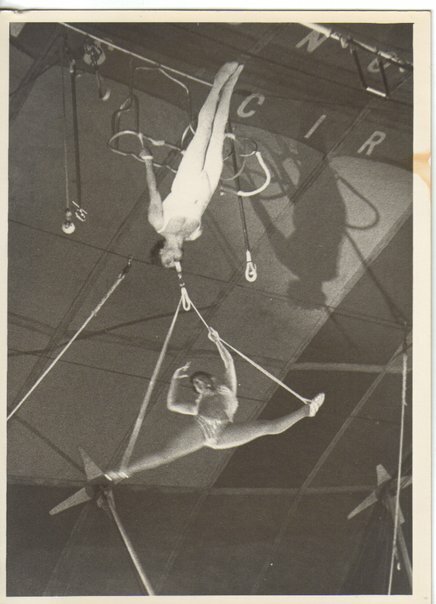 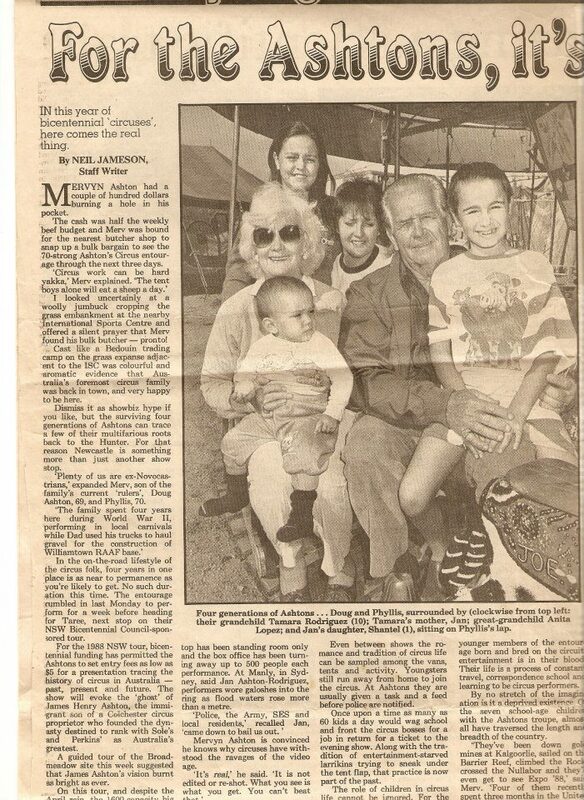 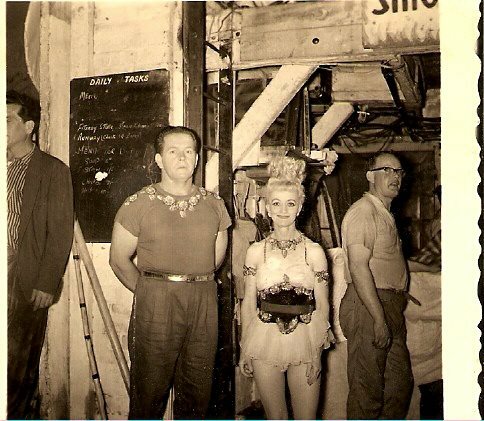 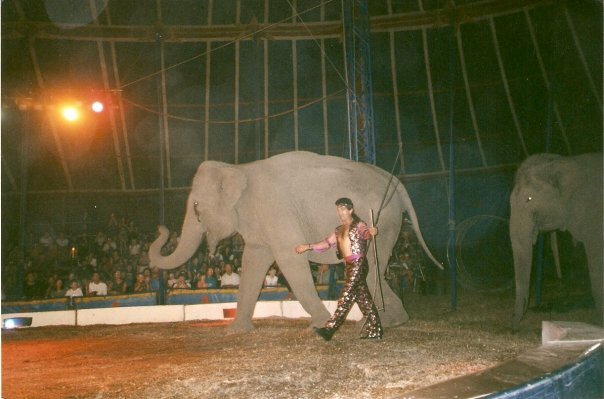 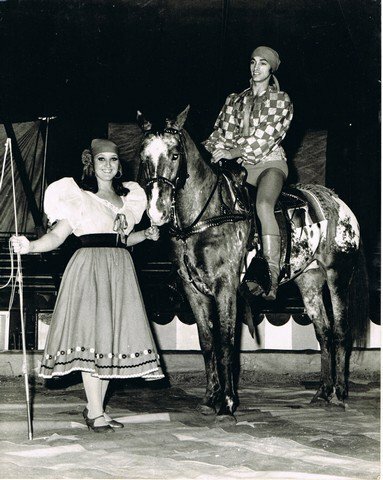 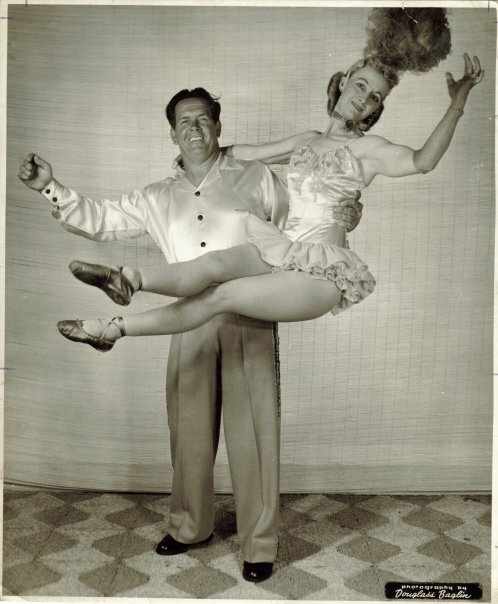 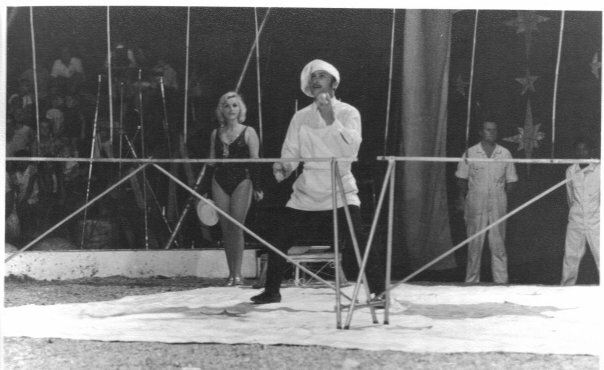 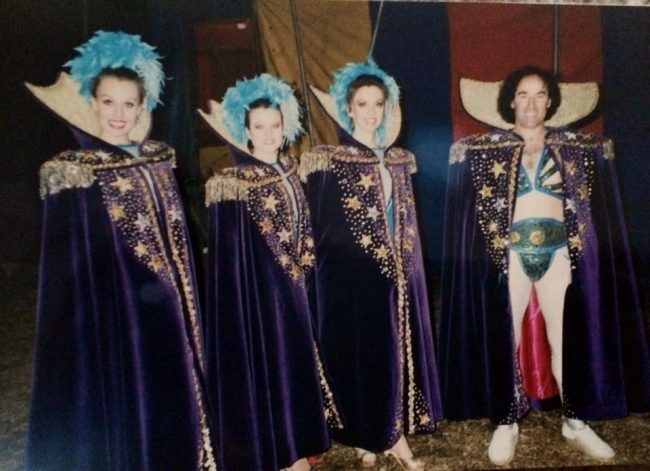 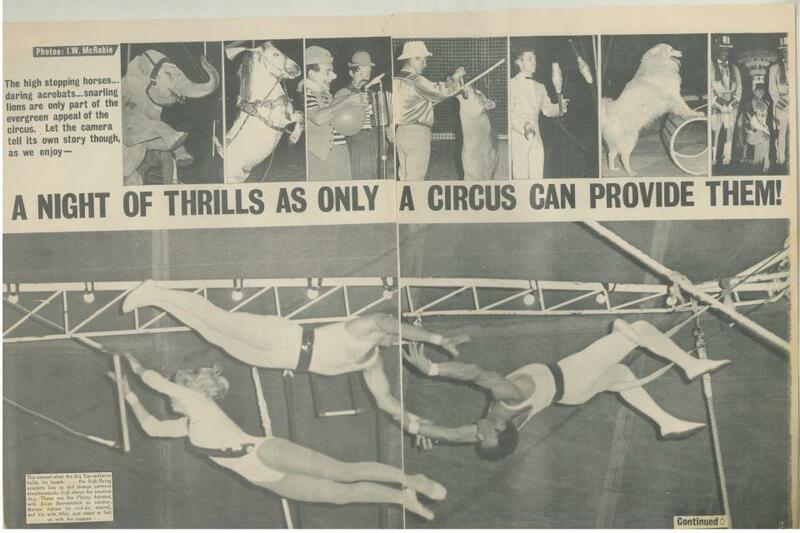 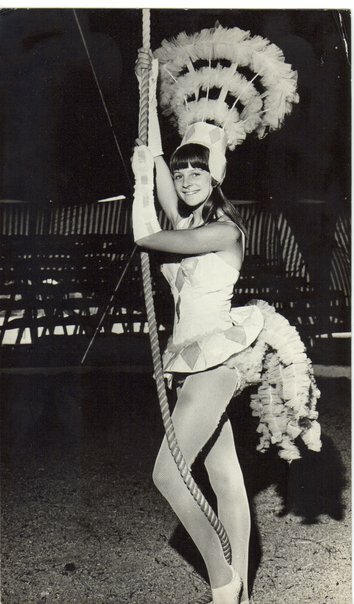 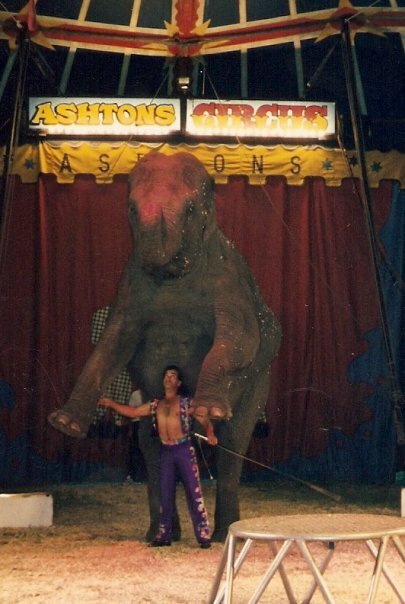 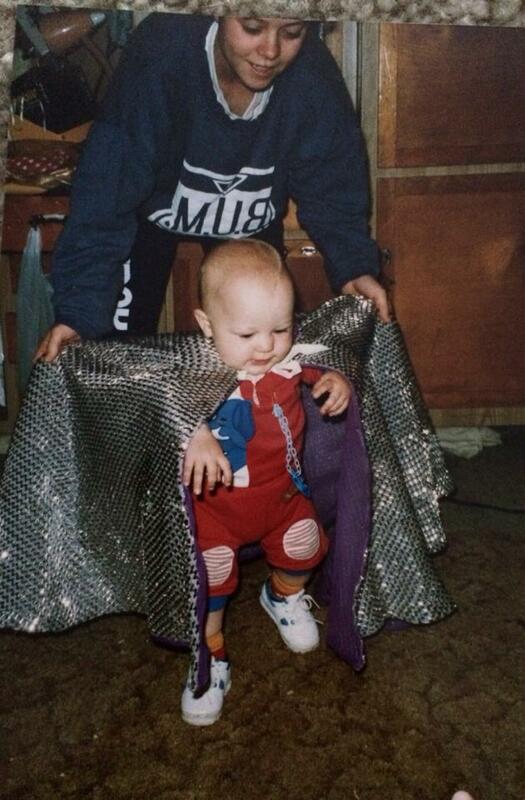 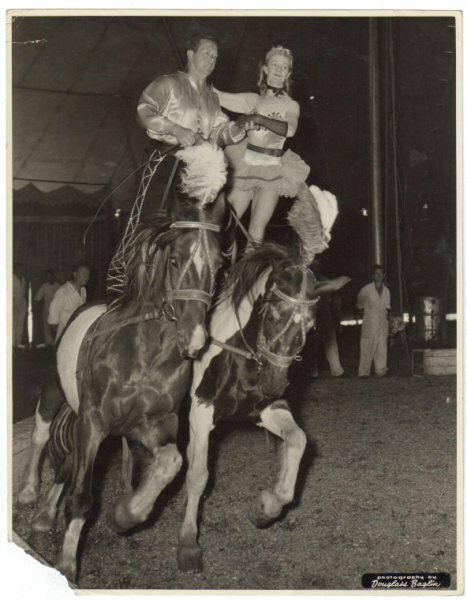 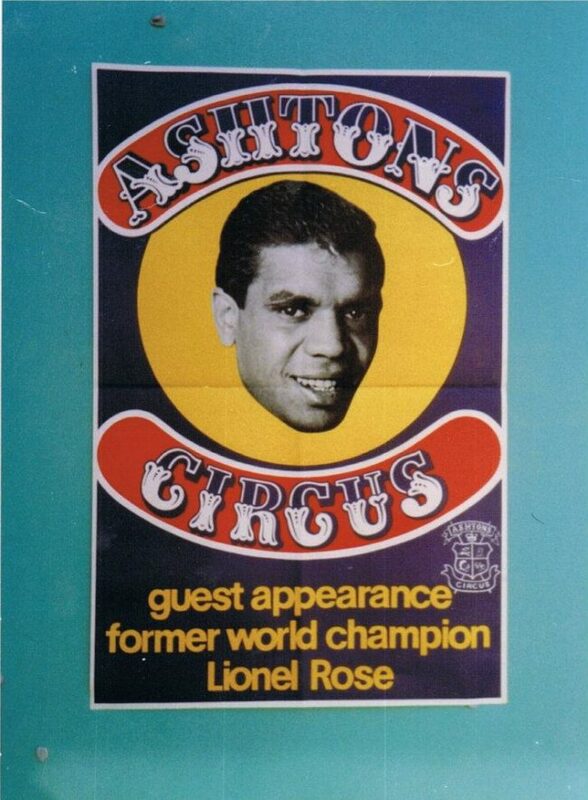 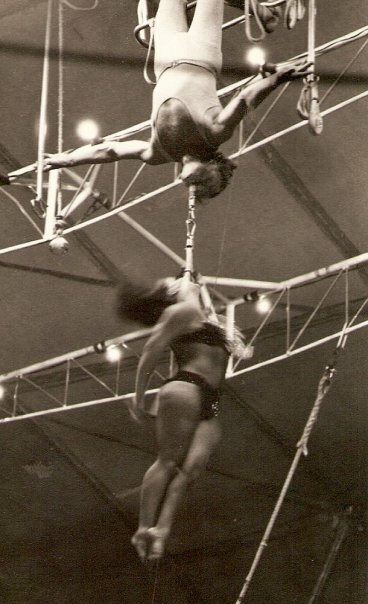 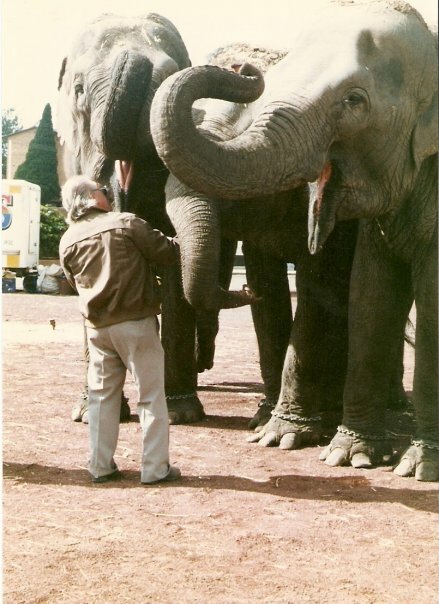 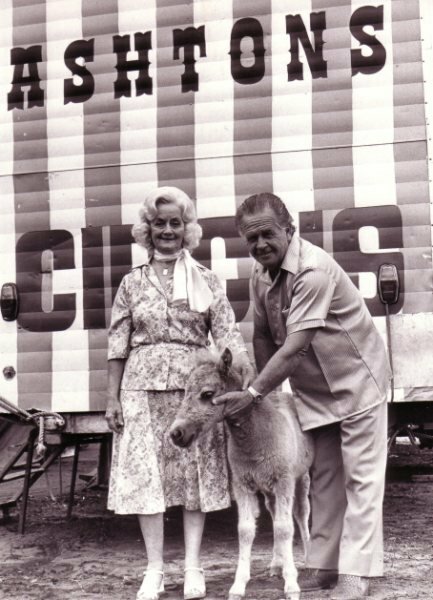 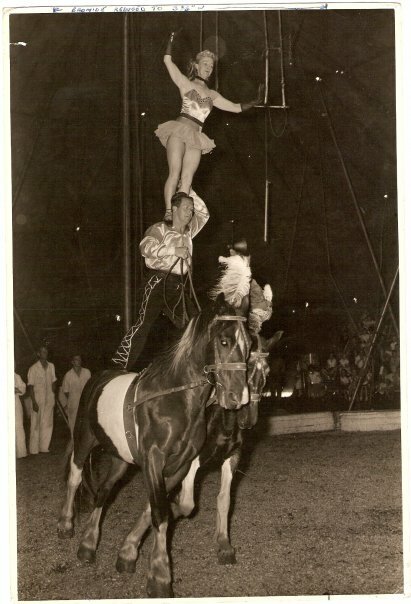 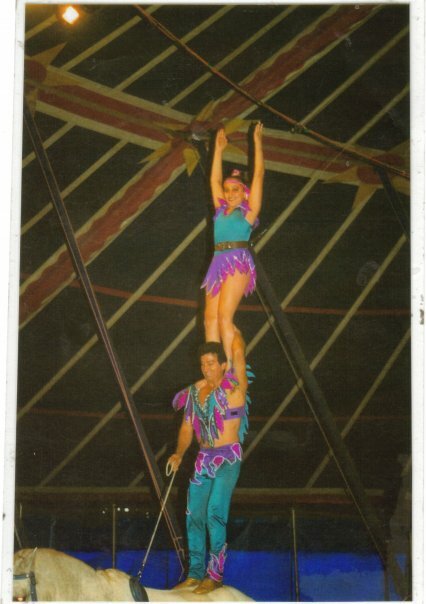 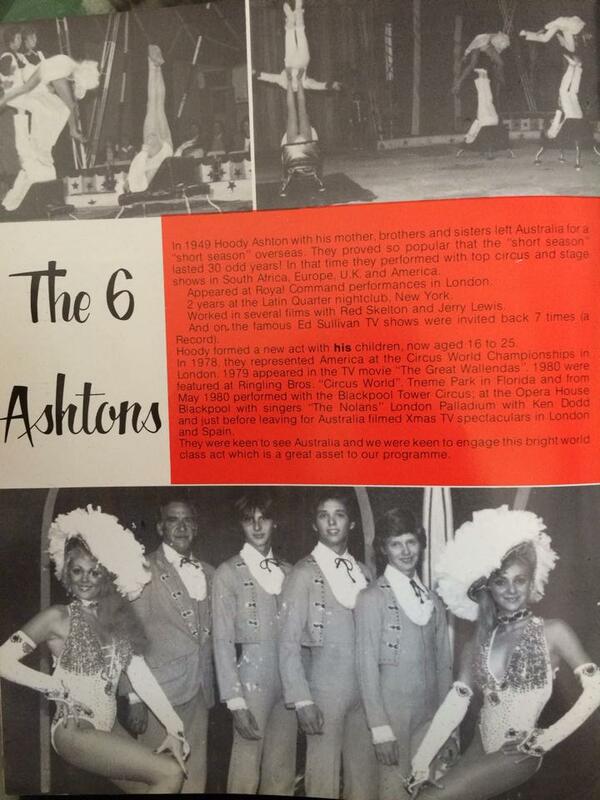 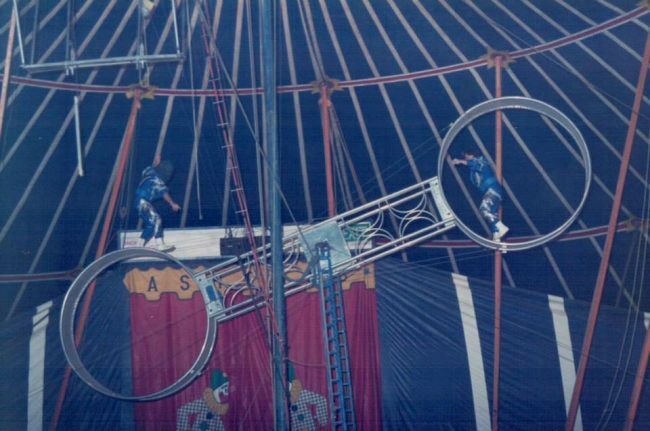 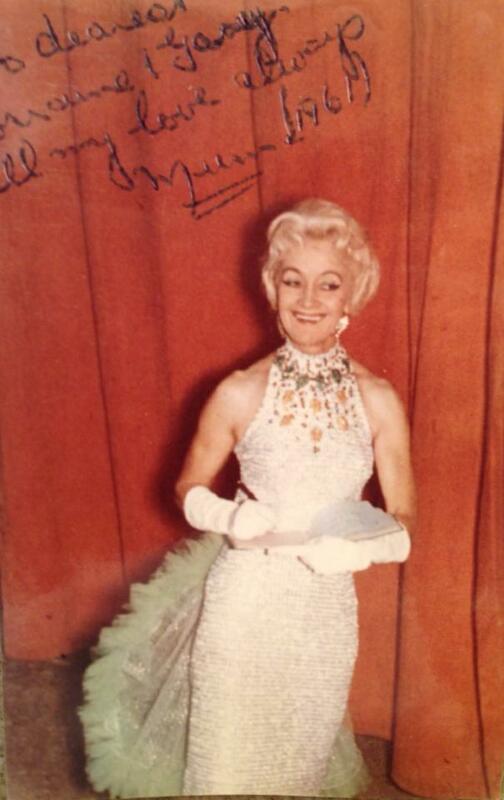 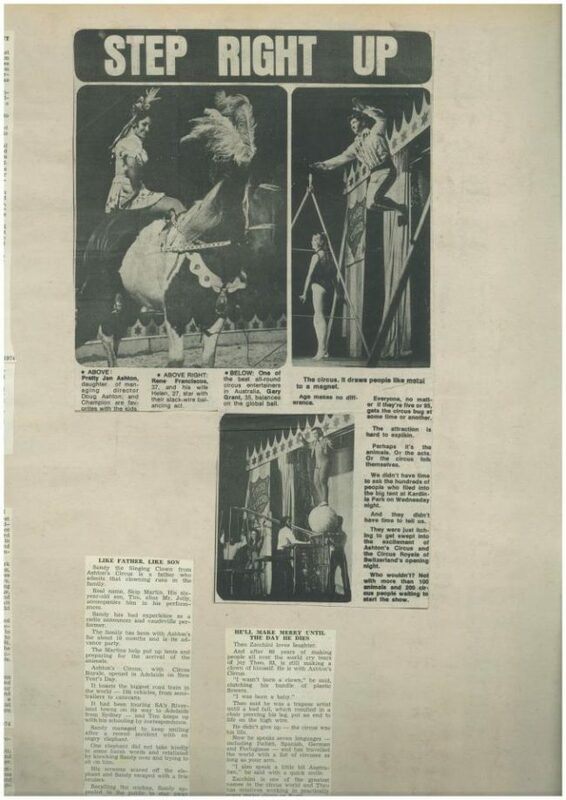 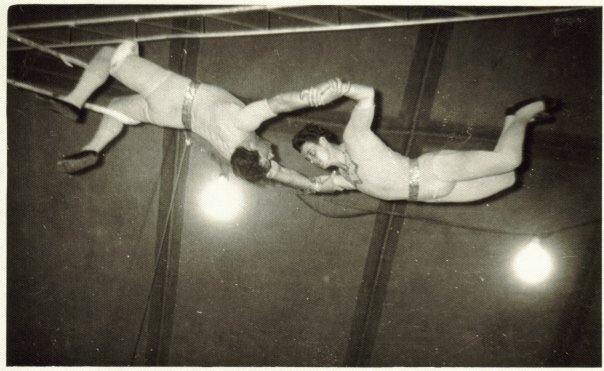 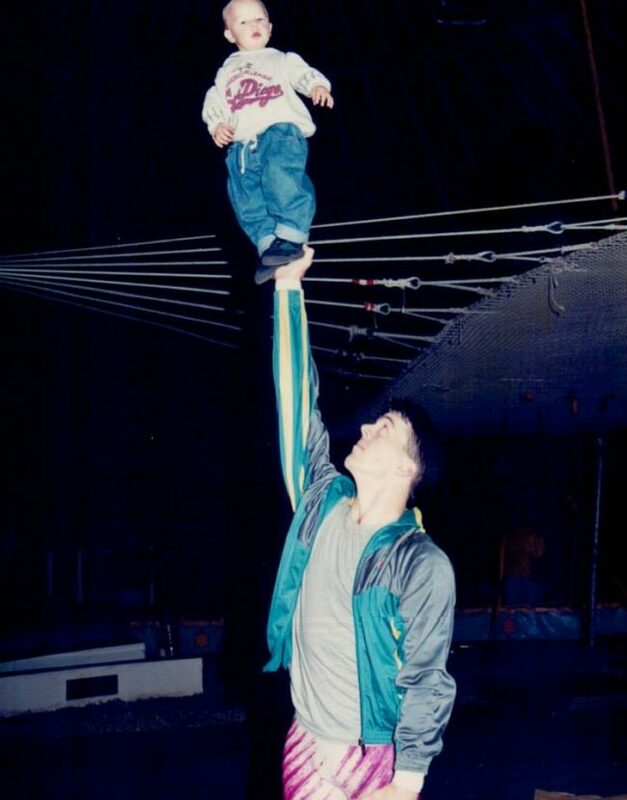 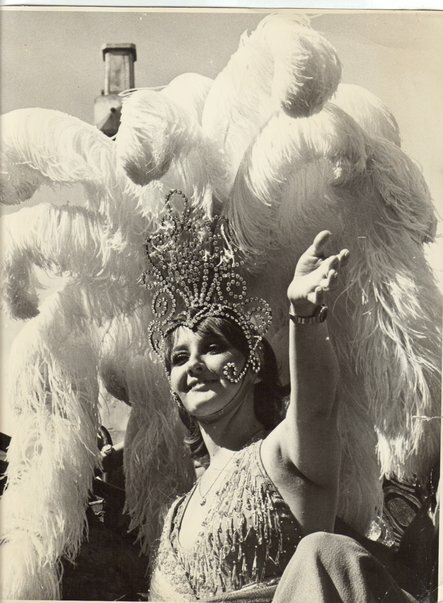 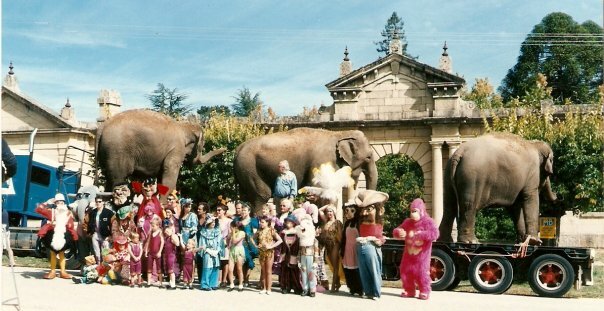 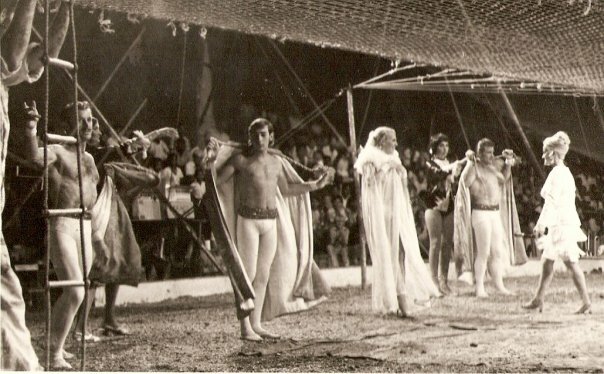 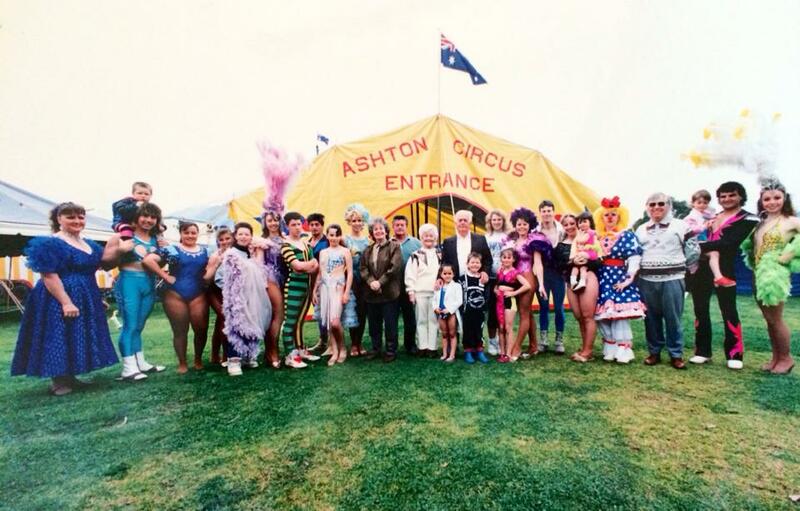 The Ashtons have performed before royalty in England and Europe and have been celebrated at the international Monte Carlo Festival of Circus by Prince Rainier himself. 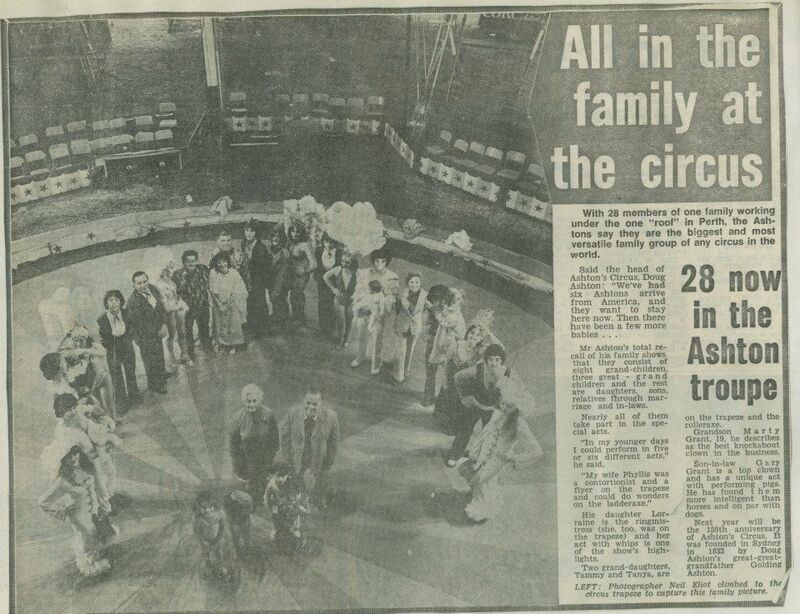 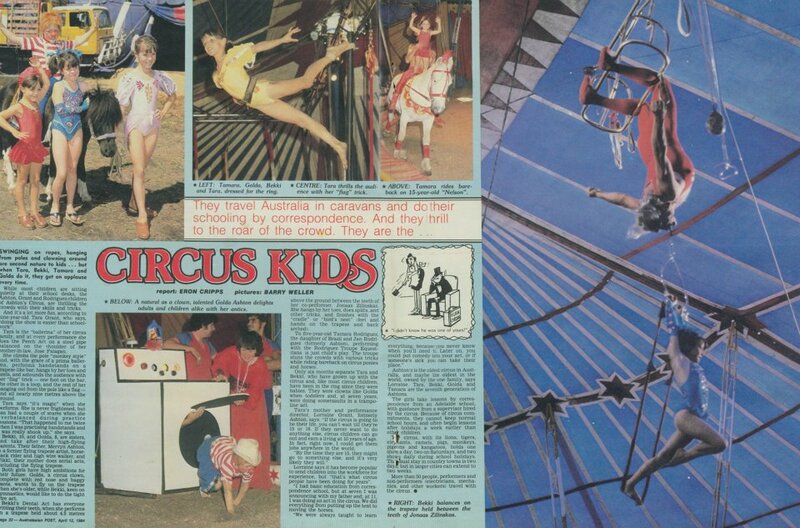 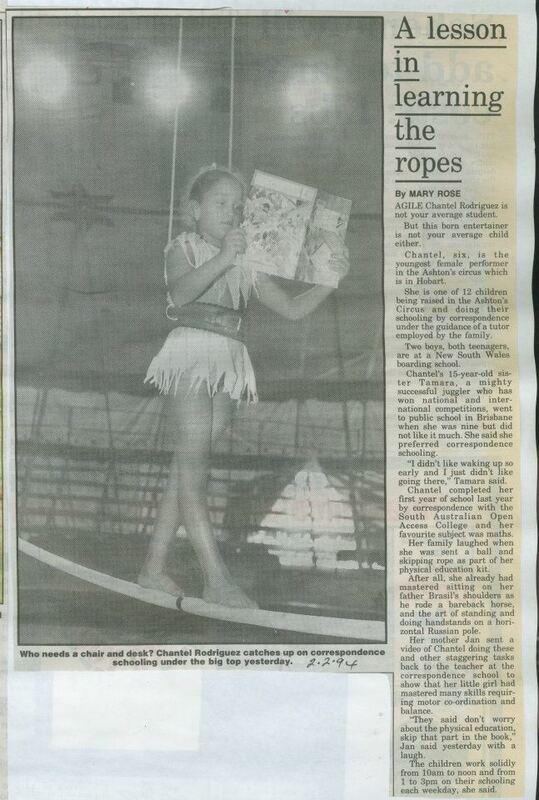 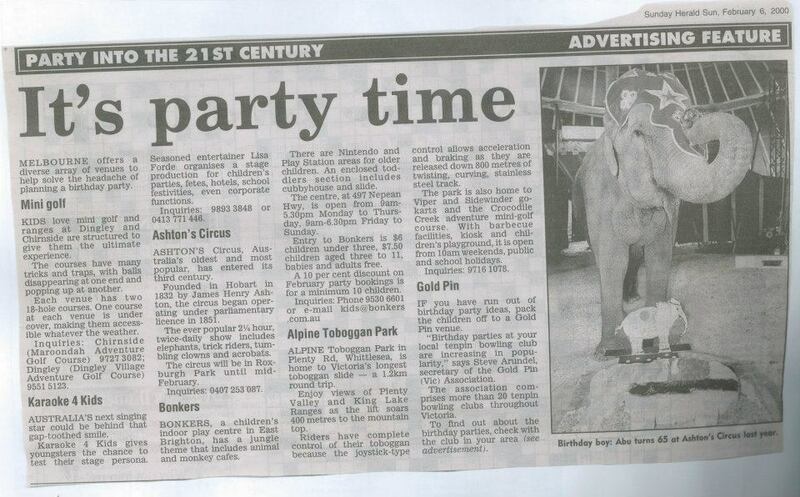 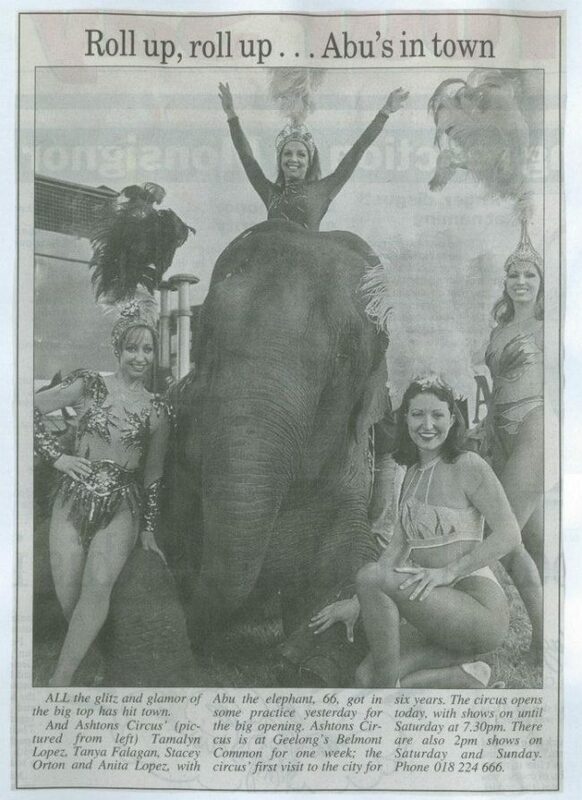 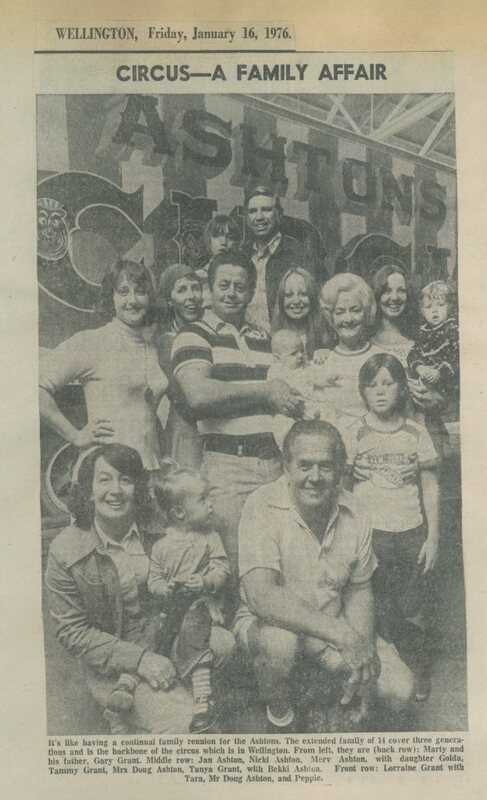 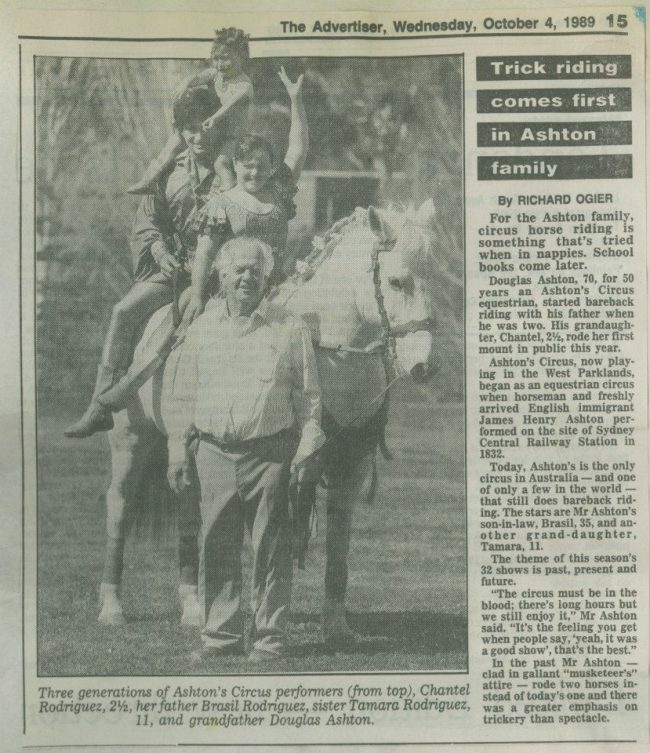 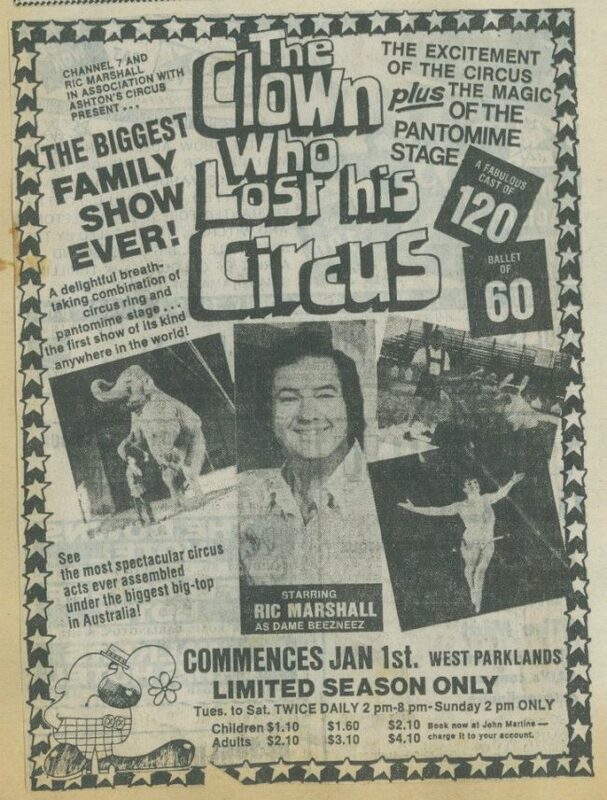 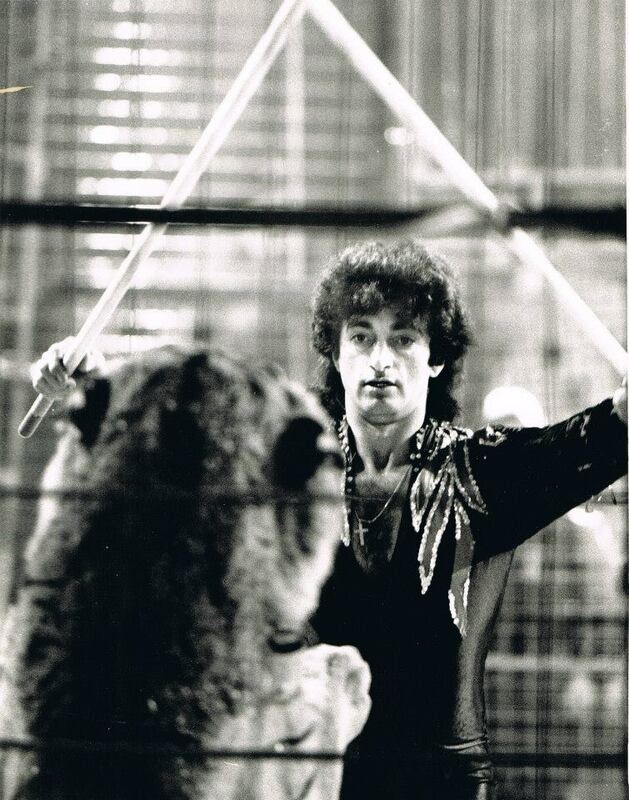 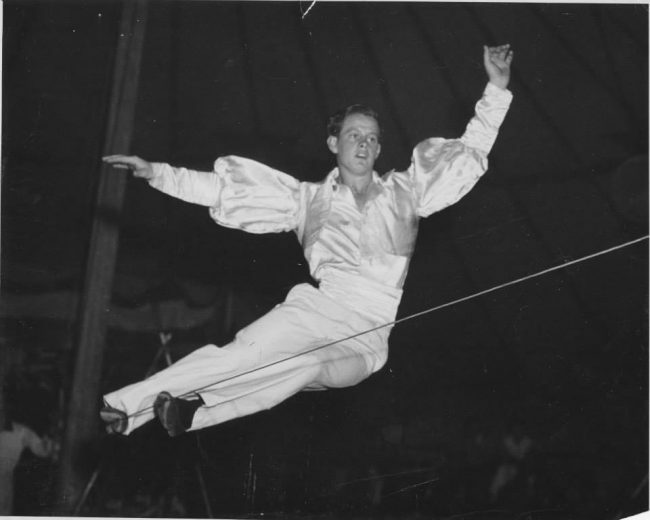 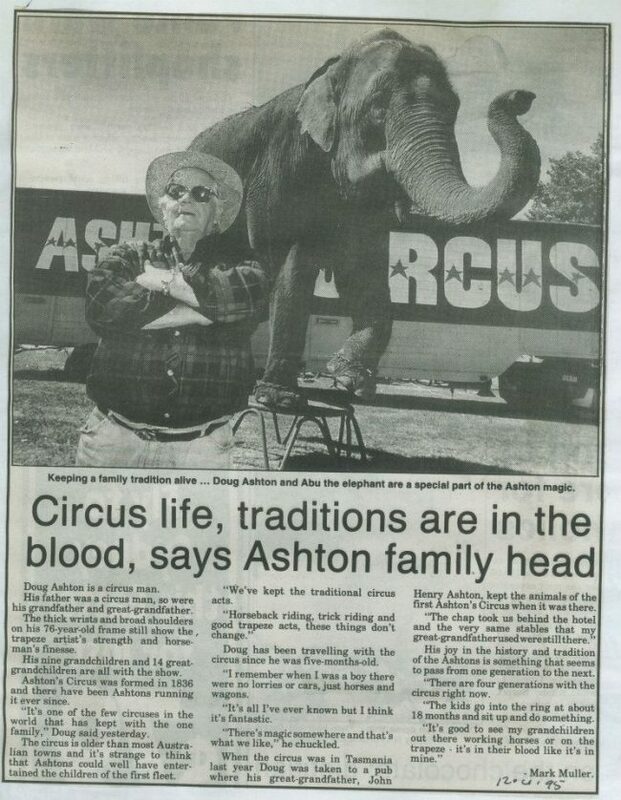 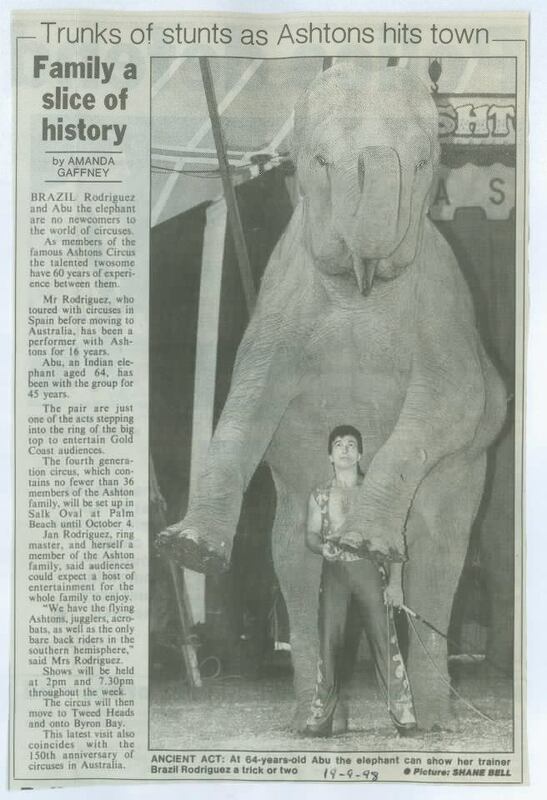 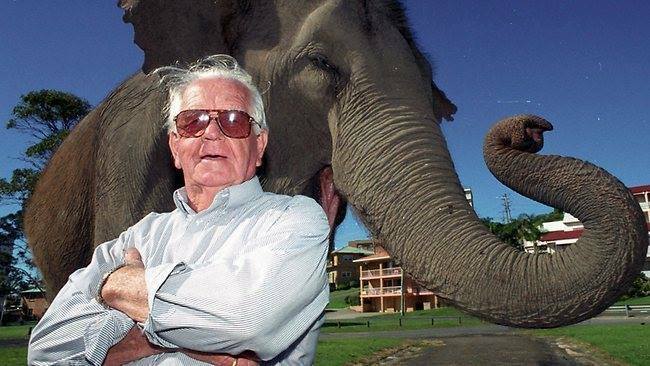 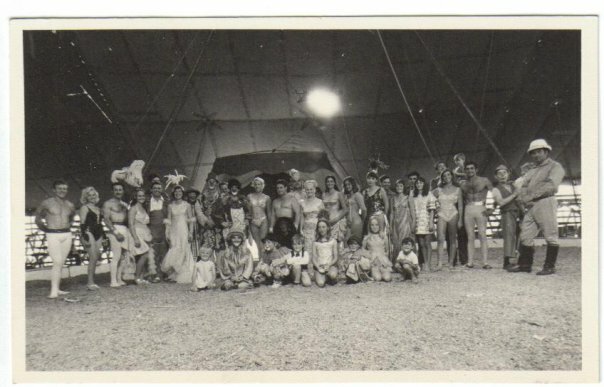 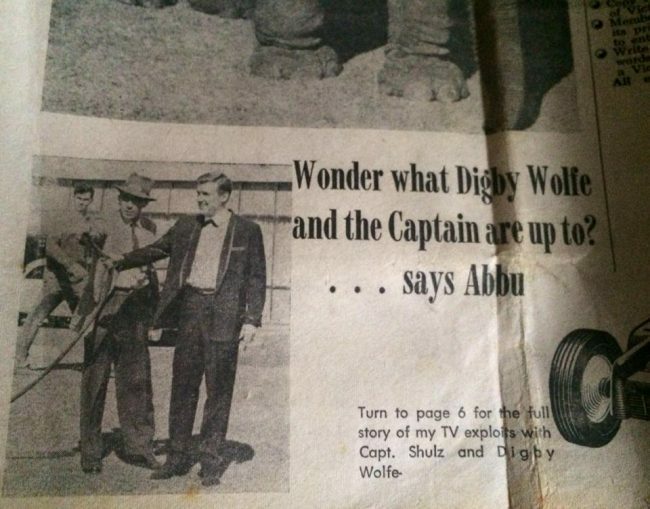 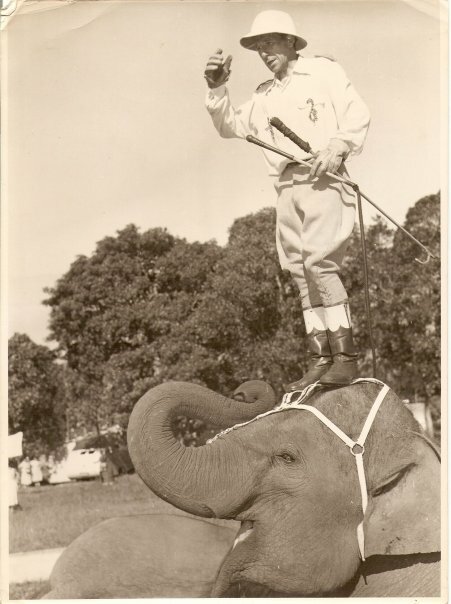 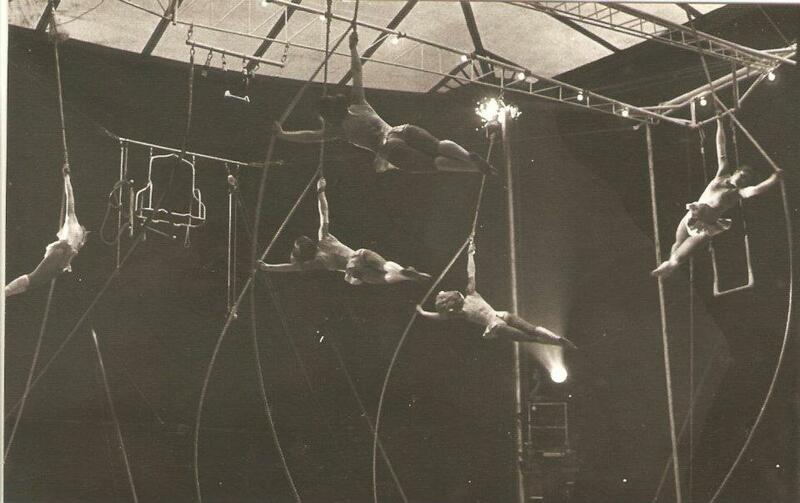 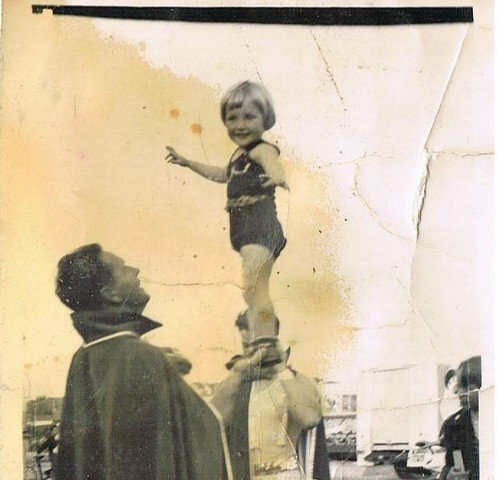 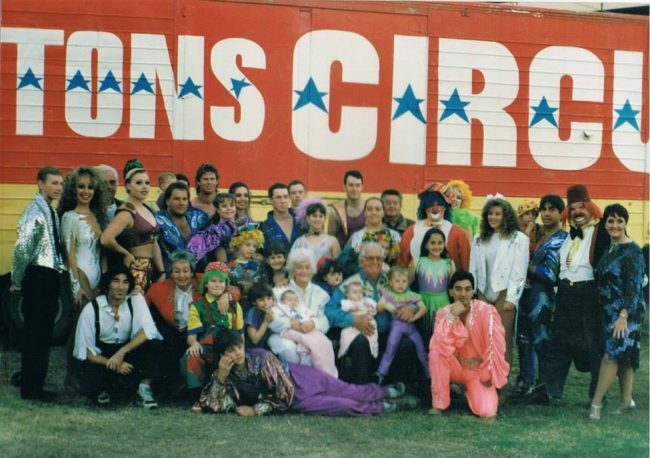 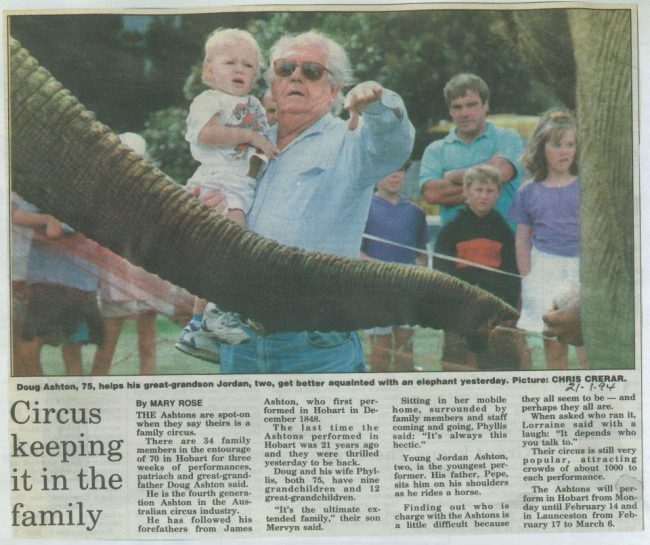 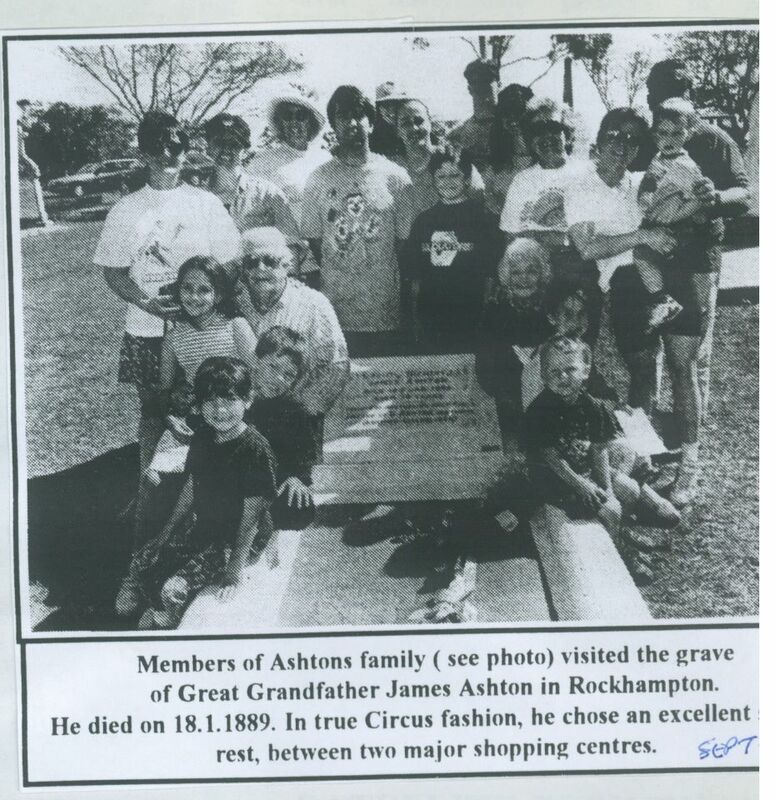 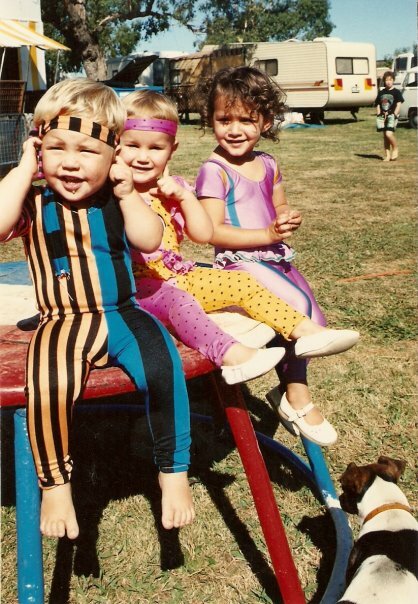 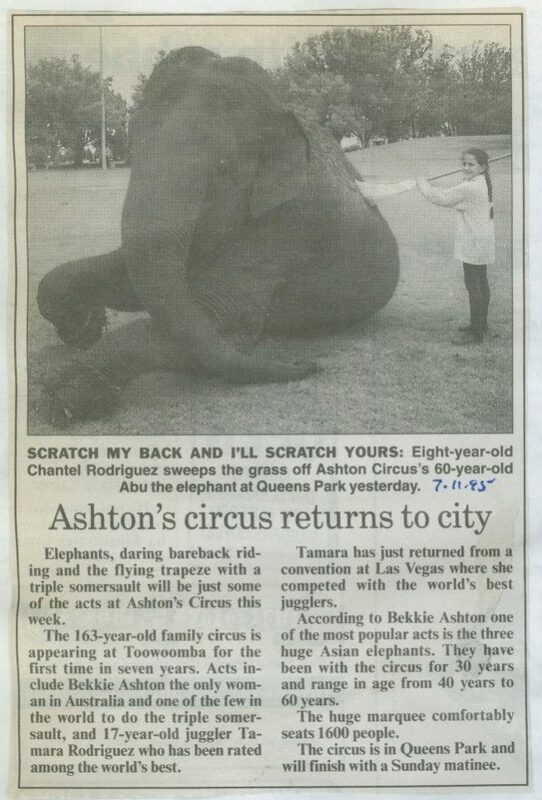 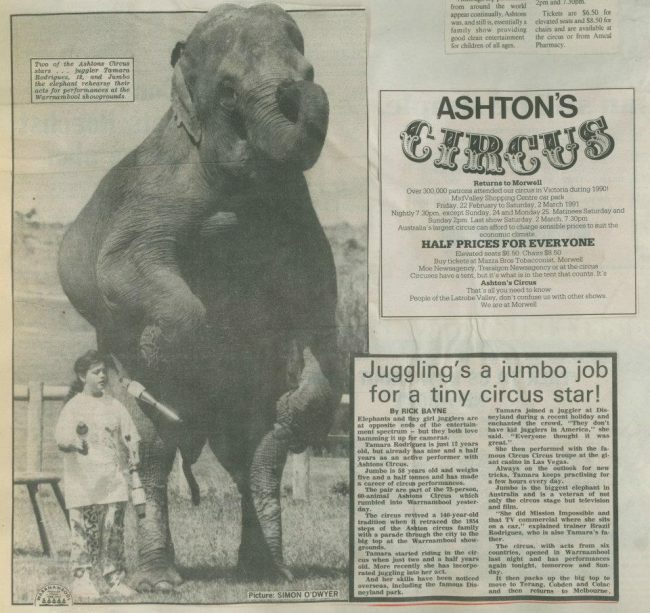 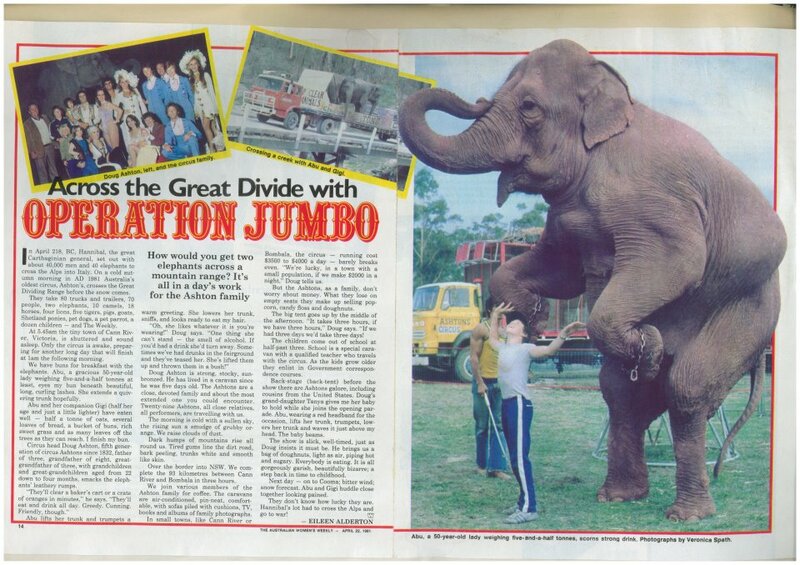 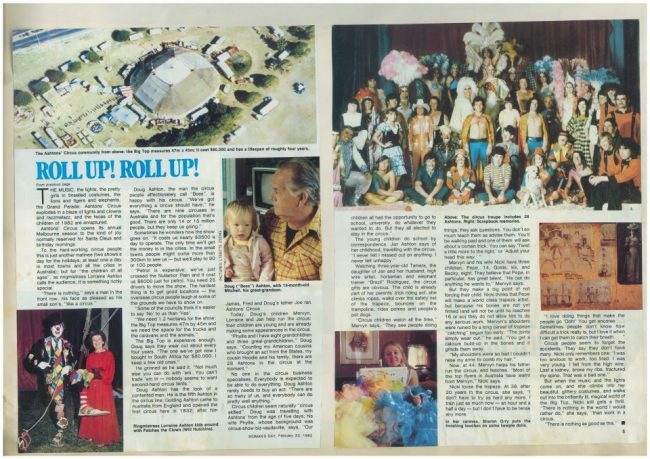 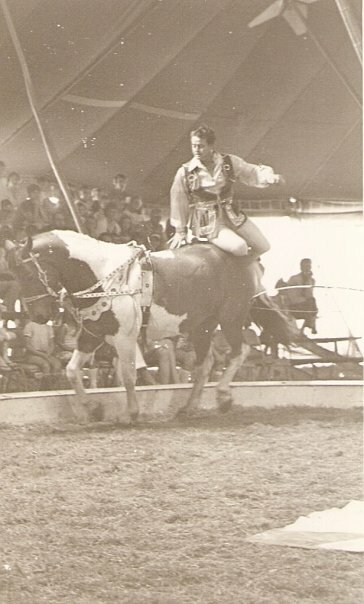 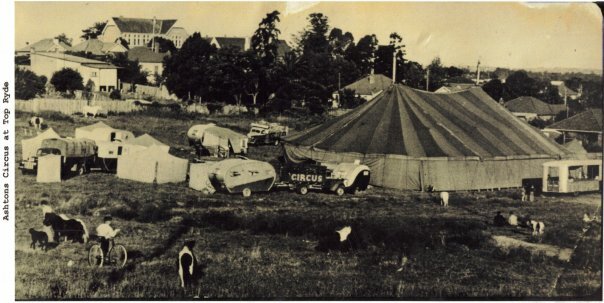 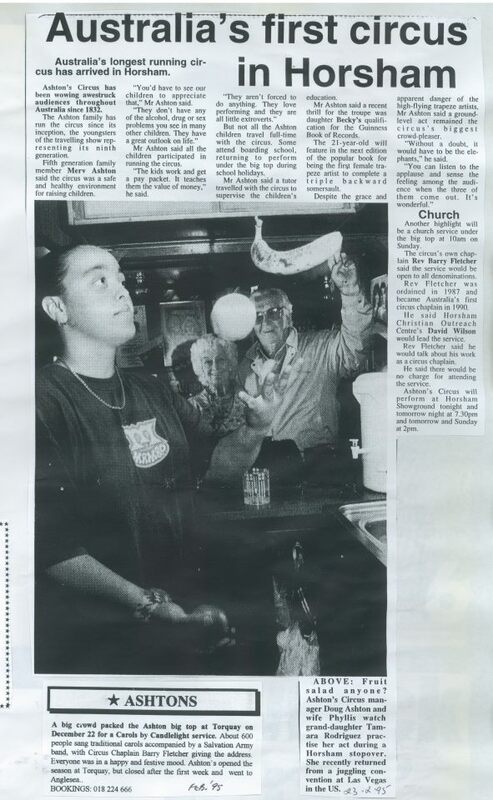 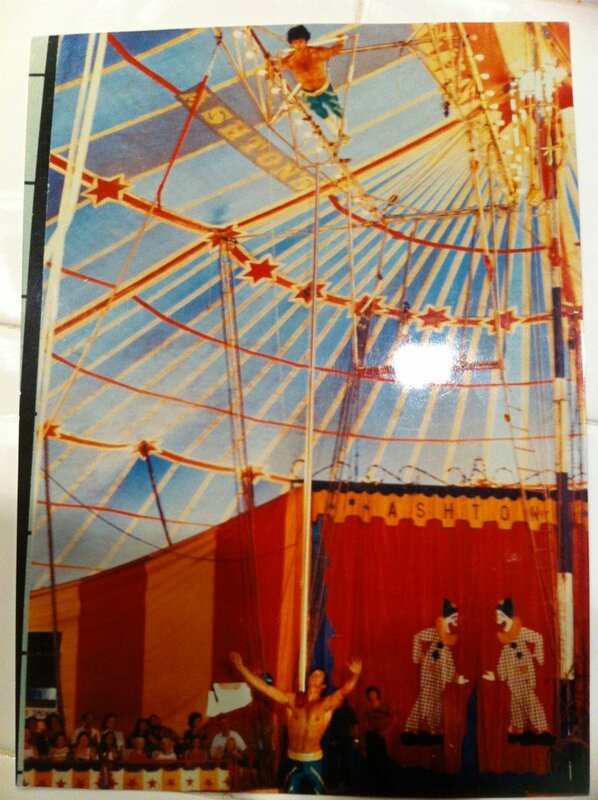 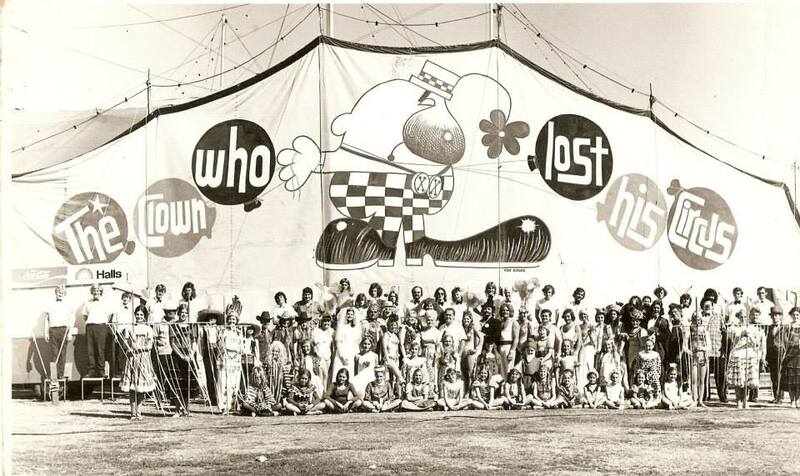 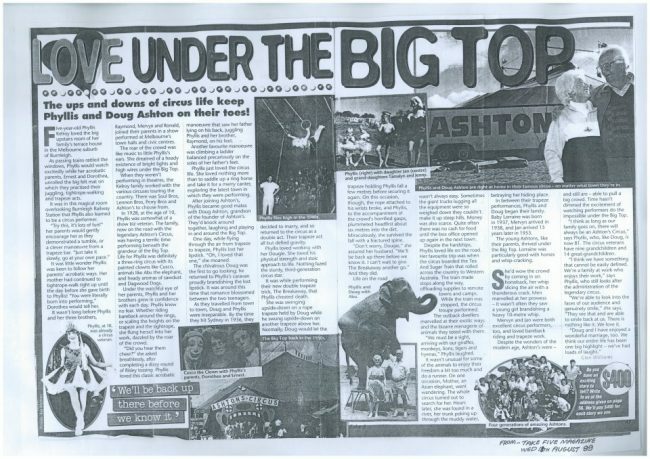 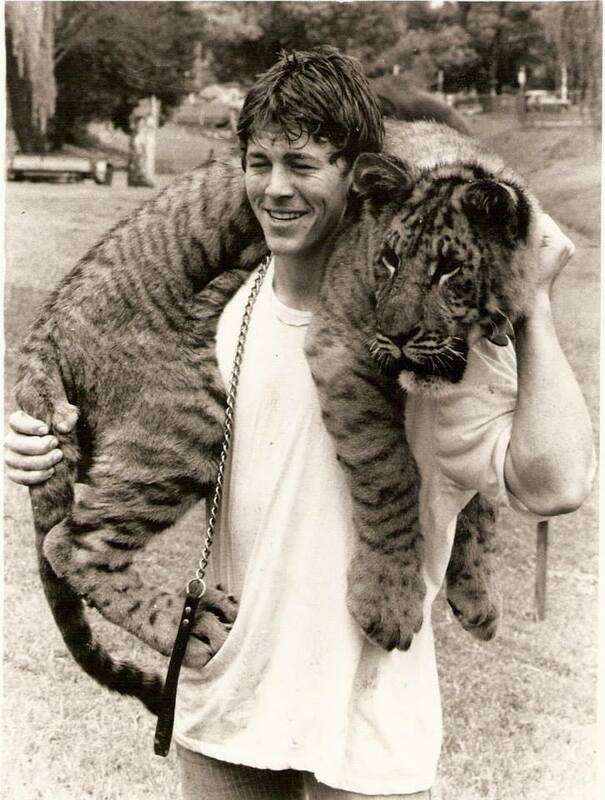 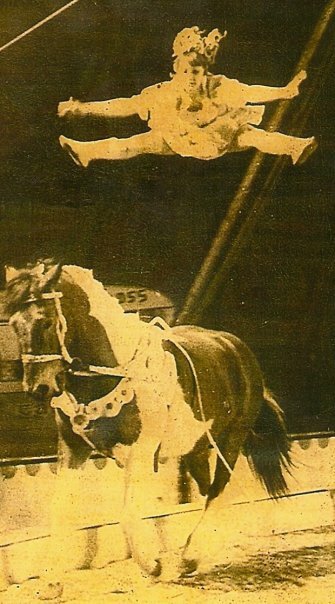 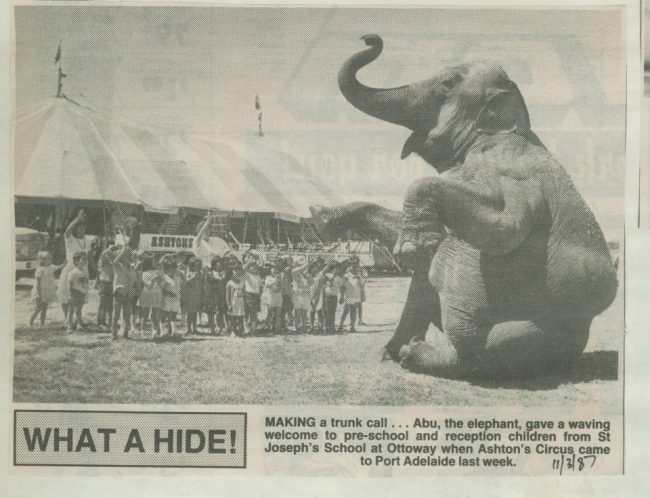 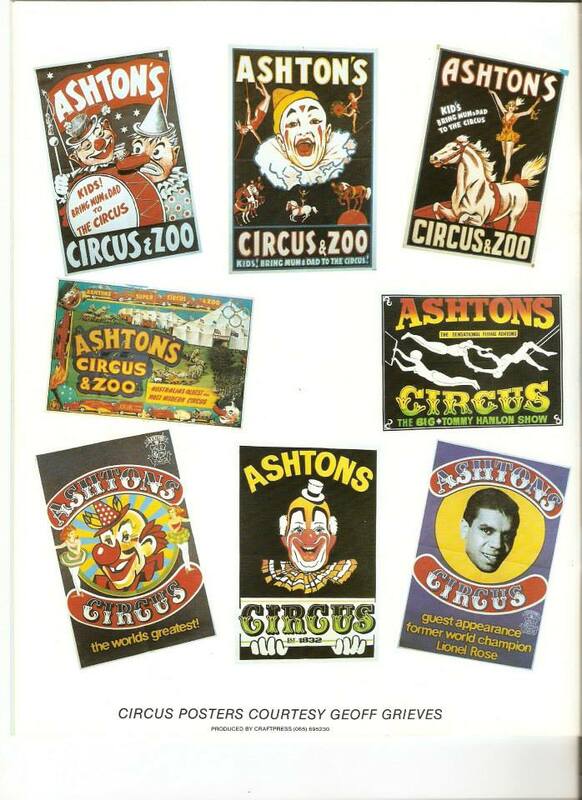 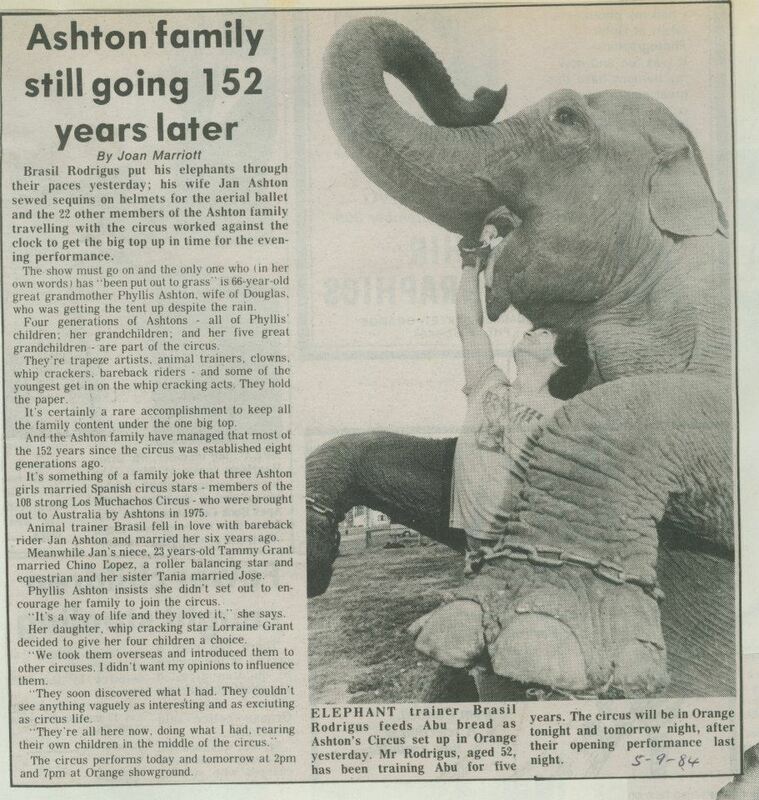 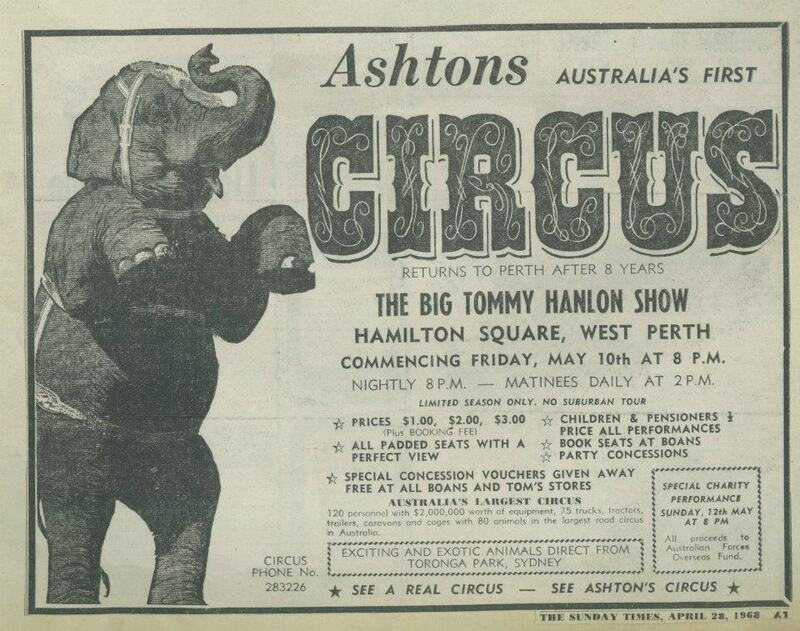 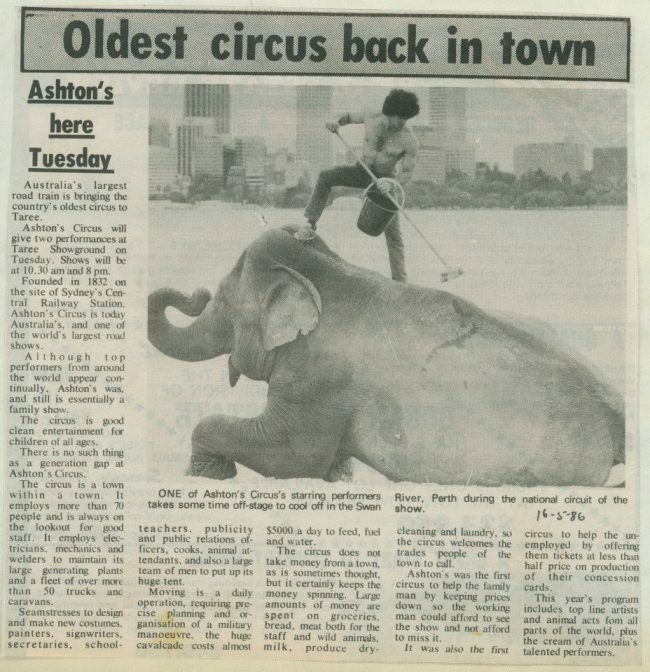 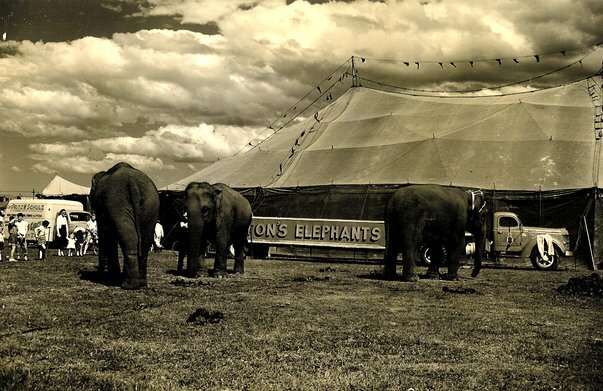 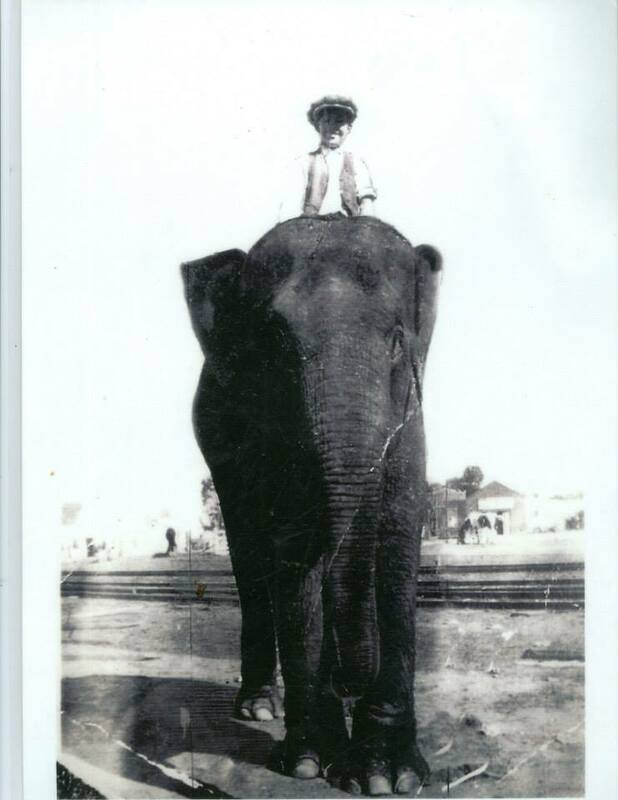 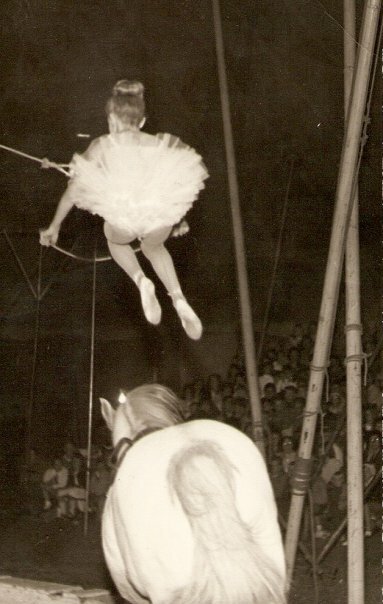 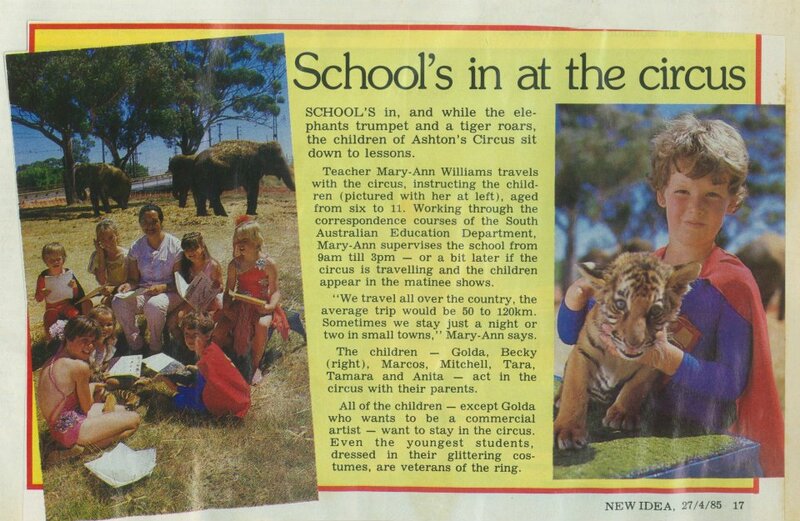 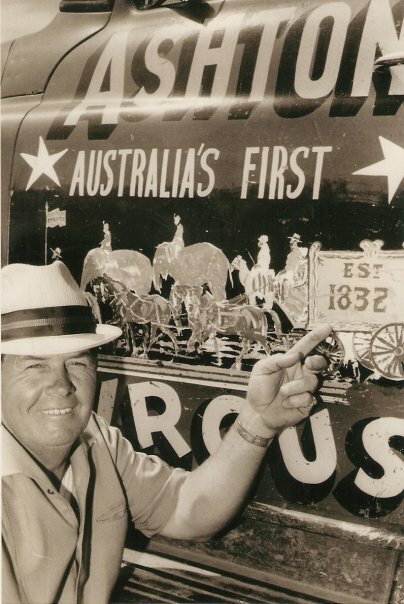 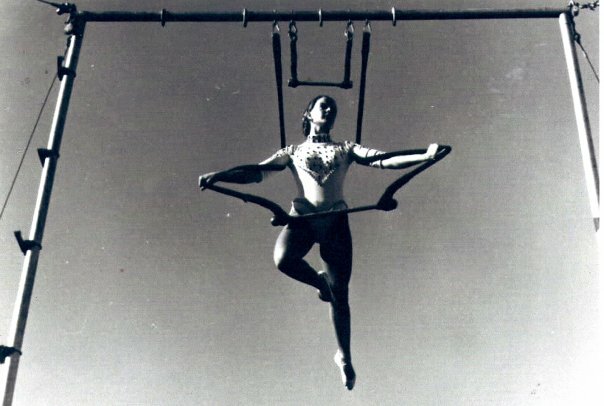 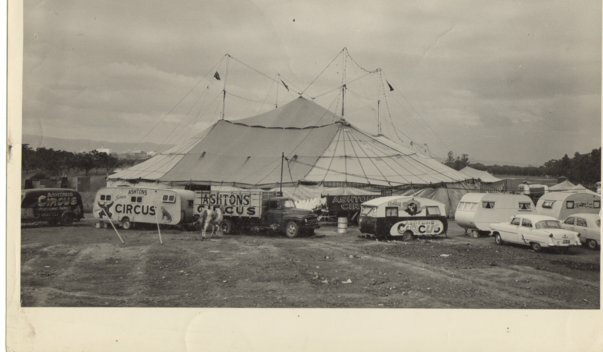 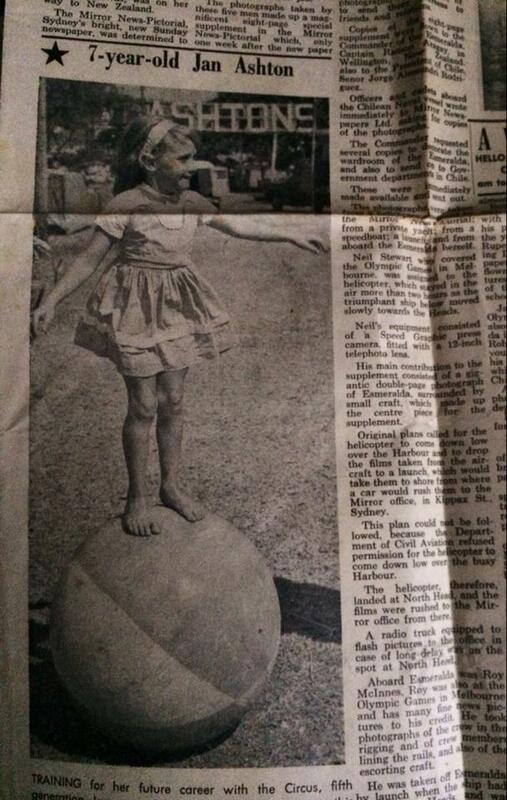 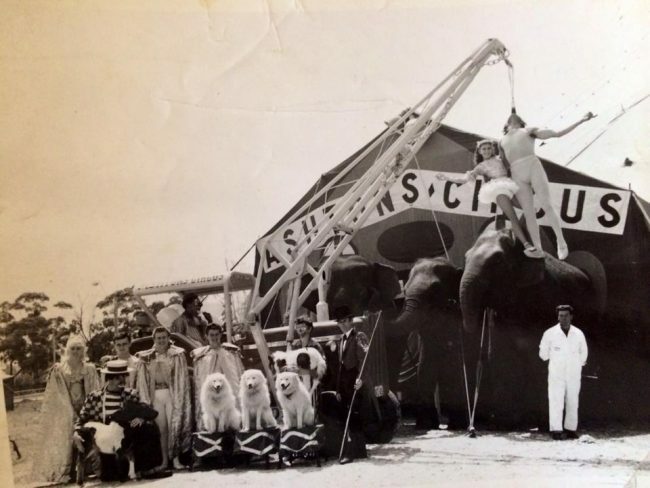 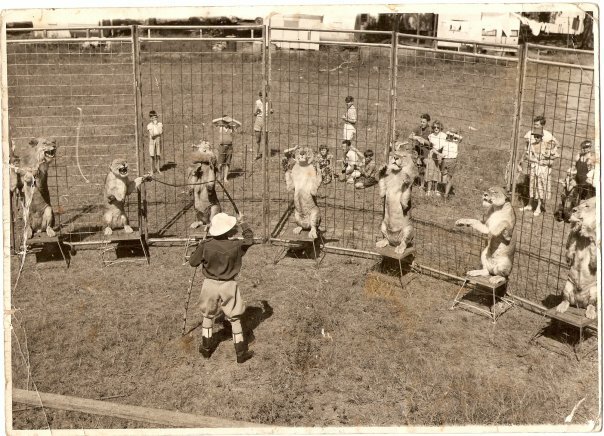 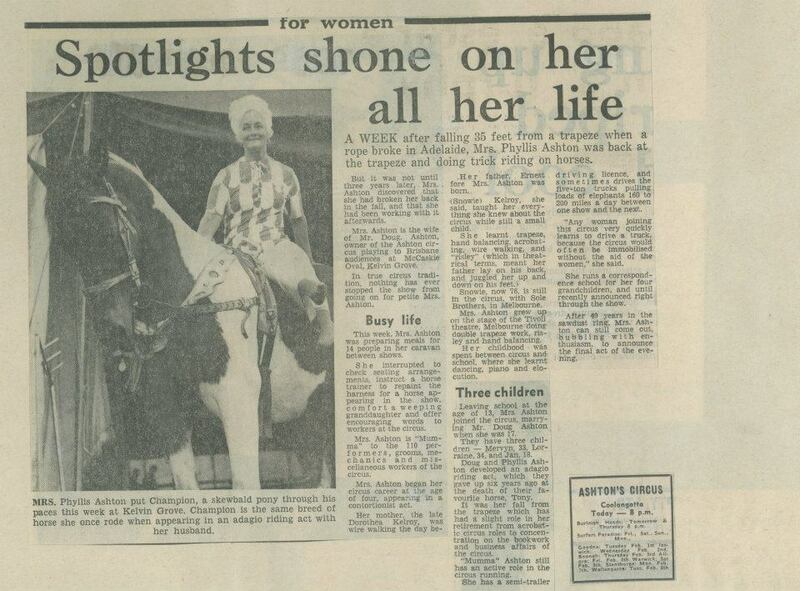 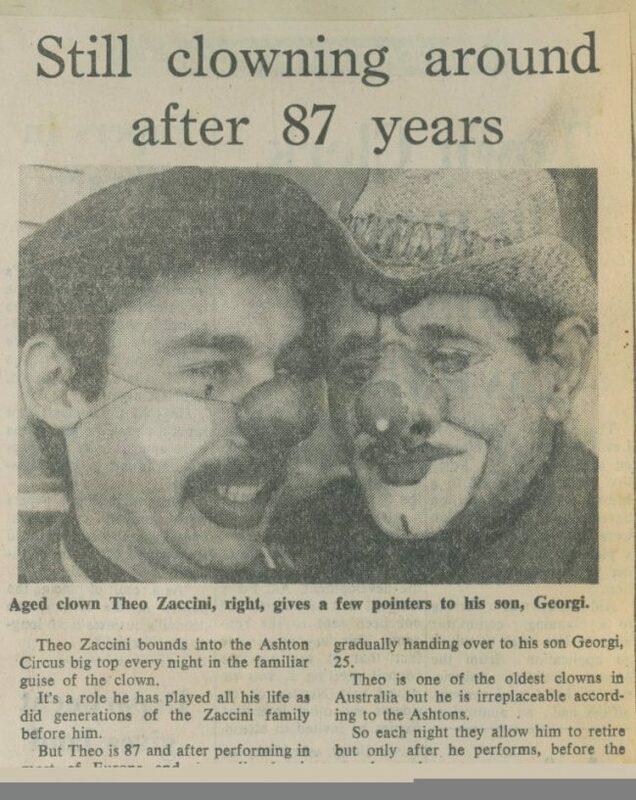 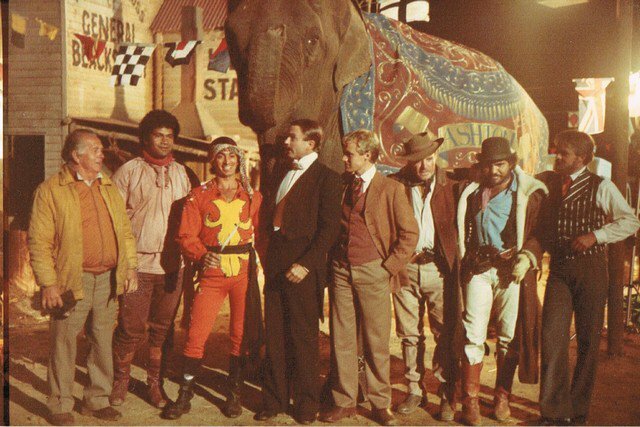 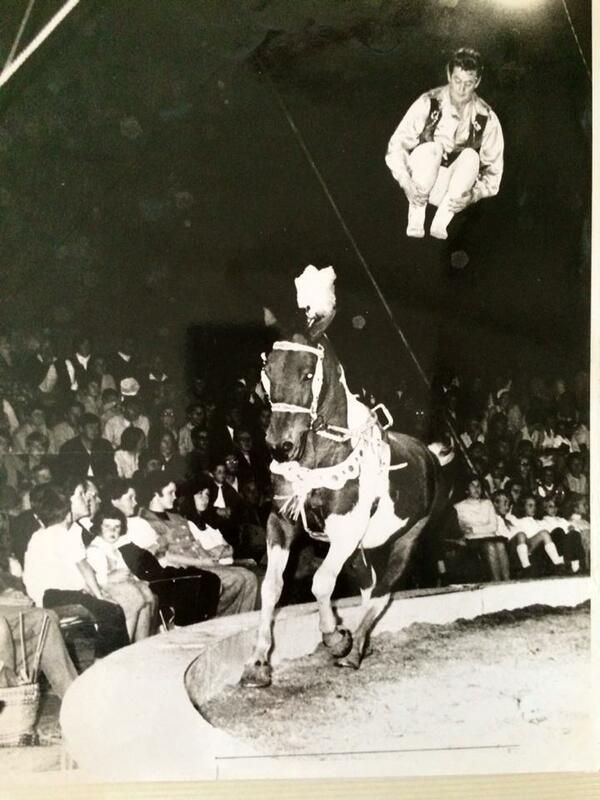 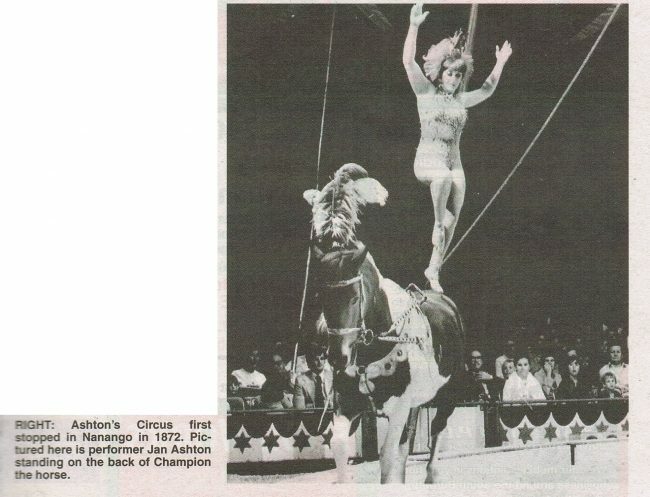 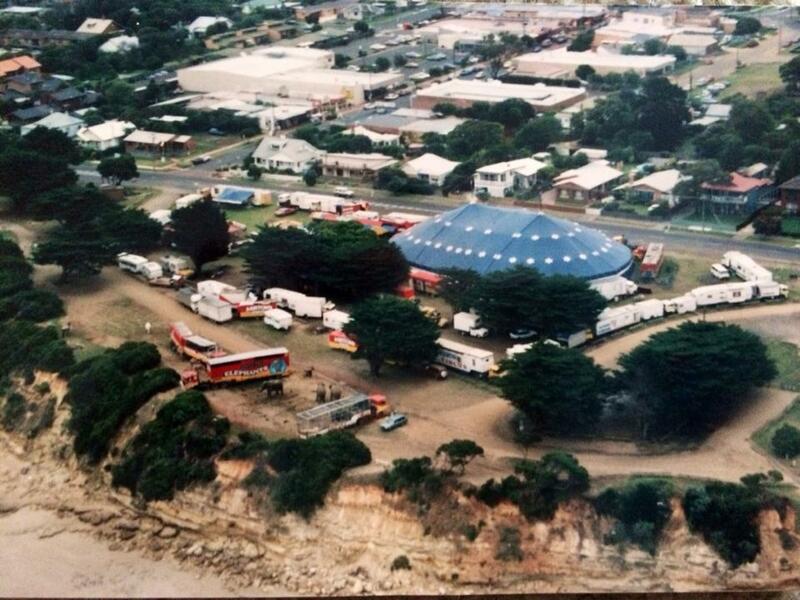 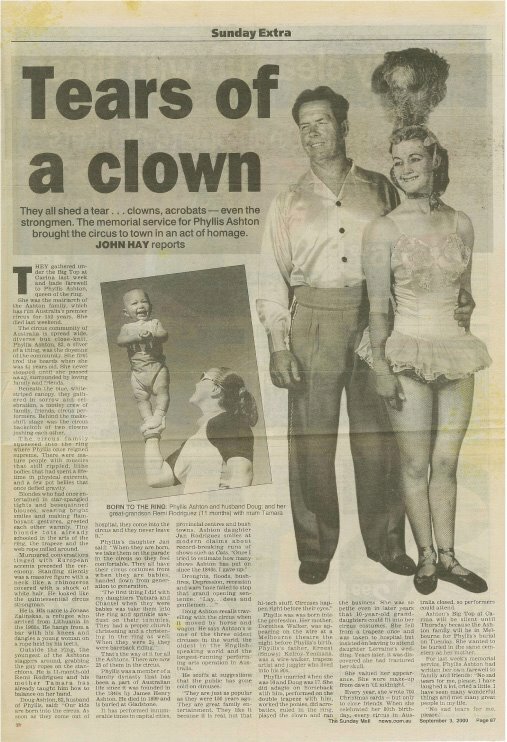 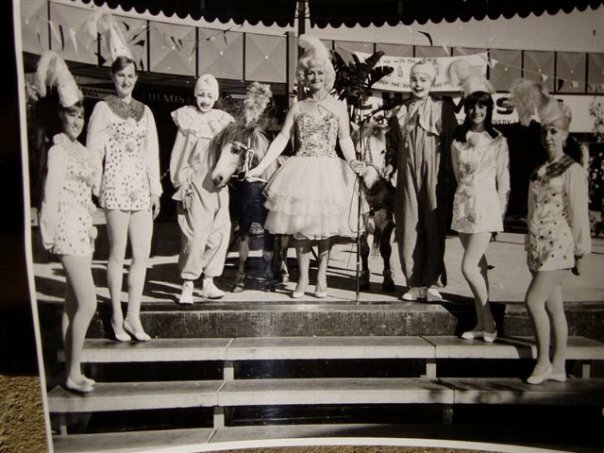 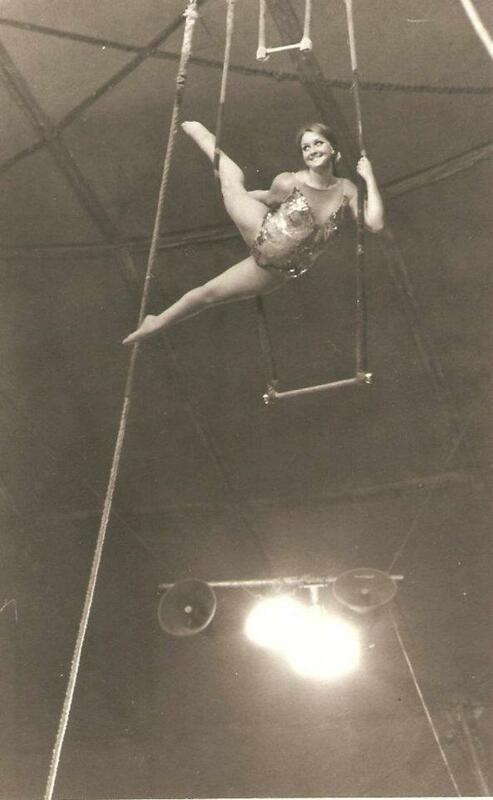 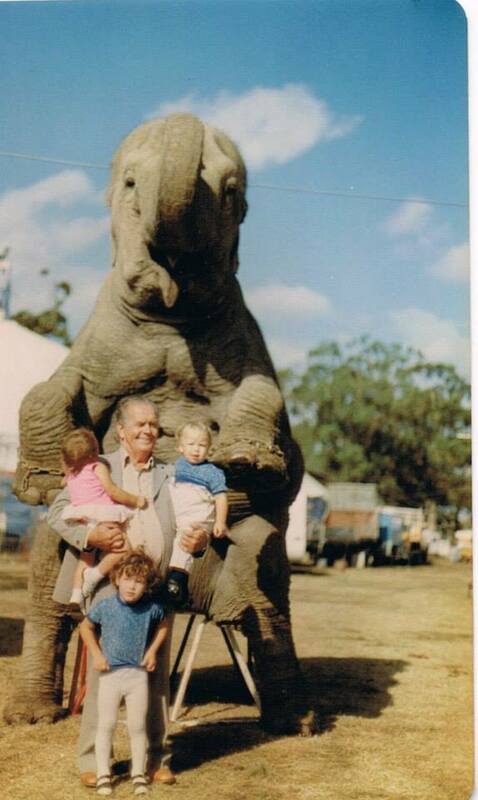 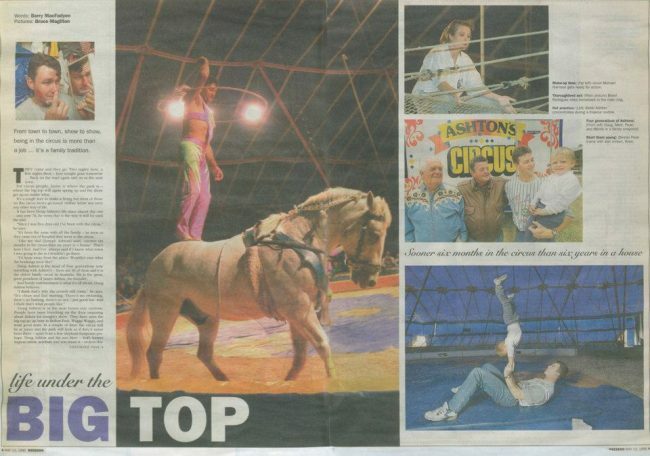 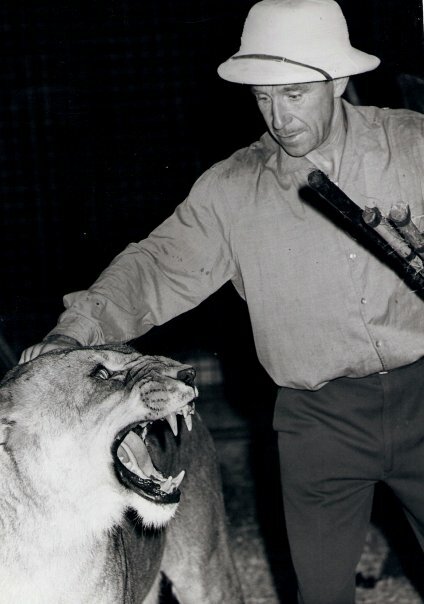 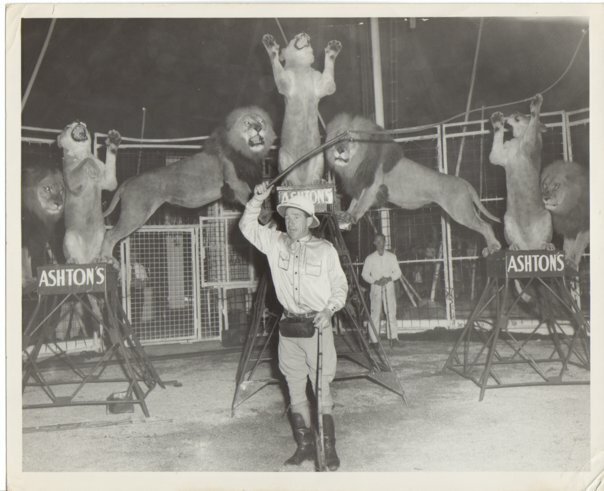 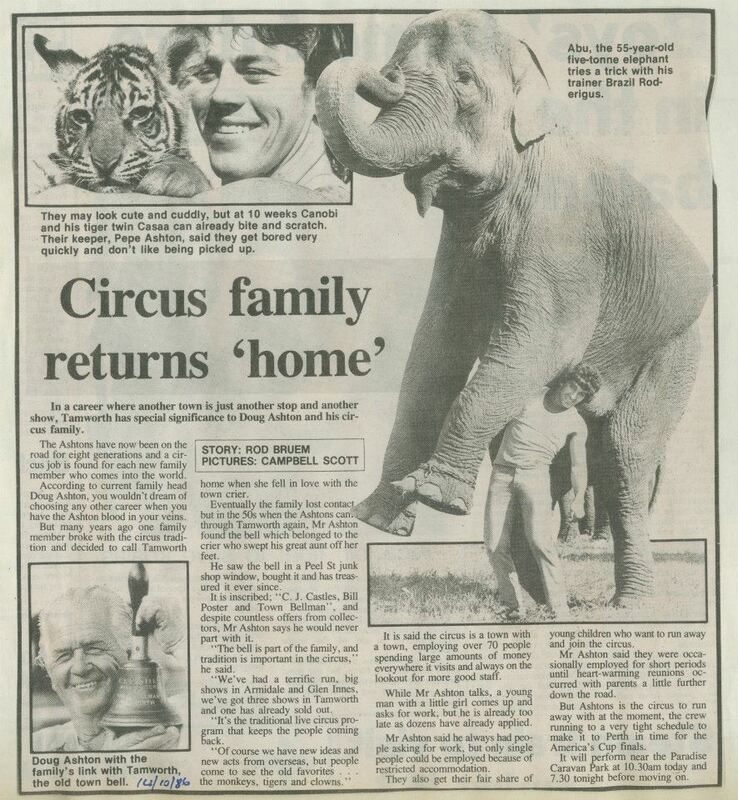 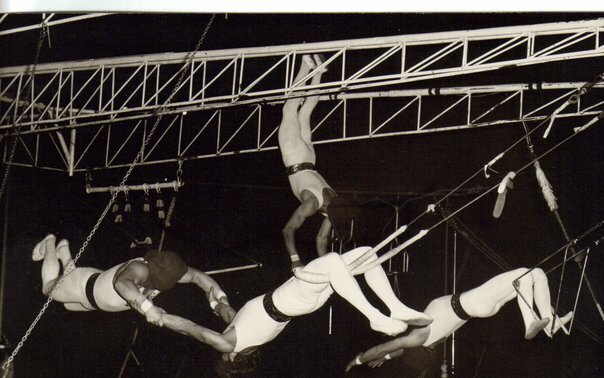 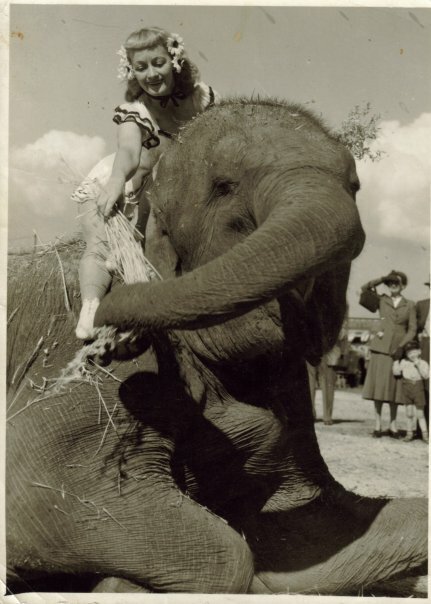 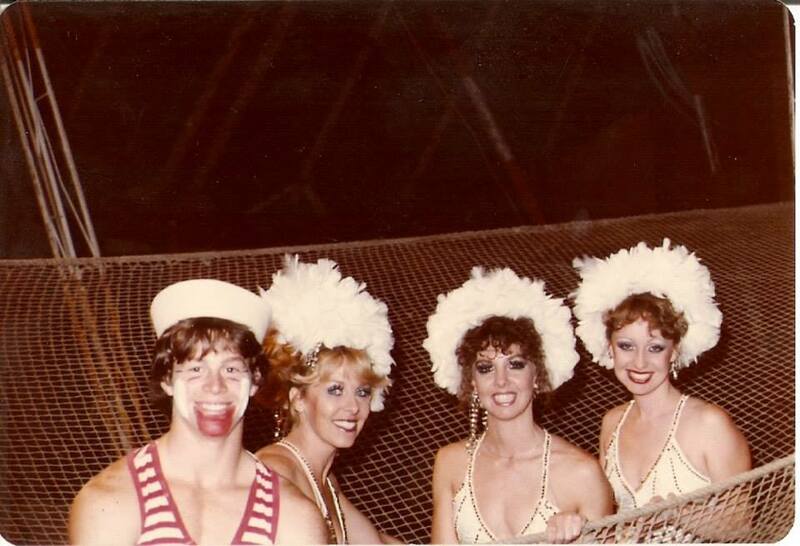 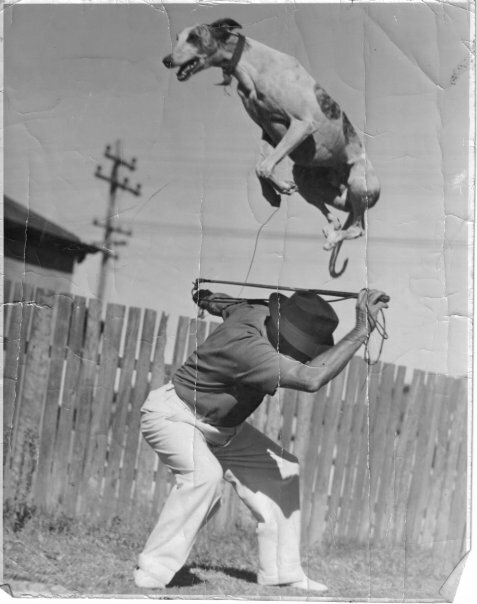 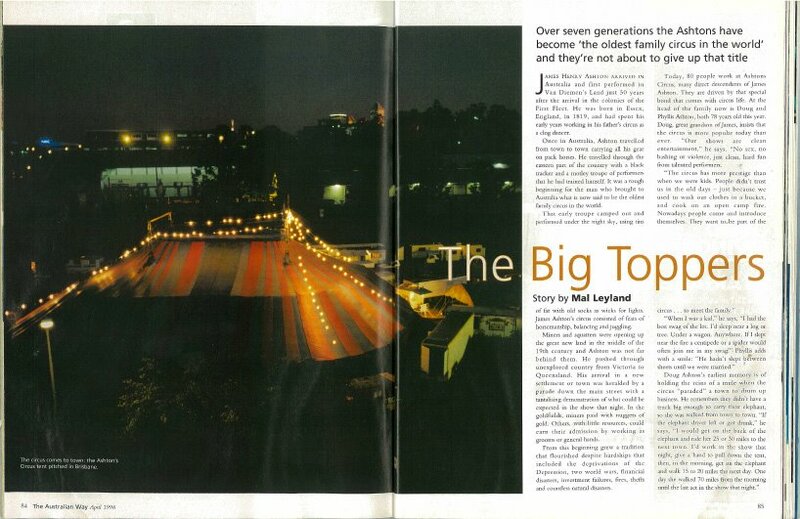 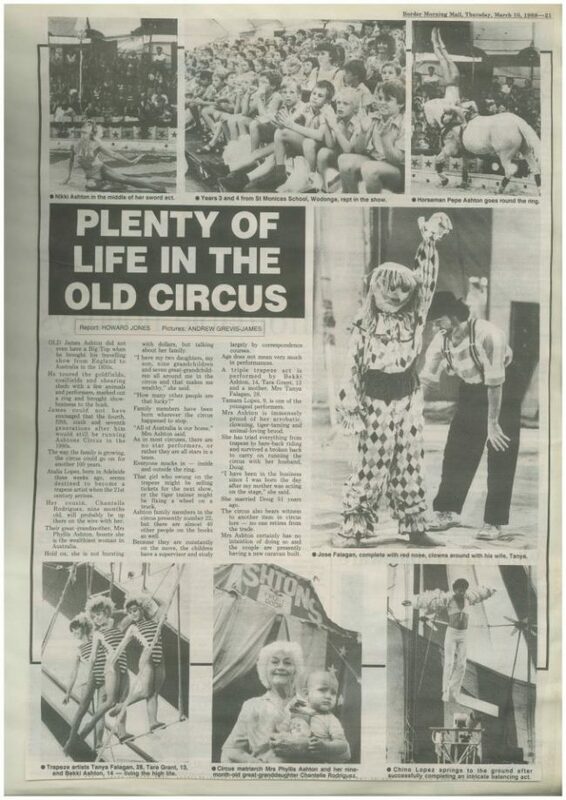 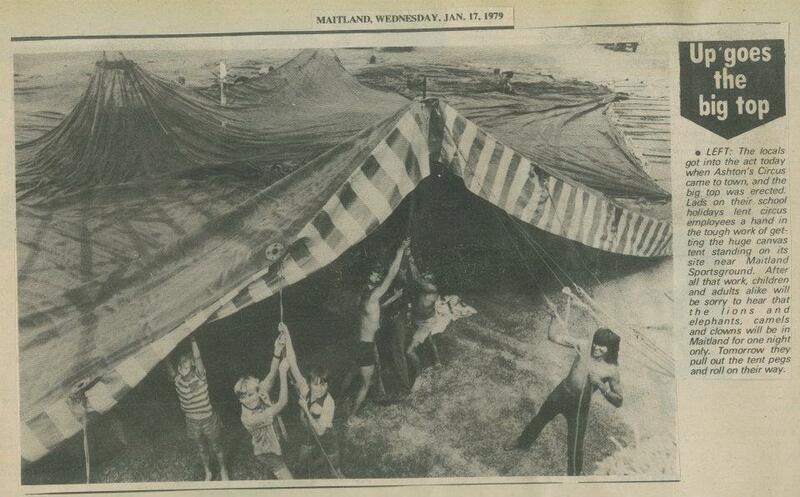 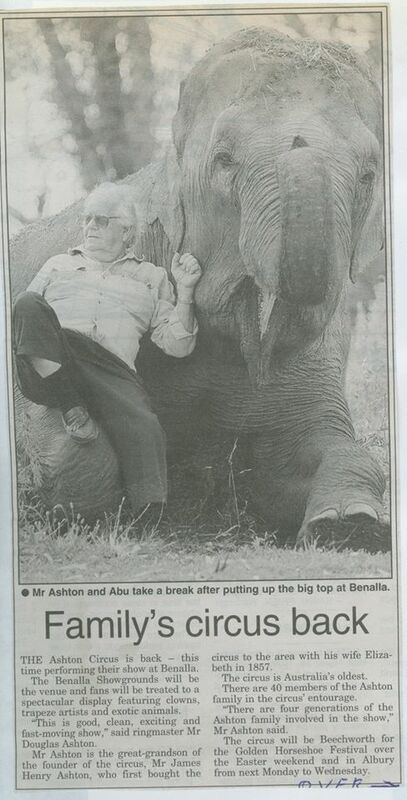 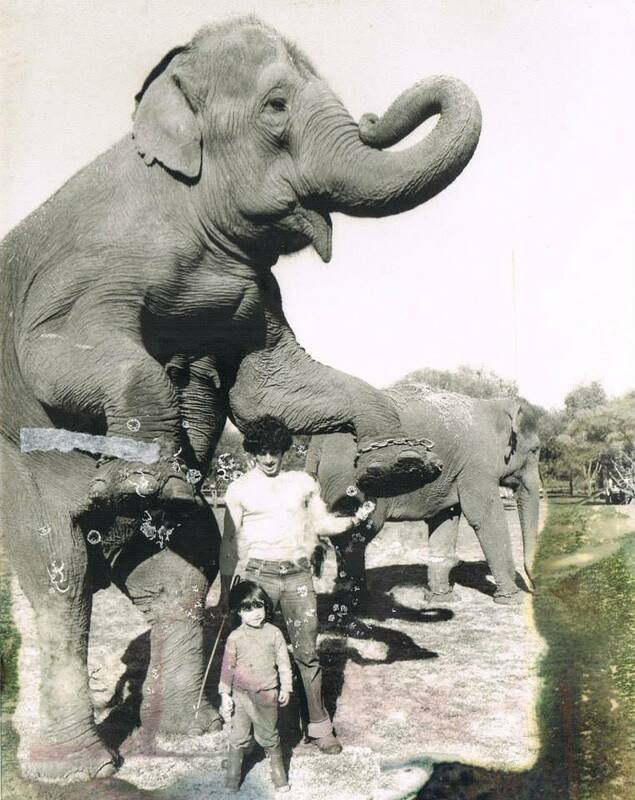 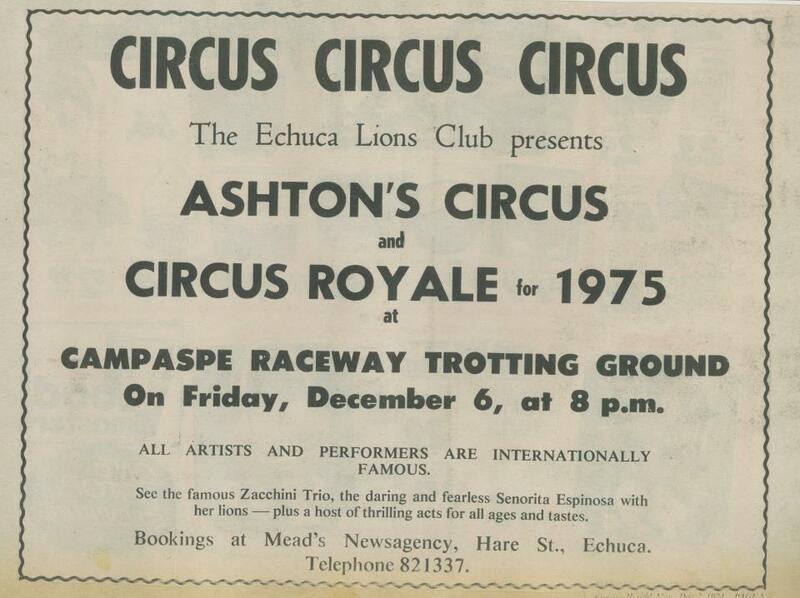 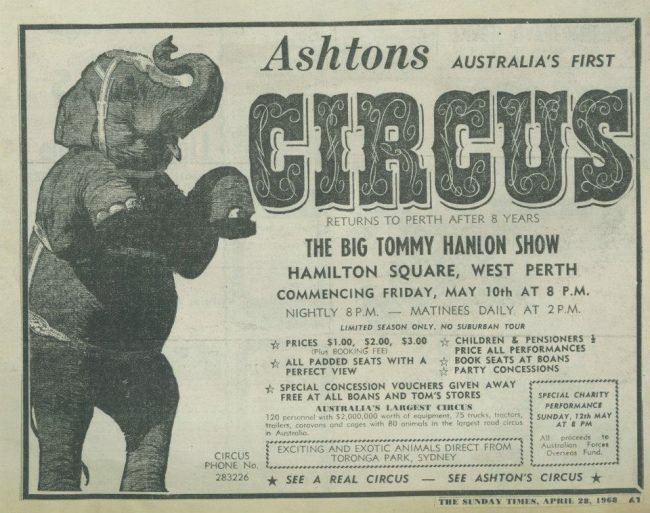 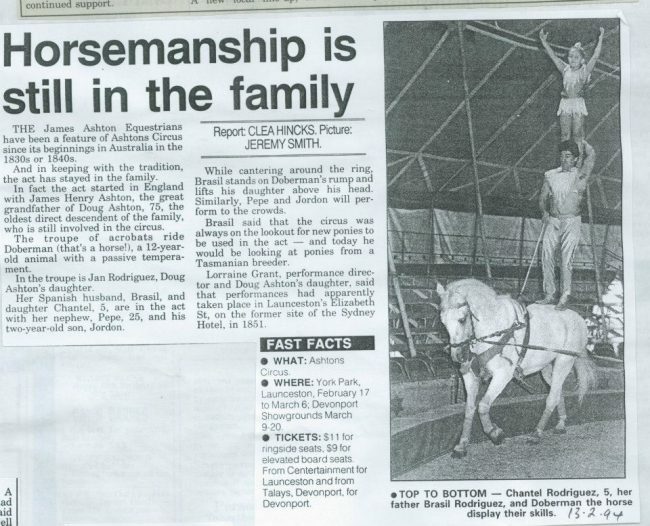 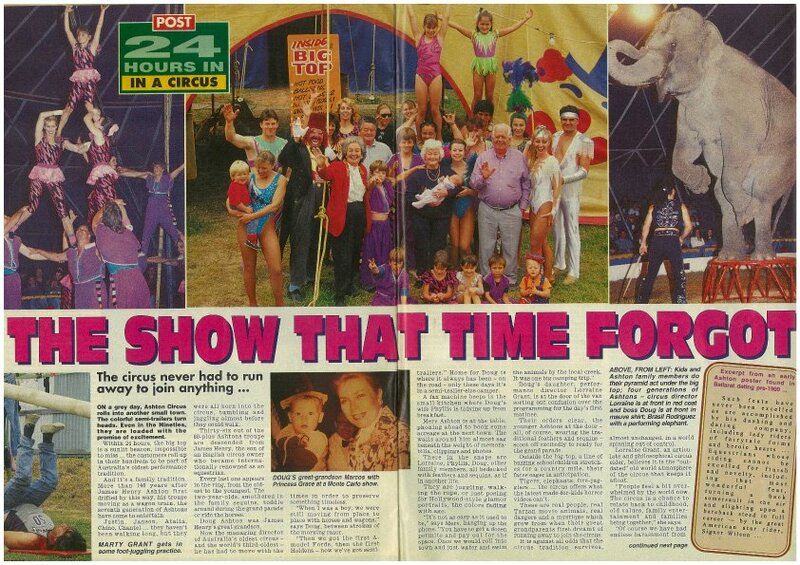 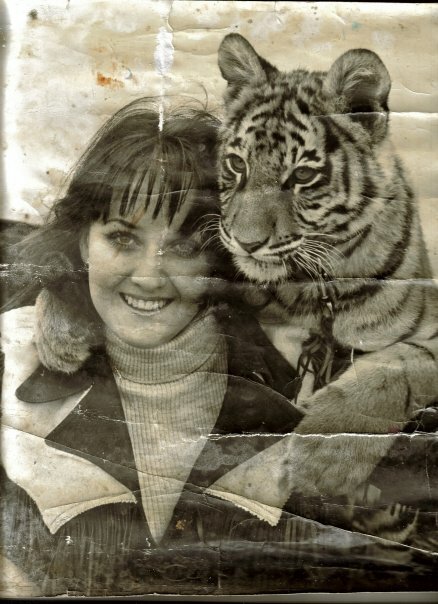 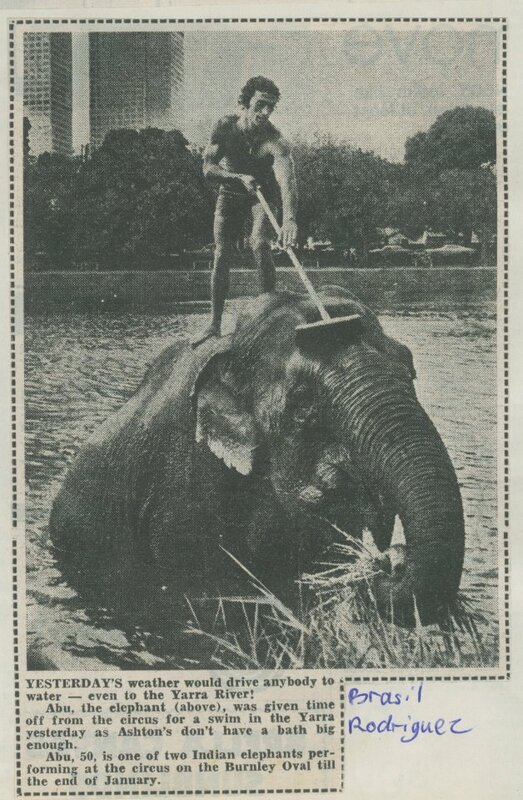 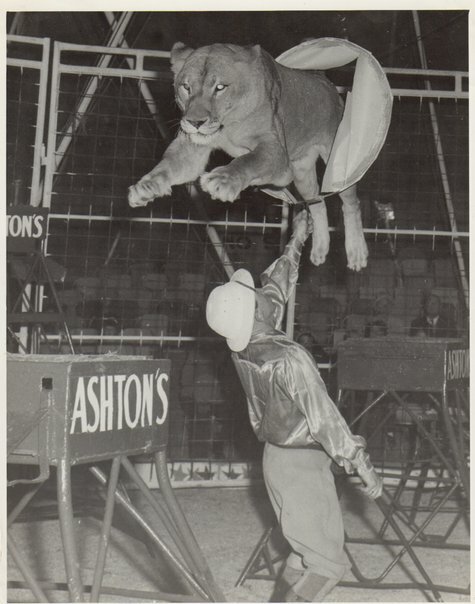 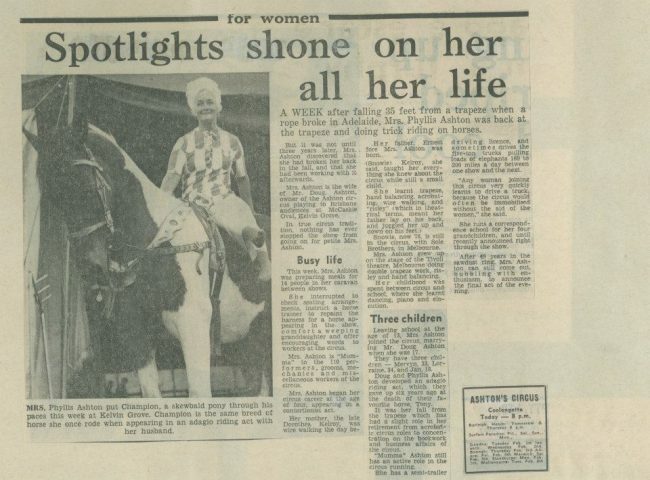 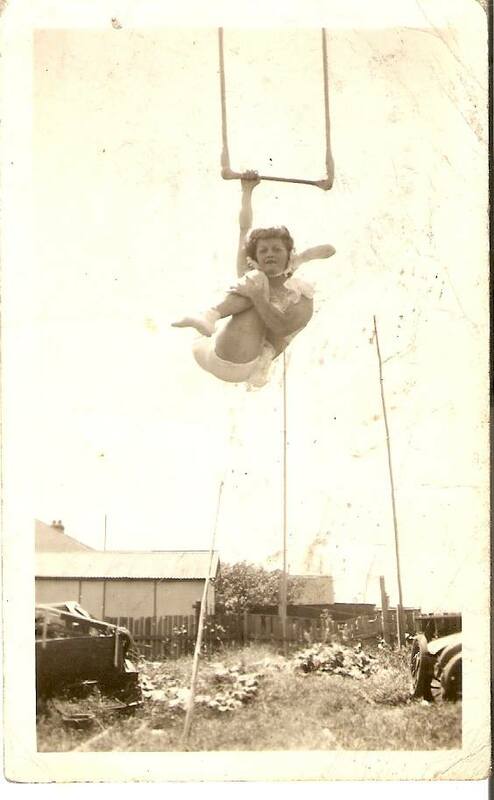 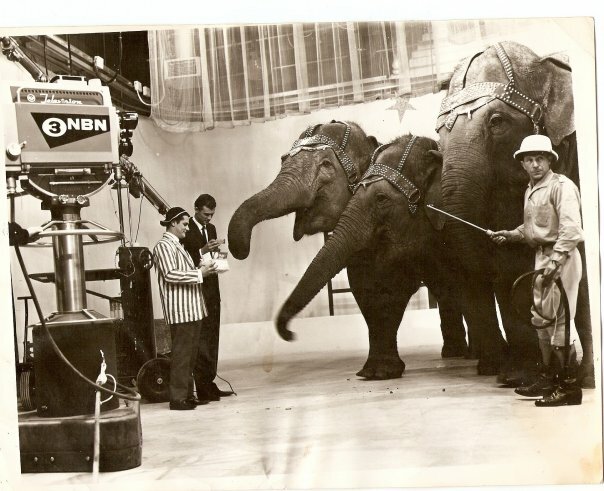 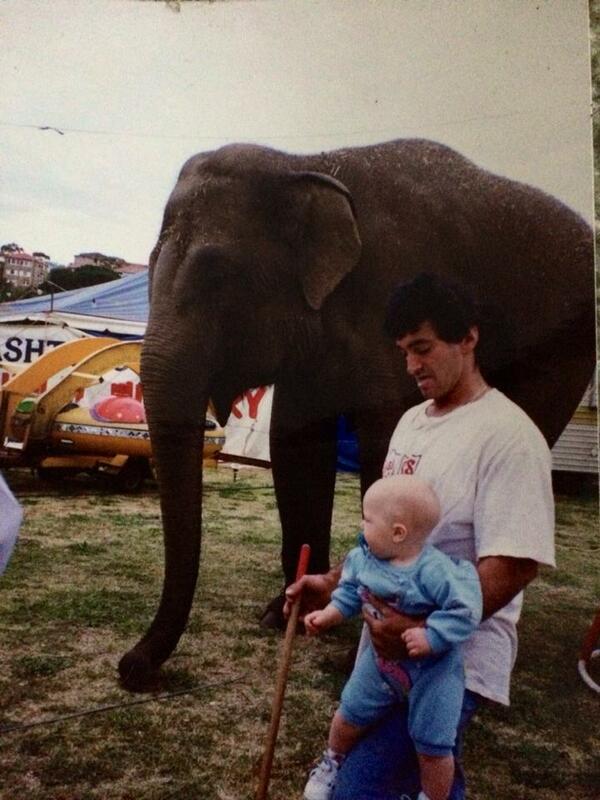 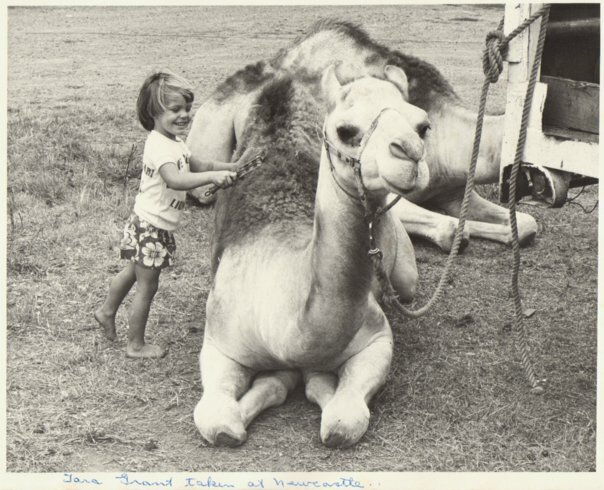 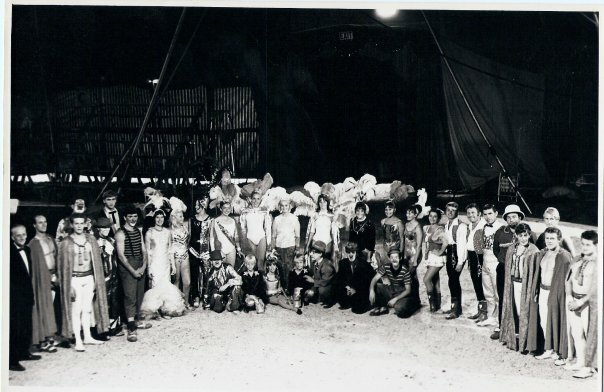 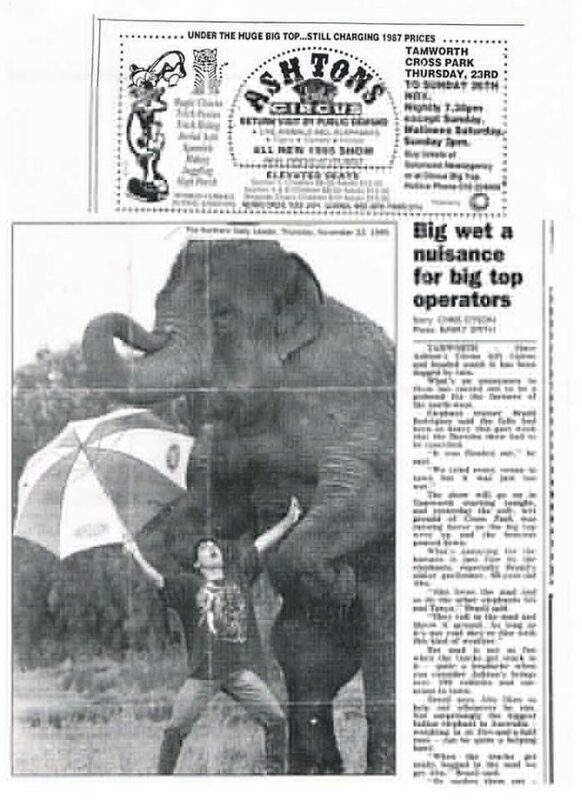 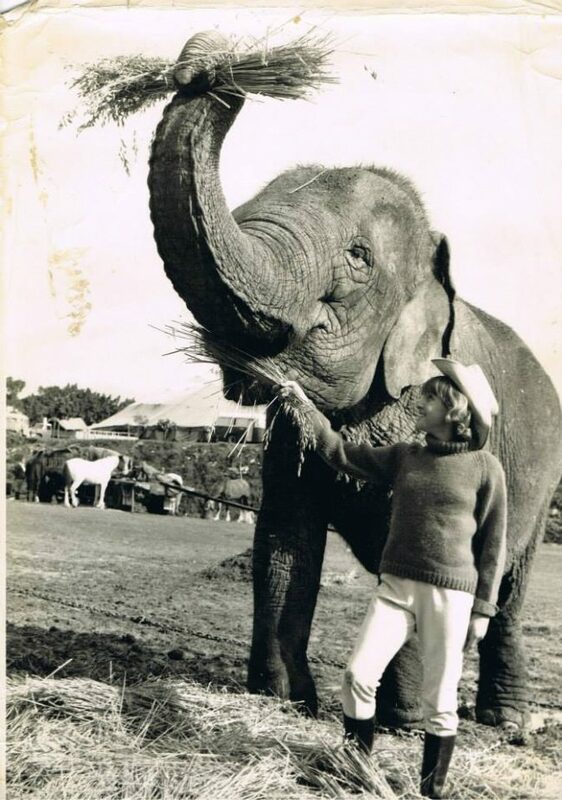 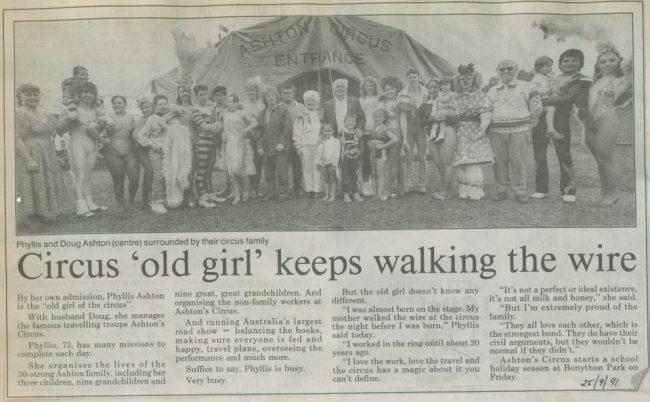 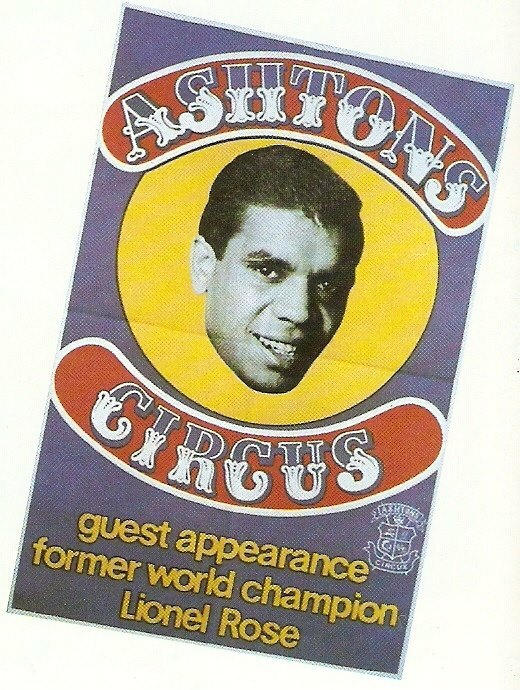 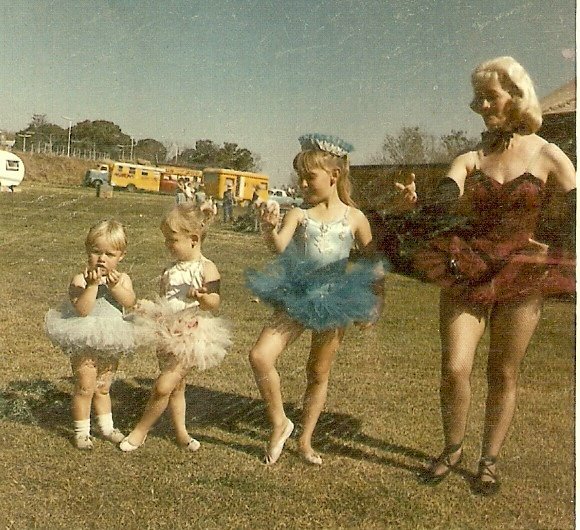 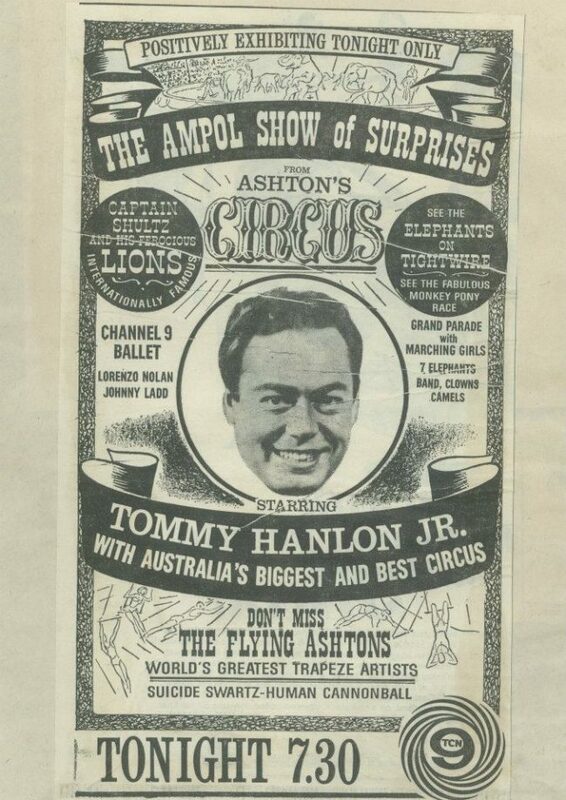 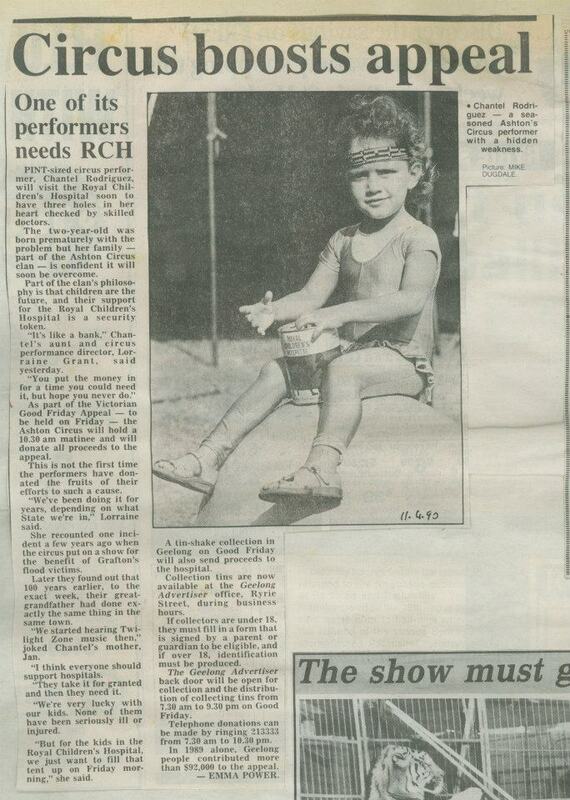 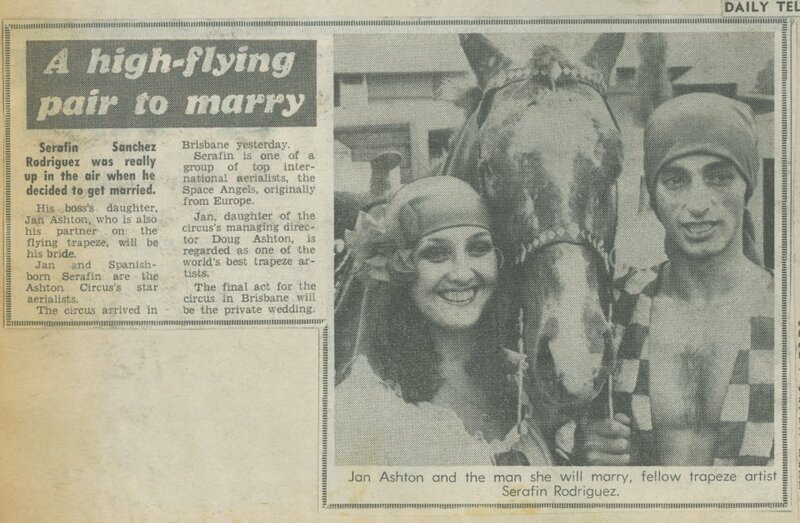 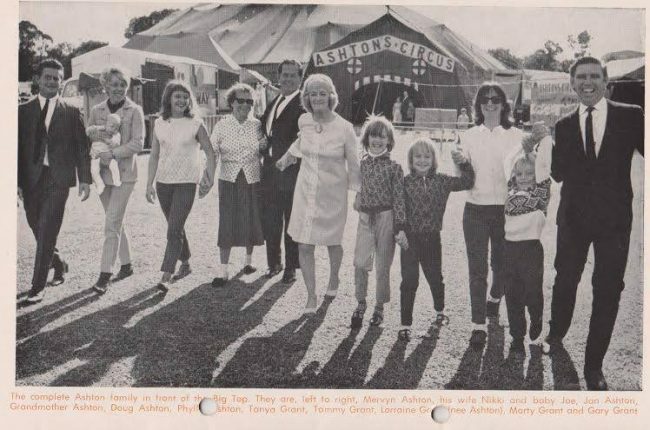 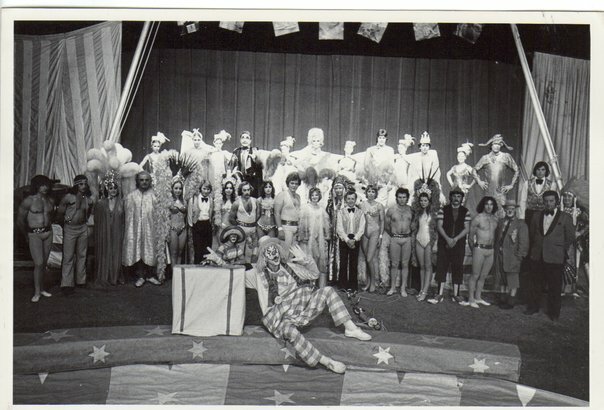 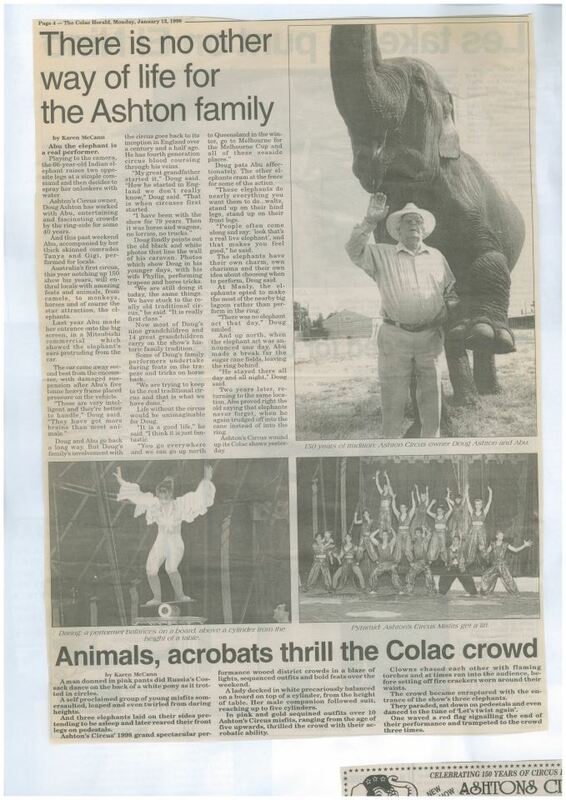 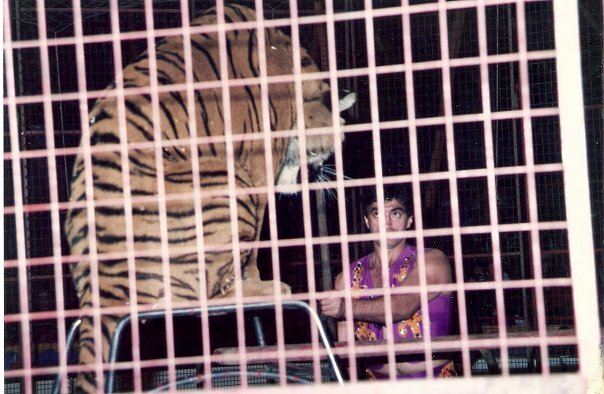 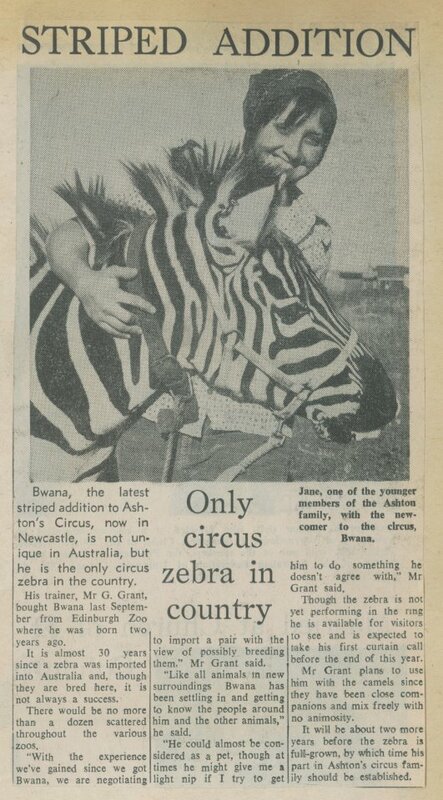 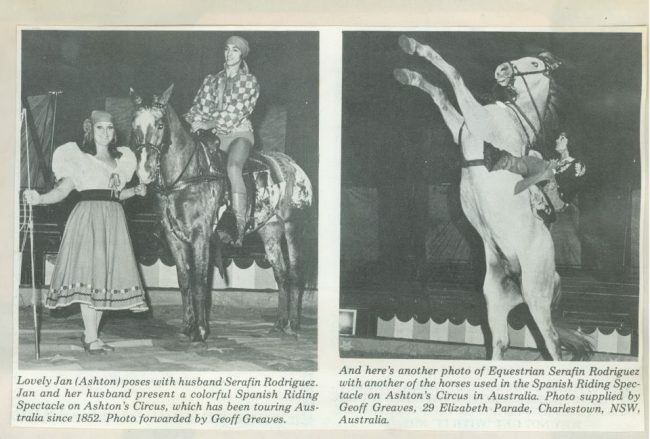 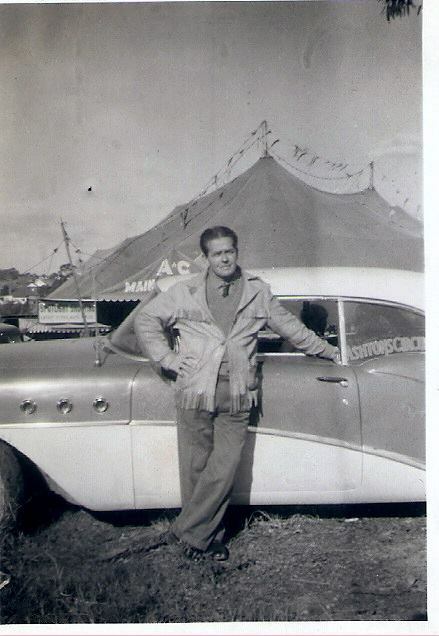 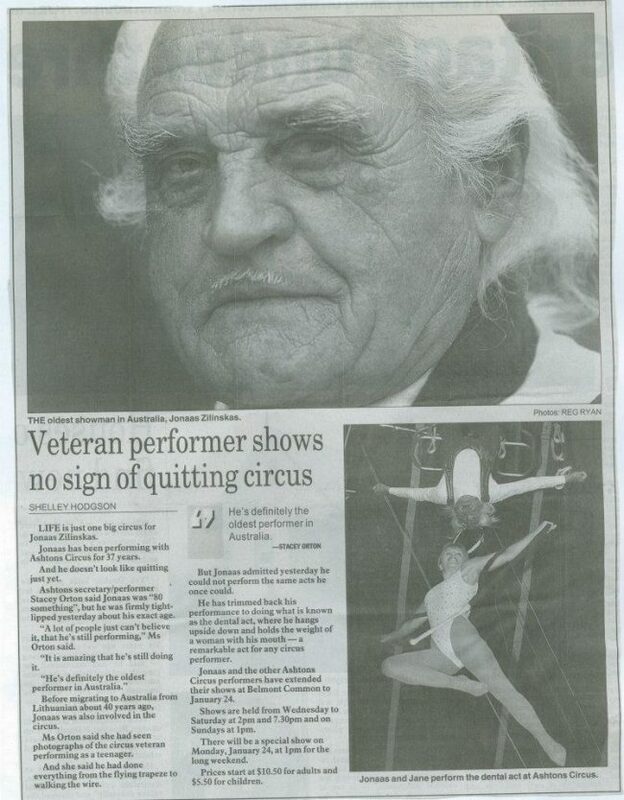 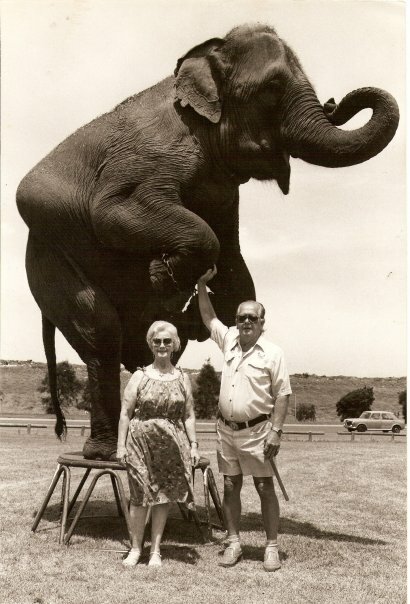 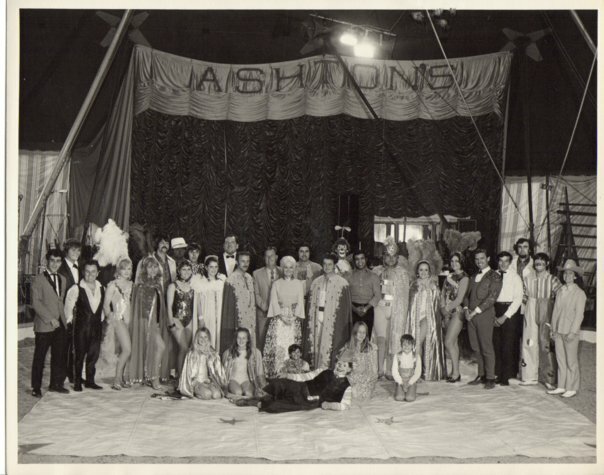 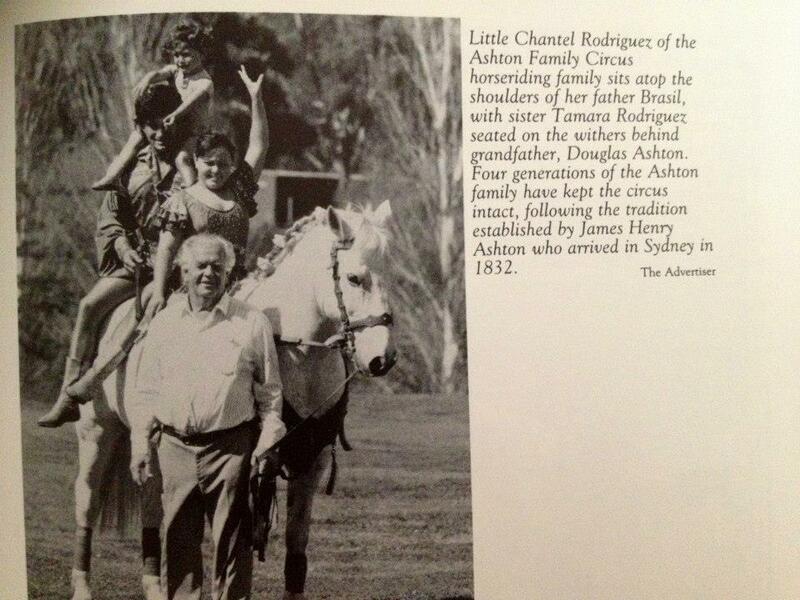 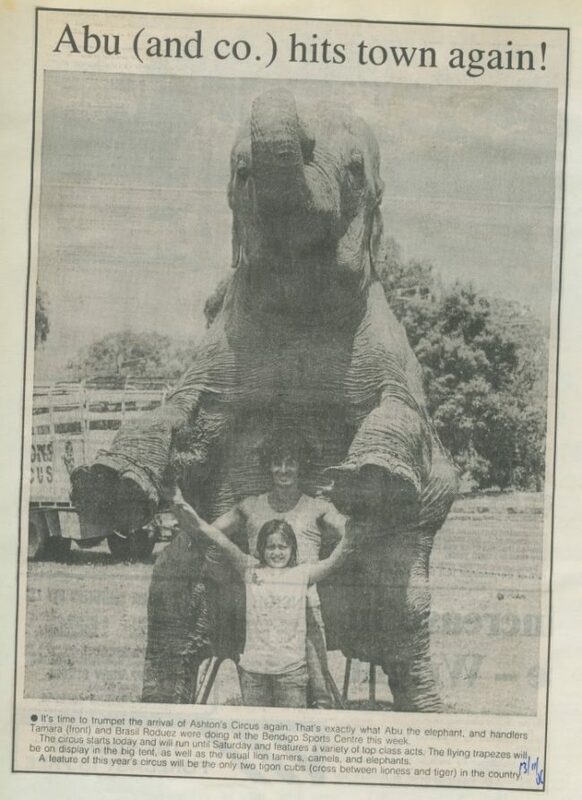 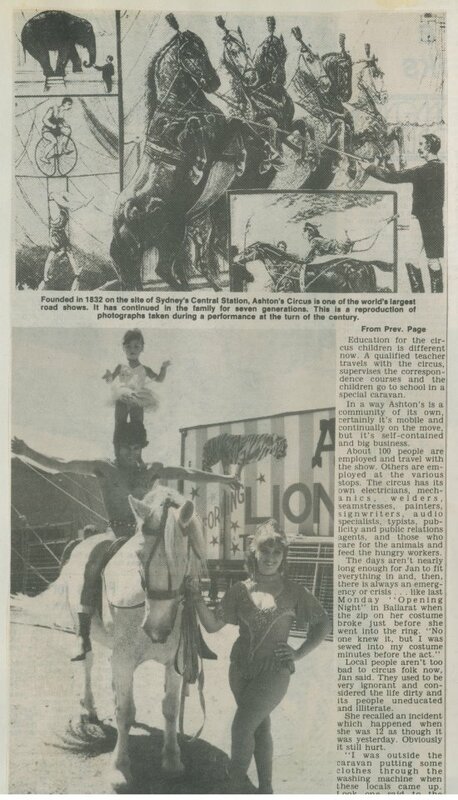 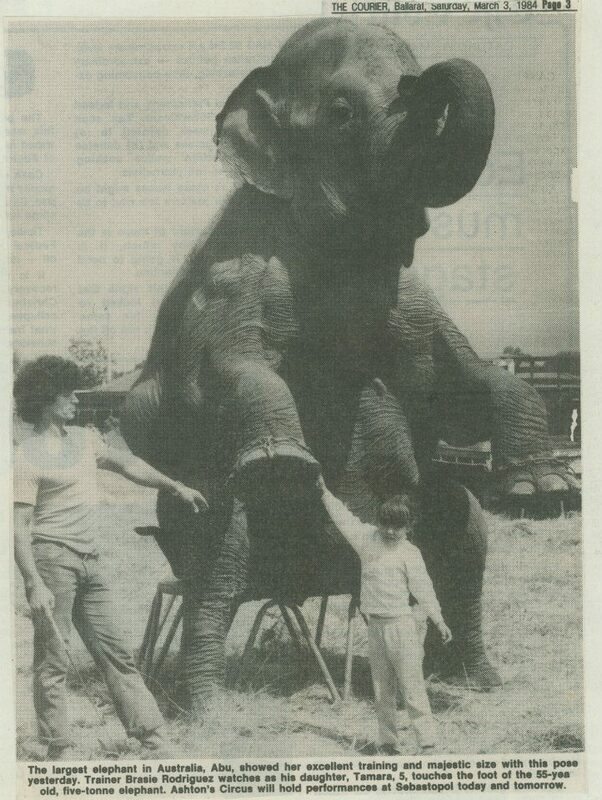 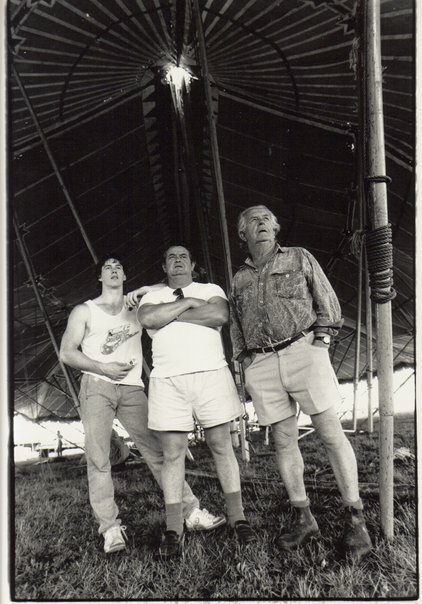 Australian circus and The Ashton Family have grown and changed since the early colonial days of James Henry Ashton; we are enormously proud of our family, our history.